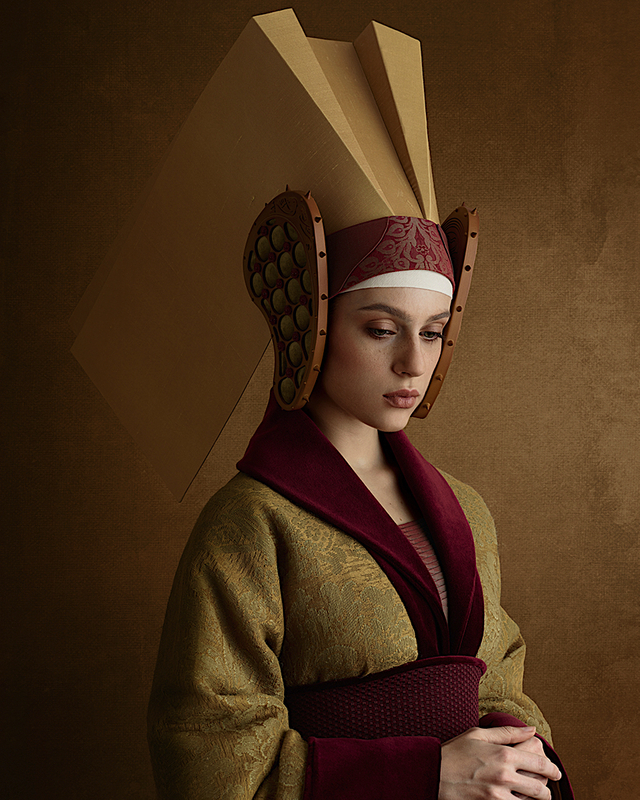 When looking at Christian Tagliavini’s photographs or better described as art pieces, you travel to a different time. 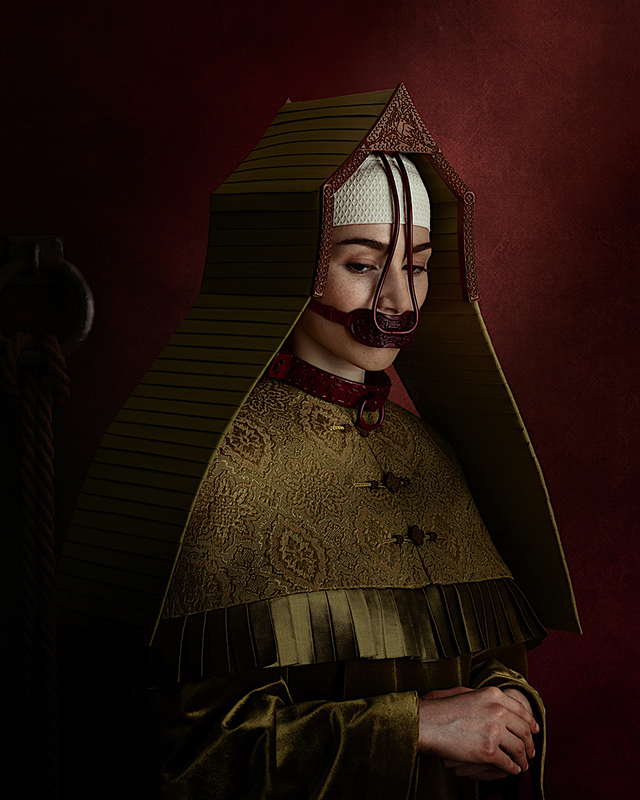 His photographic series so far have explored various historical eras and material manipulations that create a dream like experience by mixing historical elements combined with contemporary aesthetics. 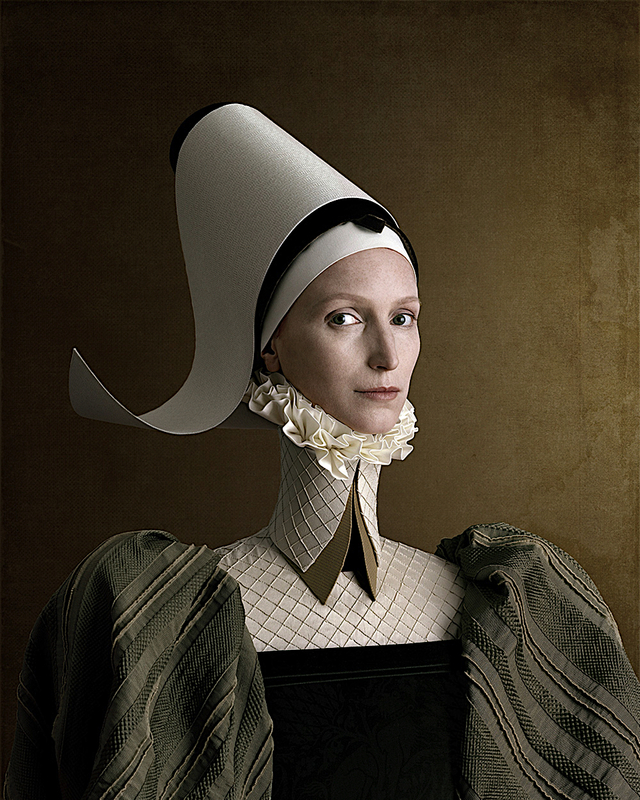 For those traveling to Stockholm should visit the Fotografiska museum where Tagliavini’s work is currently being displayed in a retrospective exhibition entitled ‘The Extraordinary World of Christian Tagliavini’ which is on until the 10th of June. Also teNeues publishing house has recently released a book about his photographic series so far. I was born in Switzerland and grew up between Switzerland and Italy (Parma). I studied technical drawing and worked in architectural and engineering firms. After this experience, I worked also as graphic designer before I discover photography. I’m self-taught and I always need a new challenge to be interested and motivated. What is your starting point behind your work? Where do you source your inspiration from? I’m a visual person, I find inspiration around me or in my memories. The idea comes first, then comes the work of research and studies that takes time and is interesting for me. I learned a lot with photography. How do you manage to marry the craftsmanship of creating a whole set-concept and photographing your work? Photography is the way to frozen the idea that I have in my mind. I want to create the images as I imagine and I need to customize supplies and clothing to have unique images. What is the process of making the set for each photograph? Are there any particular materials you work with? Working on a series includes two steps: the preparation of it and the realisation of it. I can say that the workflow starts with the idea of the project: I make drawings of what I have in mind and I prepare some drafts. Than we do a lot of research (reference, materials, techniques, aesthetics, colours, ...) and we define the "allure", the "feeling" of the series. find the right characters - customize the drawings and define shapes and colours - recover the necessary materials - study and drawing - coordinate the tailoring - testing the realized scenography, objects and dresses - finalize shooting - editing and postproduction - test printing. I like to have control on the image to represent what I have in my mind. I see the image before I shoot. I design and realize all that I can. I use all the skills that I learn in my life. Who are the people behind your images? Do you work closely to create each photograph? My team is a small team: assistant, tailor, make-up artist and sometimes carpenter (depending on dimension of the scenography). For „1503“, me and my assistant realized hats and dresses, for other series we collaborated with seamstress or tailor. Melissanthi Spei is an Athenian born fashion artist. 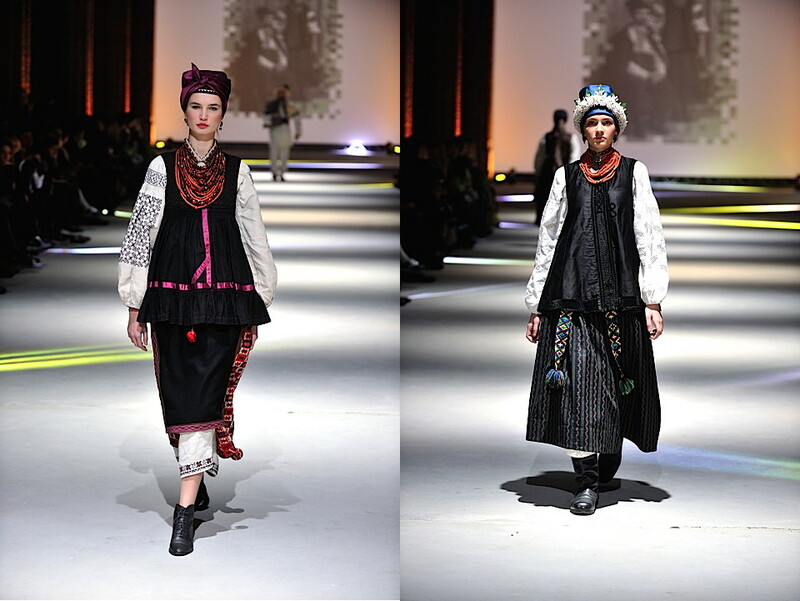 Her heritage in combination with her creativity inspires her to create contemporary and sculptural garments. Part of her identity as a designer is to use industrial materials for something historical and old through the exploration of traditional arts and crafts and their projection to contemporary aesthetics. Melissanthi has taken an interest in exploring different parts of folklore culture around the world and ways to revive them within the fashion context. 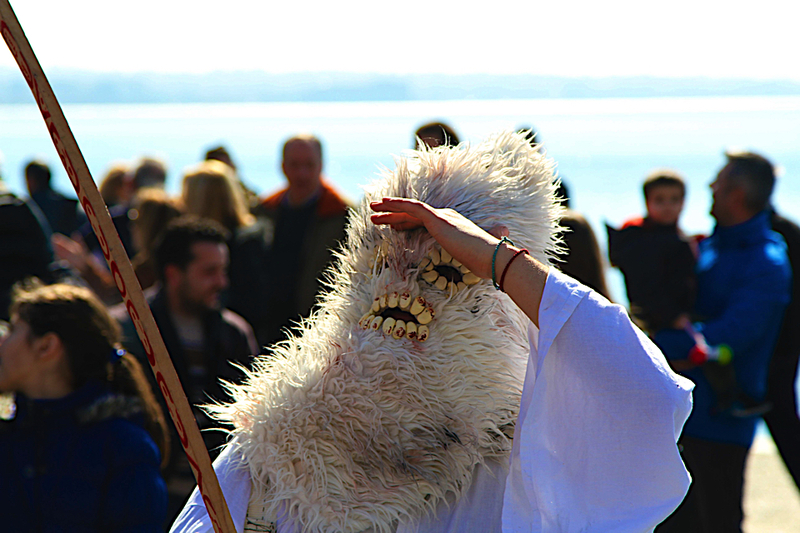 Bell Roads is a festival established in 2014 in Thessaloniki, Greece. It takes place annually during the carnival period through a series of events, exhibitions and performances that brings together performers from all over the country but also has been a destination for other European groups. Talking to the founder, Gianna Evangelidou, we learn more about the future of the festival. When was the festival established and what is the aim behind it? Europe and also scientists/ researchers who have written about these customs. The issues of our research were many, when this custom began, what does it represent, why were the bells used etc. Why did you choose the name Bell Roads? What is it about bells that is so strong and that we meet them almost always in the carnival costumes? The title was chosen because events using the word ‘Roads’ have already created such associations, so when listening to it, everyone realizes that it involves actions with a long geographic and historical path and the creation of a network around it. After all, the bell carrying customs are performed on the road and once a year they meet in Thessaloniki at the Bell Roads. The bells are used as disguises when the custom of the place requires it. The sound of it creates powerful emotions to the bell carriers so they can use them in their rituals in order to disperse the evil and awaken the earth. Which countries does it involve and which are the requirements in order to participate? All the countries of Europe have the right to participate with teams where bell carrying is performed; the only condition in order to participate is good mood! How long does it take for each performer to prepare their outfit and what mental state do they need to be in order to perform? Sometimes they say performers need to reach some kind of ecstasy. 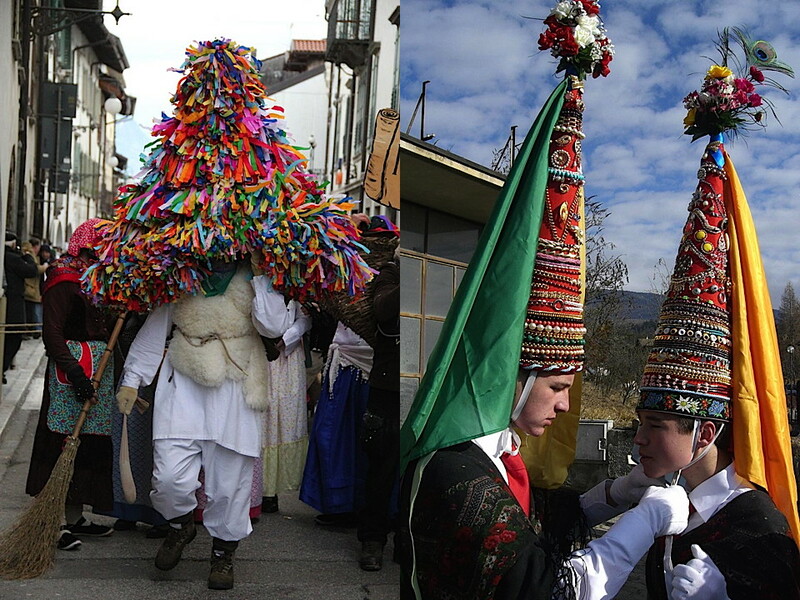 It depends on the costume, for example there is a bell carrier from the region of Drama (Volakas) that it takes up to three hours in order to put together the disguise and to enter the stage of the ritual. The ritual in every case requires a mental preparation; the form it takes is interpreted by everyone in their own way. 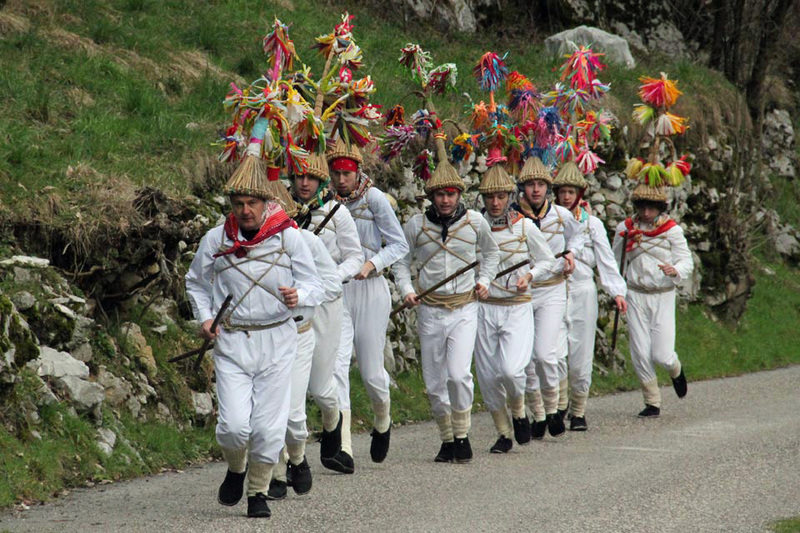 Do you believe folk culture is something fading away or does it evolve and adapt through the times? Tradition is something that is inherited. It depends from the reflexes of each country to evolve or erase that, speaking in regards to Greece this is something that is preserved well. What is next for you? What should we expect for the 2018 edition? 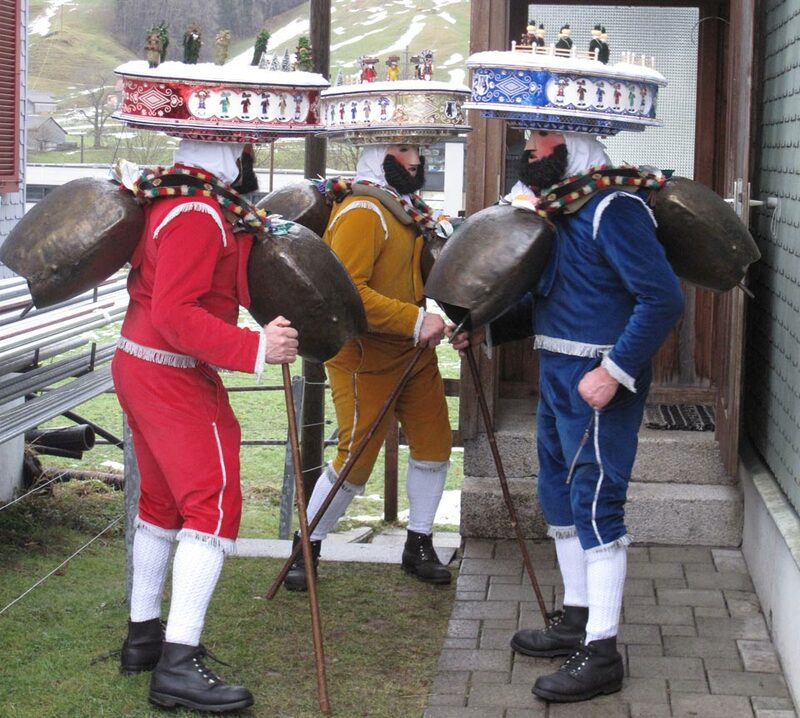 Our aim is through the procession to present to the world the customs of bell carrying through brief performances. One of the main aims of this festival is to make the events of the festival inspire contemporary artists. For 2018, during the parallel events there is a performance entitled ‘with 100 bells’ by Characleia Voutsas, ‘Karagiozis Shadow Theatre’ with Christos Stanisis, educational programs, documentary screenings and photography group exhibitions of around 50 photographers. During the process of development there is a series of 24 paintings by Spartak Paskalevski, who has been exclusively creating artwork for the festival for the past 3 years. On a windy Saturday night I visited the Museum of Witchcraft and Magic in Cornwall for a candle light evening opening. For me it wasn’t just any Saturday but the Black Sabbath or Holy Saturday before Easter Sunday for Orthodox Easter so I decided to skip church and a big feast and go adventurous! Located in the beautiful scenery of Boscastle the museum invites you to explore the history of magic; from storytelling and fairy tales we all heard while we were young to the darker side of witchcraft and the prosecution of witches up to the most recent years. Talking to Simon Costin, director of the Museum of Witchcraft and Magic and also director of the Museum of British Folklore, we learn more about the history of the museum and its future plans. Which areas and eras of British history does the museum research cover? Does it explore other cultures too? 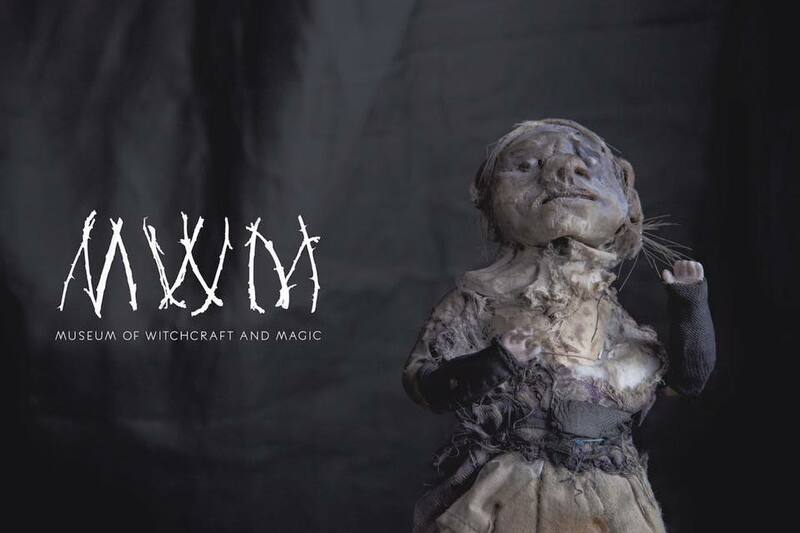 The Museum of Witchcraft and Magic has the largest and most remarkable collection of witchcraft- related objects and books in the world, focusing on an important aspect of British folk and magical culture which has often been overlooked and misunderstood. The Museum of Witchcraft and Magic was founded by Cecil Williamson and first opened in 1951 in Castletown, Isle of Man. After a partnership with Gerald Gardner, one of the originators of Modern Wicca, ended, Williamson decided to move his museum to the mainland. After brief stays in Windsor and Bourton on the Water, the museum finally relocated to Boscastle, Cornwall in 1960. 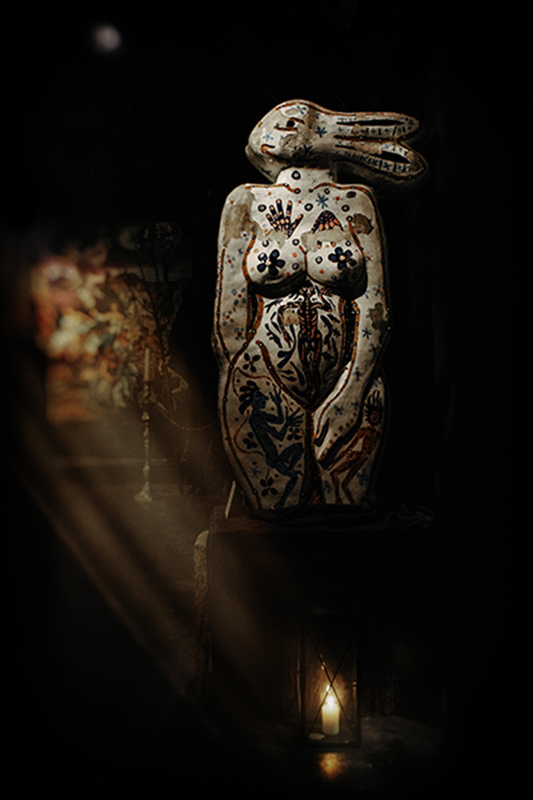 Williamson’s original collection of artefacts can mainly be categorised as ‘folk magic’ – the original incarnation of the Museum was The Folklore Centre of Superstition and Witchcraft – and focused on the ways of the wise woman and cunning man but the museum also housed a wide variety of magical items from various areas of witchcraft and several tableaux, demonstrating ritual practice with a strong element of theatricality. Which artifacts within the museum do you think are the most intricate and fascinating ones and why? I’m very much drawn to the more folk magic related charms and curses. They seem to show an honesty and earthiness that some of the more ceremonial items lack. There’s something very direct and alluring about some of these items. Many involve quite mundane items such as keys and stones, set together with animal bones, feathers, snail shells or dried animal parts themselves. These are objects that we are familiar with but yet they are being used for magical purposes and take on a whole new significance when used magically. They also represent a direct link to both the natural and the spirit world. Is magic role playing or does it represent unknown forces through symbols? Magic is a very difficult thing to define as it has a variety of meanings within different cultures and in different ages. It can be perceived as a means to effect change by the use of ones will, as Aleister Crowley thought or as a way to channel supernatural forces by means of ritual, language and certain actions. The intention of the magical practitioner is always of the utmost importance and if this intention is unclear or too vague, the outcome of a magical act is unlikely to work. Symbols play their part in a lot of magical work as ideas and intentions can be presented in a symbolic way which enables the subconscious to understand them more directly. Does magic exist only in folklore or does it go beyond? Some form of magical practice has existed within every known human culture. The belief that otherworldly powers can be called upon for help is embedded within most religions but where magic differs is that the magical practitioner takes a more active role in tapping into and using that magical energy. In order to practice magic you need to make subtle changes to the way that you perceive the world and having done that, the practise of magic itself will effect further changes within your own psyche. You may start to notice certain correspondences and subtle connections between things, you may become more aware of seasonal changes or the way that people communicate with each other in non verbal ways. Magic is a subtle art and needs to be given much thought and understanding to utilise successfully. Can you comment why people who don't believe in magic use magic? For example wearing a talisman or number 13? The belief that an object, action or circumstance not logically related to a course of events can influence ones life, is widespread. The basic human desire for protection, luck, foretelling the future or preventing sickness has been with us for so long, that totally logical people may find themselves doing things, likes looking for the causes of good or bad luck and using something, even as simple as crossing the fingers, to aid or protect oneself from the perceived causes. It has been said that stress can cause people to become superstitious. People can often be desperate to find reasons for anything negative which happens in their lives and will blame their bad judgements on luck, or the imagined lack of it. One way of trying to impose some sort of order on their world is to help protect themselves by the use of a ‘good luck’ charm or talisman. Imagination is a very important creative element in our lives, how does that combine with magic? Imagination is hugely helpful for any kind of magical working. Creating something is a magical act and without imagination, it is impossible to create. Imagination will help with a huge number of magical procedures and used with a keen sense of intuition, the two can be a powerful combination. Where do you see the museum developing in the future years? Photography by Friends of the Museum Carol Keith and Paul Ferbrache. 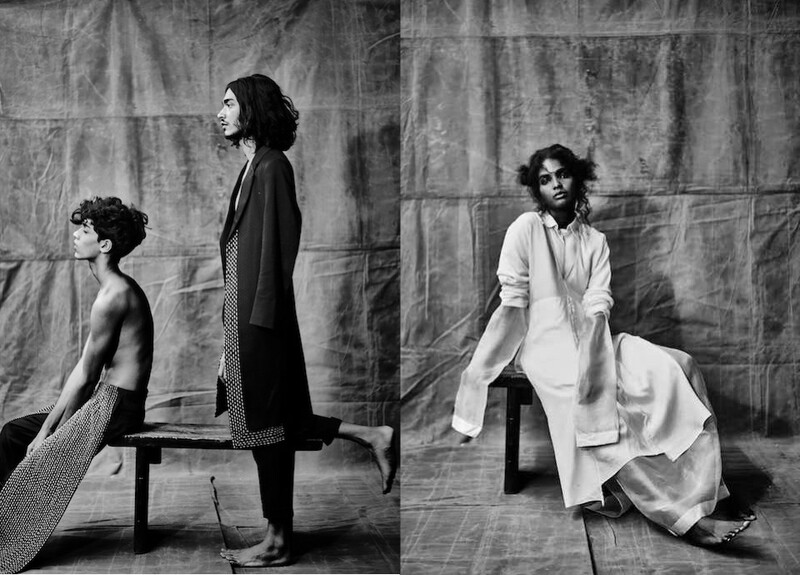 Earlier this year, during London Fashion Week, India won the ‘Best Country Award’ for exhibiting at the International Fashion Showcase in Somerset House. This year’s IFS has been organised in collaboration with The British Council, British Fashion Council as well as with the support of Mercedes-Benz and showcased emerging talent from 26 countries around the world. Presented at the beautiful West Wing of Somerset House, the exhibition had each room representing an installation curated by a different country and for this edition it was exploring the theme of Local/Global. I must say that India caught my eye. It was beautifully executed: people could interact and immediately relate to the exhibit. The whole room exuded a humble yet in depth approach to the vast and varied Indian cultural heritage. The India exhibition was represented by IMG Reliance with the support of 6Degree and Etihad Airways as part of India-UK 2017 Year of Culture which will be followed by numerous cultural events in both countries. 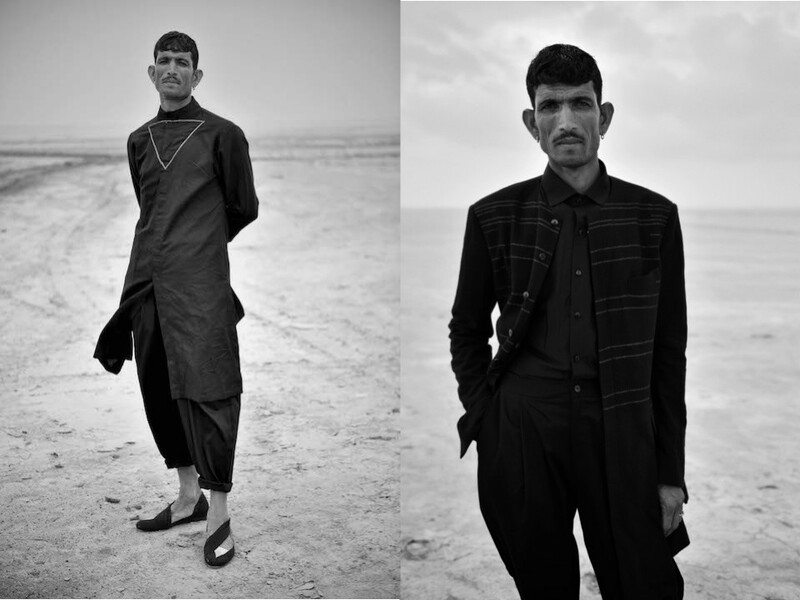 Showcasing the work of five emerging designers who created looks inspired by the concept, you were able to talk to the designers and the IMG Reliance team directly and get a deeper understanding of the story behind which was inspired by ‘The Indian Pastoralists’. Each designer has chosen to draw inspiration by a different nomadic pastoral community and reinterpret their textiles in a more international approach. The five works were: Antar-Agni by Ujjawal Dubey, Ikai by Ragini Ahuja, [KA] [SHA] by Karishma Shahani Khan, Kaleekal by Alan Alexander Kaleekal and PELLA by Priyanka Ella Lorena Lama. 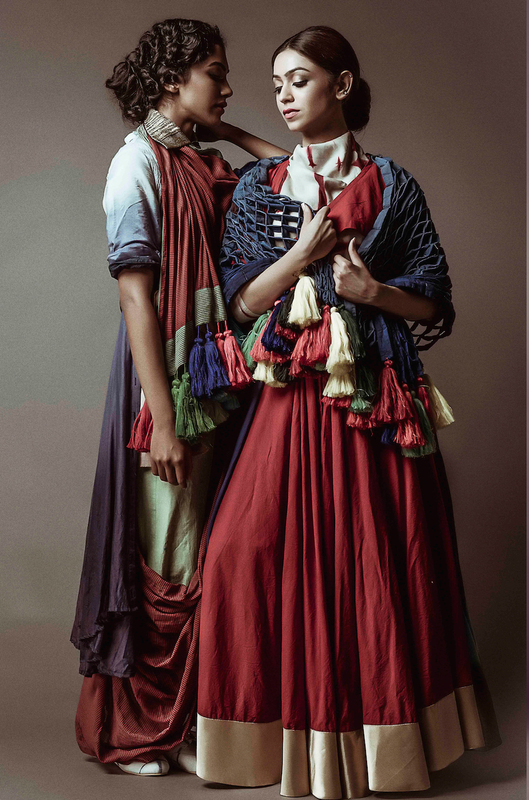 All in all India was a deserving winner and there is still a lot more to expect from the Indian fashion scene as young designers give a lot more emphasis in sustainability and reinventing their heritage in order to communicate it to a global audience. 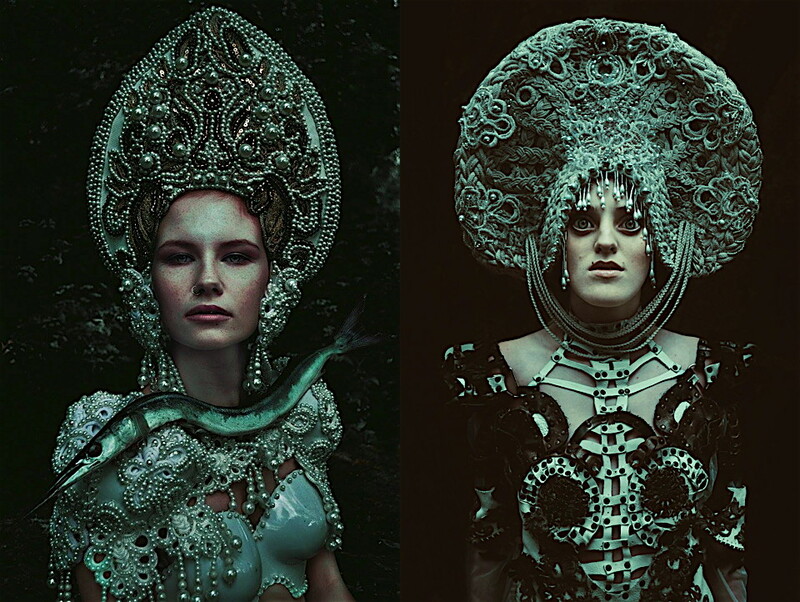 I have recently come across Agnieszka Osipa’s work and I have no words to describe her jaw dropping creations. Portrayed in a dreamlike visual representation, her work lets the myths and folk stories of Baba Yaga and Rusalka come into our minds. Costume can transport us to a different time but Agnieszka’s work can definitely also grasp what the audience needs today. 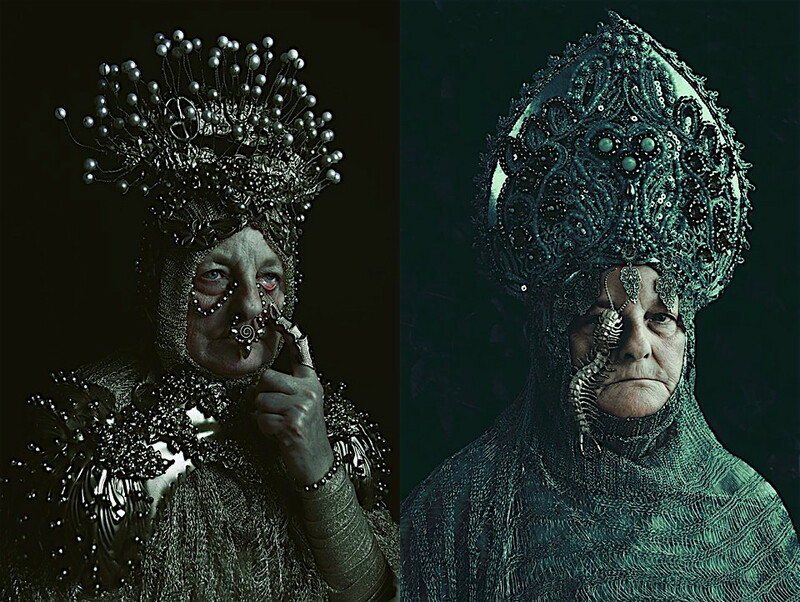 Talking to the Polish costume designer we learn more about her work up to now. Tell me a little bit about yourself and your work, when did it all begin? It all began with my fascination with folklore music back in high school. After one of my teachers advised me to get into clothing design I've tried to incorporate one into another. My route was first the Art High School in Jaroslaw and further in Academy of Fine arts in Lodz in Costume Design specialty. But I was always painting instead of sewing, and always thought this will be my final destination in career. What is the inspiration behind your costumes? 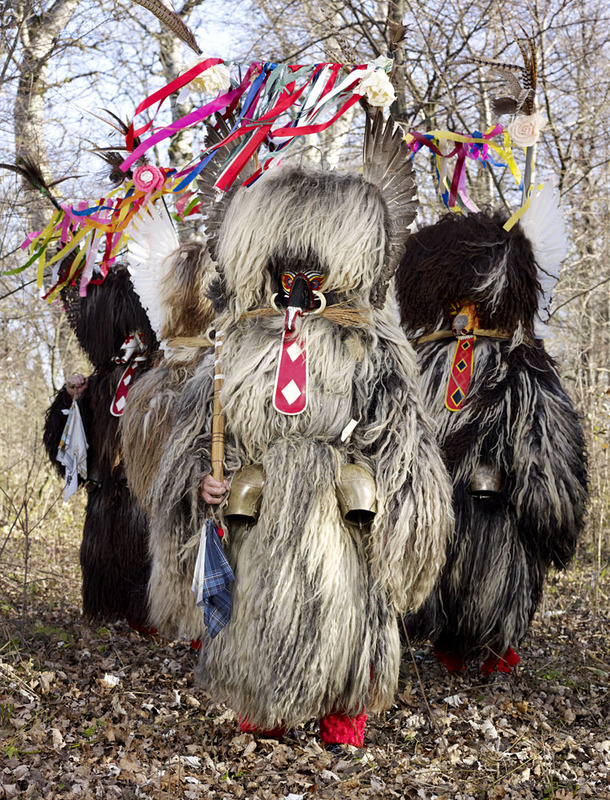 As mentioned before it is folklore music, dark and witchlike aspects of the pagan beliefs and east European culture. Mostly through music. Each piece you create has its own unique embellishment, what are the key material manipulations in your designs? I use many materials so it's truly hard to pinpoint one. I use leather right next to plastic, the materials are not as important as the forms they allow me to create. Your work seems to have a very strong cultural and historical influence. What is it about folklore culture that fascinates you the most? Yes indeed it does, the strongest influences were always musical. The first band to kick me into this vibe was Dakha Brakha from Ukraine and after that many more, like Russian band Svarga, Krynitza, Arkona. I've visited Menuo Juodaragis festival in Lithuania last year and that also was a huge boost in inspiration. Any future work we should expect to see your work? I am not planning on finishing anytime soon, so yes there are many more designs coming up. The main issue is that I have too little time to incorporate all of my ideas, as I make each and every design with my own hands. 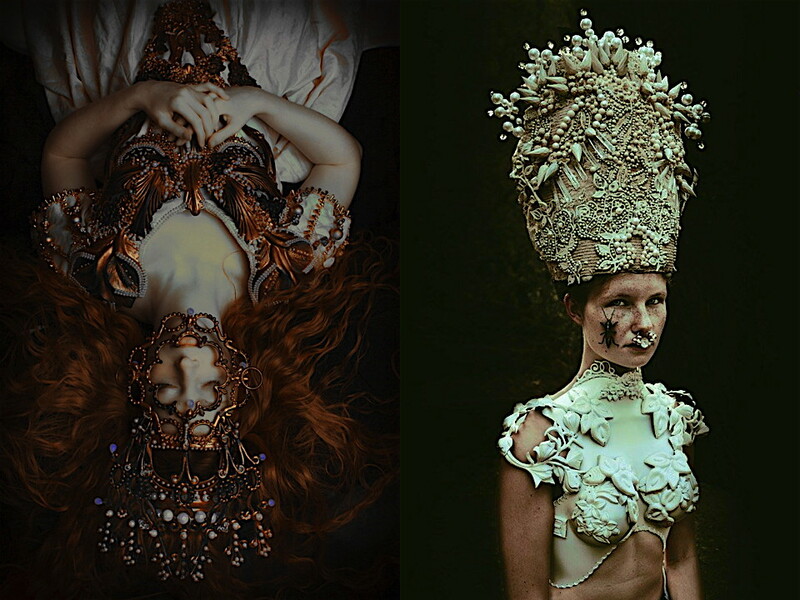 Melissanthi Spei is an Athenian born fashion artist based in London. Her heritage in combination with her creativity inspires her to create contemporary and sculptural garments. Part of her identity as a designer is to use industrial materials for something historical and old through the exploration of traditional arts and crafts and their projection to contemporary aesthetics. Melissanthi has taken an interest in exploring different parts of folklore culture around the world and ways to revive them within the fashion context. 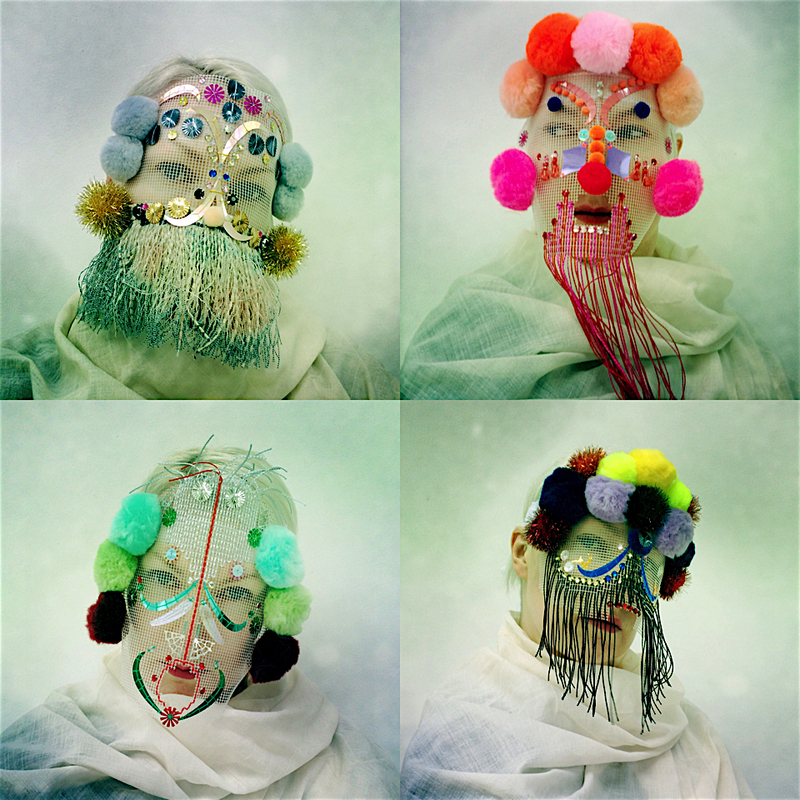 London-based Norwegian artist Magnhild Kennedy aka Damselfrau, who has previously showcased her work through the Fetishism in Fashion exhibition curated by Lidewij Edelkoort, keeps surprising us with new innovative shapes and materials on her main canvas, the human face. Creating a mask is like creating a new character, a veil that allows you to become someone else. Refreshingly unpretentious, a magpie-like eye for beauty leads her work. Talking to her we learn more about the way she works and how material recycling is a key element in her work. Tell me a little bit about yourself and your practice, when did you first come to London? I'm from Trondheim, Norway and moved to London in 2007. I'm self-taught. I have learned most I know from YouTube and trial and error. London has been an integral part of the mask making. I started working with mainly used materials, and here there is a never ending mass of old things to take apart and stuff from all corners of the world. Pretty fantastic, really. 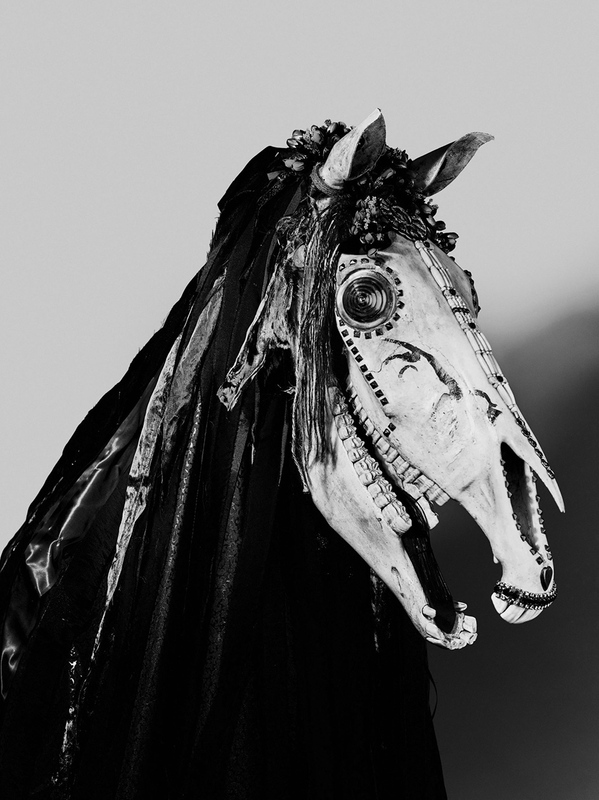 What is your background and how did you become fascinated with masks? I never studied anything that is relevant to the work I do today. When I first moved to London I'd go out to club nights. Full dress-up clubbing. I made masks for an outfit and the format stuck. 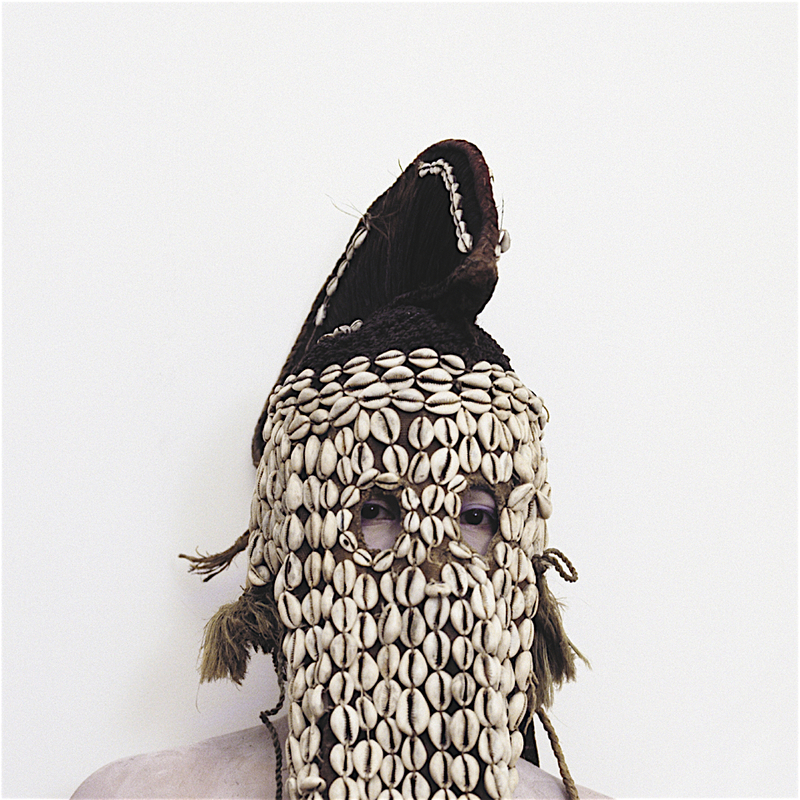 I have never been very interested in masks as category, that has come with the work. I'm still figuring it out, but there is a need for it. People need anonymity and privacy. What is the inspiration behind your work, how do you choose the name for each mask? The material is the initial inspiration. It always starts with a piece of stuff and I let the material lead the process. I try to stay away from any idea of form until it appears whilst making it. I never draw or design anything, really. I stick to that method as I feel like there is a truth to the character that appears. No over thinking. Once the piece is done, I find out what I think it looks like. Then I look whatever it looks like up on Wikipedia, checking it up in different languages, find a word, change some letters so it sits well. Is the piece more an 'O' or a 'T'. Is it you behind the mask in most images? I do photograph all the masks on myself, it makes it a character that I can send out there on the internet. Getting it out there is a big part of it. Let it become a 'someone' that can travel on it's own on Tumblr and Insta. What are the key material manipulations in your work? I work in textile mainly. Mostly basic hand stitching and beading. Your work seems to have a strong cultural influence, is this something you aim to achieve or it is subconsciously done? Any future work or exhibitions we should expect to see your work? I'm working towards my next exhibition in London, some time late next year. Sana Aloui has recently graduated from the School of the Art Institute of Chicago. Her latest collection What Makes An American creates a very sensitive and delicate atmosphere we can all relate to. 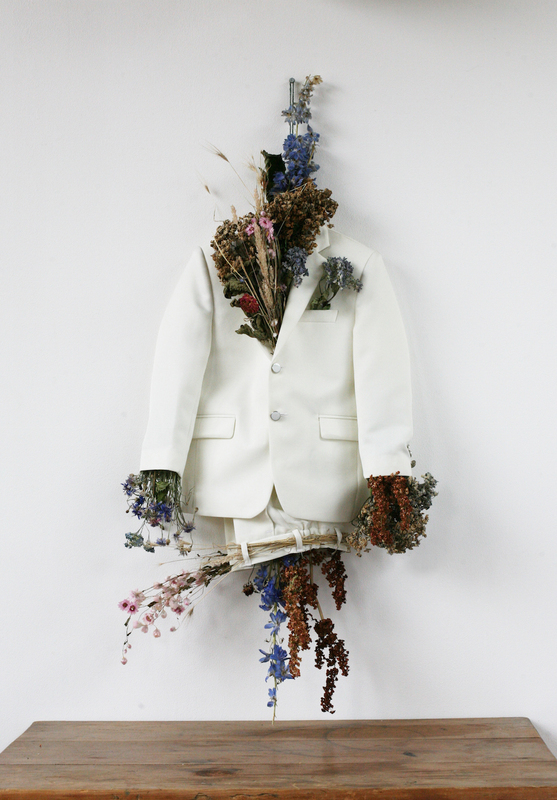 Working with her grandmother for the photographic documentation of her work Sana creates an affectionate presentation of her collection worn by her unlikely muse. Sana has lived in several different countries while growing up and has been influenced by many cultures. 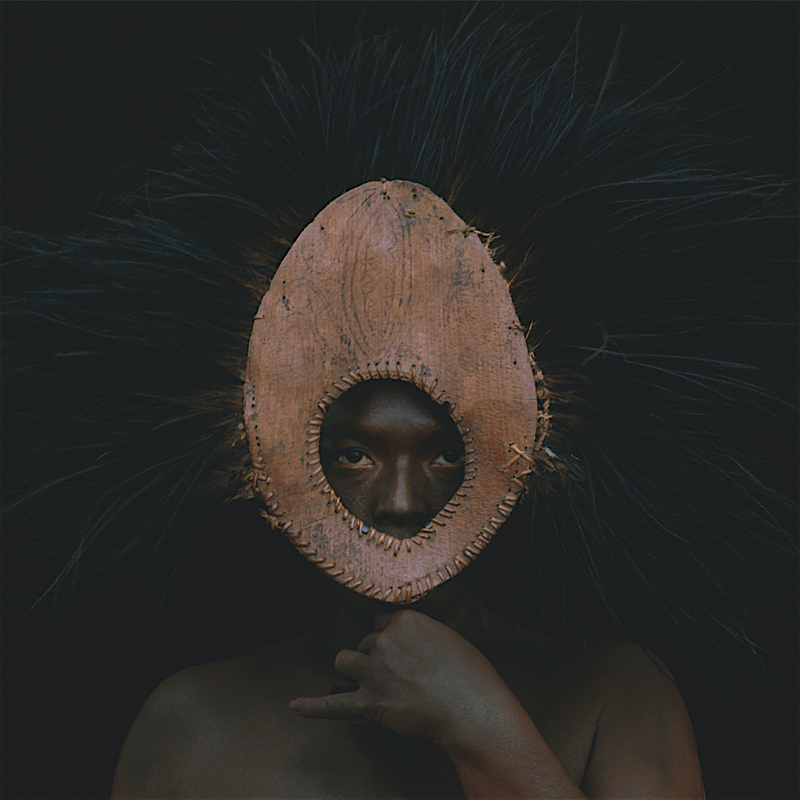 Her latest project is a starting point for exploring her cultural identity. Talking to Sana we learn a lot more about what is behind her work, her material manipulation and her cultural experiences of living overseas. Tell me a little bit about your self. I am a Chinese-Tunisian American, but I consider myself a citizen of the world. My parents work in the Foreign Service so I grew up in The United States, Benin, Macedonia, Egypt, Bangladesh, and Zimbabwe. These places all hold a part of me, but I now call the Bay Area of California home. 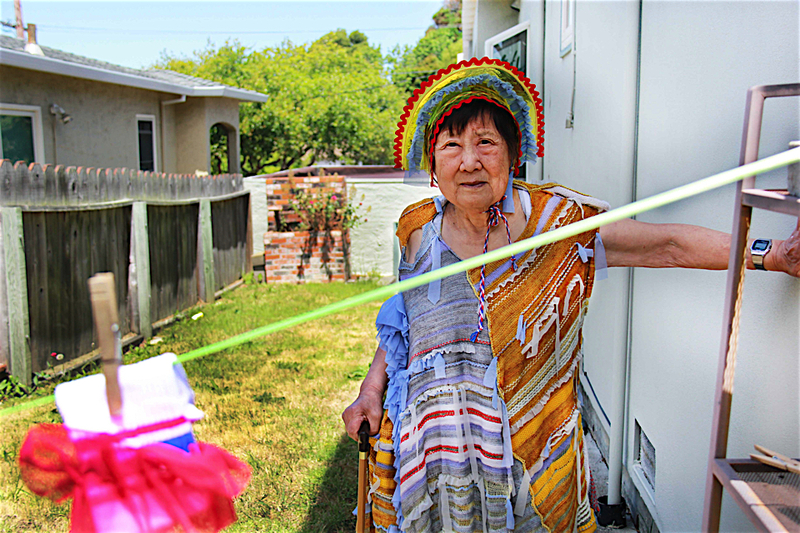 Trips to the bay every summer and visits to my Grandmother became an important connection to my Chinese heritage. 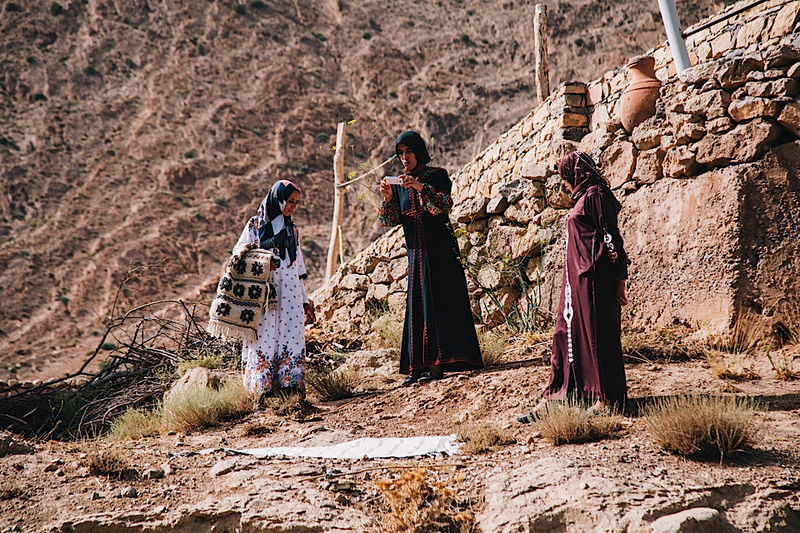 Growing up in diverse international communities gave me a deep sense of responsibility to learn about their textile histories and the talented artisans behind them. When I was in kindergarten I rejected the Land’s End leggings my mom bought me and insisted on wearing bright and frilly sundresses. I was always interested in creating art and gravitated towards expressing identity through dress practice. 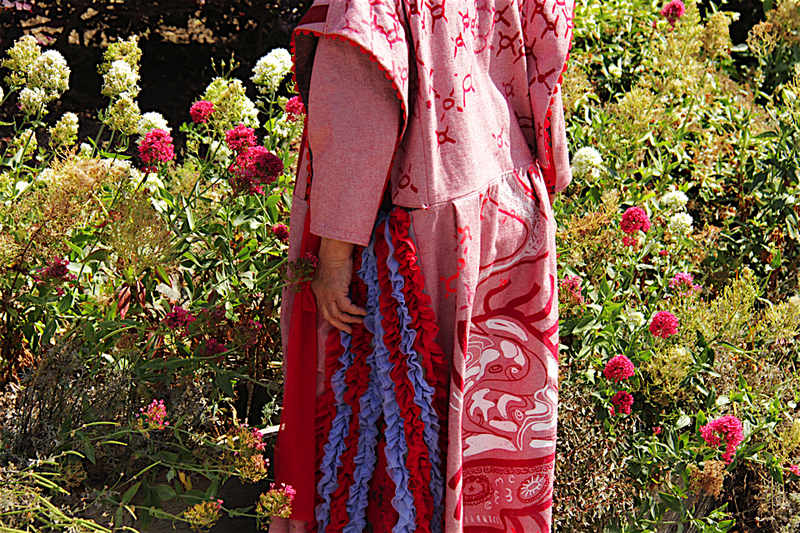 I studied fashion and textile design at the School of the Art Institute of Chicago, where I learned what it means to make clothing and grew my love for creating textiles rich with cultural significance. Chicago was the first place I chose to live as an adult and it was the longest I had lived in the US. I thought I was going home, but found myself disillusioned from the dreamy American vacation of my imagination. It was not a melting pot in which all cultures united in harmony, but a nation constantly questioning the identity of its peoples. I became deeply interested in issues of cultural appropriation, nationality, identity and race in America. What is the inspiration behind your project ‘What Makes an American’? My thesis collection, What Makes an American, arose from meditation on what an American is made of, if anything concrete. 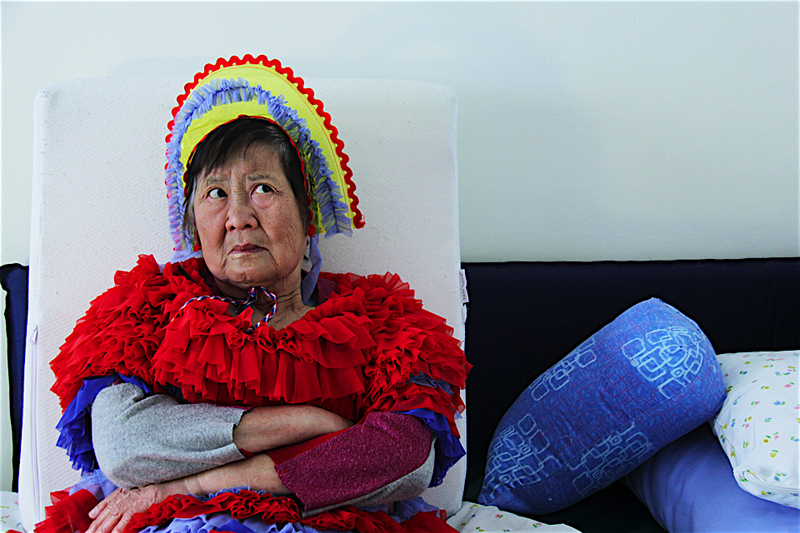 It began with my grandmother, Cheng, a strong-willed Chinese woman who has been living in the United States since 1971. She eats grapes with chopsticks, makes green jello at 1 am, keeps the volume of her Chinese drama shows at intolerable levels, and is thrilled by the four dollar turkey sandwich from Costco. 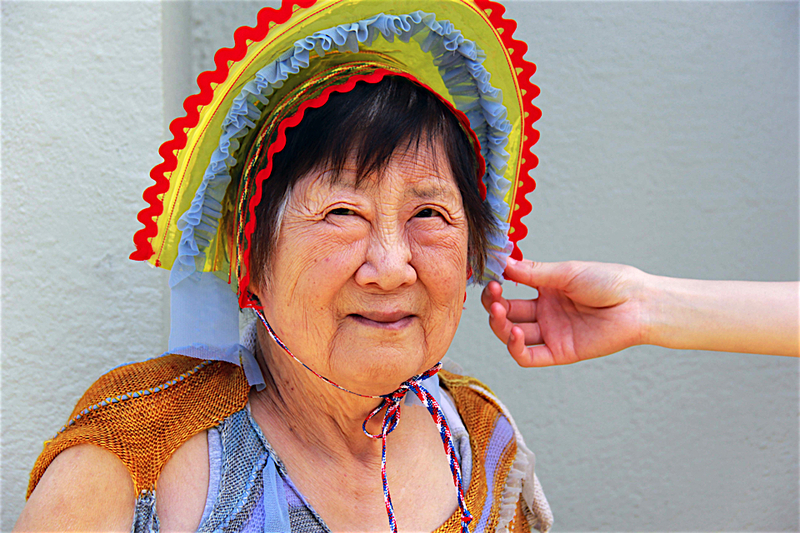 Her homemade food traditions, babaofan and the best pot stickers, are contrasted by new habits, minute-made rice and instant ramen. Her new, old, and truly unique American lifestyle inspired me to think of this project not as a means to find definitions or separate one identity from another, but as a celebration of a new kind of Americana. I found further inspiration in family photos of my grandmother and aunts from the 70’s and 80’s when they were young and living in the United States. There was an irresistibly charming quality to their thrift store clothing, paper mache creatures, and fishing trips. Many of the garments in the collection began with my manipulation of American classics like denim jackets and jeans. Through these histories and family traditions I began crafting a way for myself to relate to an American identity. The photo documentation for What Makes an American began as a collaboration with my sister, Ranya Aloui, and my Grandmother, but took on a new life of its own. We were invested in showing my Grandmother in the spaces she lives, at her desk, in the garden and her bathroom. It became about creating a portrait of her, a strong Asian-American woman, and being empowered by the magical world we found in everyday spaces. I work intimately with textiles, which is often the source of inspiration for larger pieces. For this body of work I made many paintings with gouache and watercolor, as well as drawings that I transformed into screen-prints. One print of a Chinese soup bowl became a wonderful symbol for my Grandmother’s culinary traditions and for the illusion of the American melting pot. I created all the knitwear by hand on a manual knitting machine. 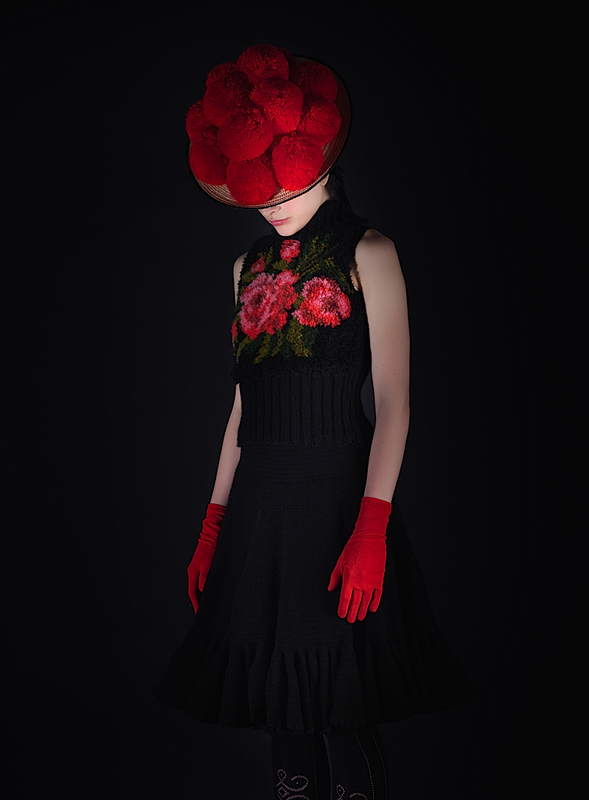 Knitwear makes up more than half of the collection and was essential in expressing an intuitive process of creation. Much like integrating into a new place, the process was at times technical and intense, and at others free flowing and instinctive. I became fascinated with the aesthetic of the Fourth of July, streamers, fireworks, and festoons, and loved thinking of the red and blue ruffle dress as a huge celebration cake. How strongly connected you feel with your roots? I believe the ideas of home and where I came from are fundamental in my work. As I learn, investigate new things, and create, I have the ability to gain insight into the past and transform my understanding of self. Have you explored different cultures through your design development? I am very fortunate to have traveled so much in my life thus far because it may give me ideas to explore for years to come! Early in school I investigated the Ndebele peoples of South Africa and Zimbabwe as I sought to relate further to the place where I graduated from high school. 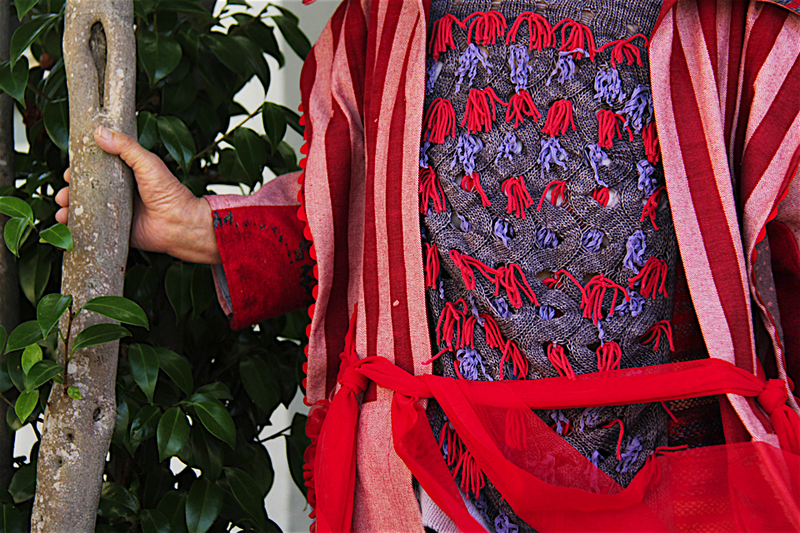 In honor of the intricate geometric patterns and shapes of their beautiful art and traditional dress, I created two dyed and hand woven garments with beading designs. Seeking to explore my traveled childhood I later created a three-look collection that explores nomadic sensibilities, feeling in between places, cultural histories, and identities. Textile and material histories as well as cultural understandings are a huge source of inspiration in my work. Two years ago I had the wonderful experience of traveling to Fujino, Japan to study traditional indigo dyeing and katazome printing. The adventure left me with a great appreciation and sense of respect for textile traditions and the art of making things by hand. I have several new concepts in development and am excited to continue this exploration outside of school. Please keep an eye on my website and Instagram for coming interviews and project details! 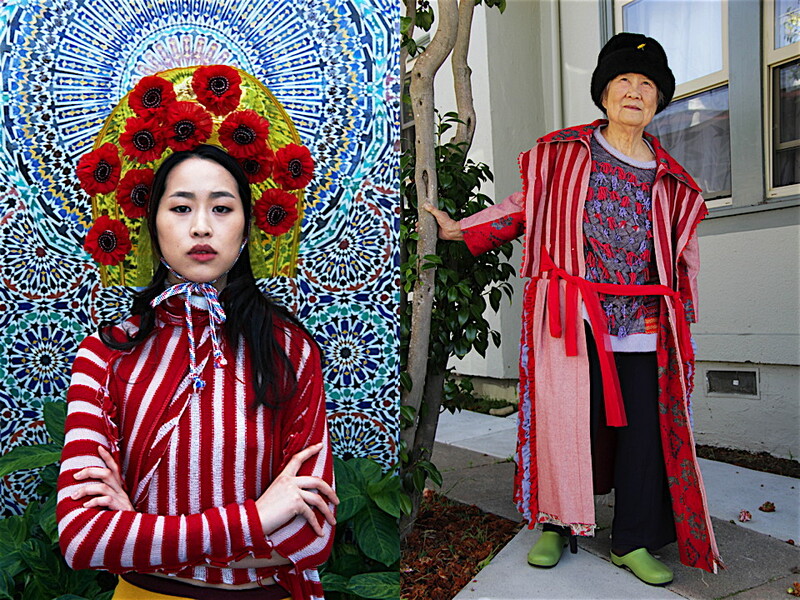 "All the photos of my grandmother, Cheng Borchert, were taken by my sister Ranya Aloui as a collaborative project directed by myself. The photos of the younger woman, Stephany Lee, were taken by the photographer Marc Moran." 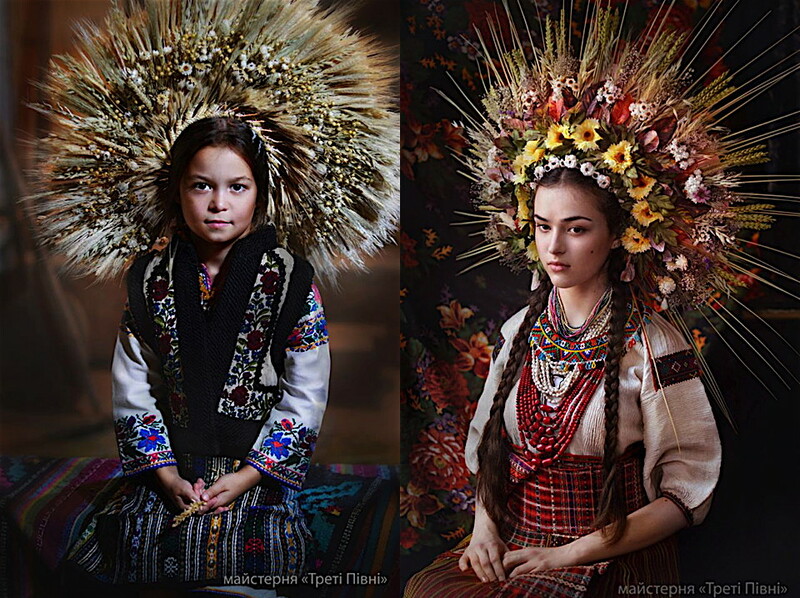 The vinok is a traditional Ukrainian flower crown worn by girls who were eligible for marriage. 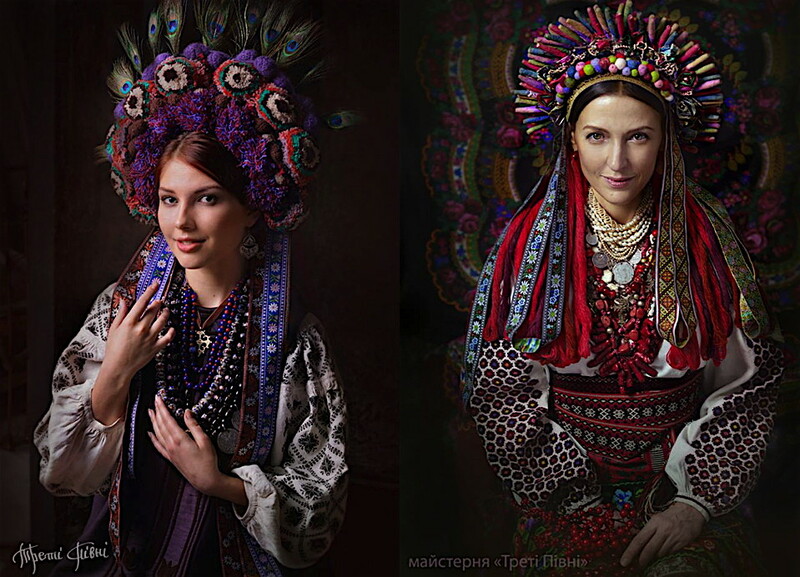 Young women throughout the country use to wear various headdresses of yarn, ribbon, coins, feathers and grasses. 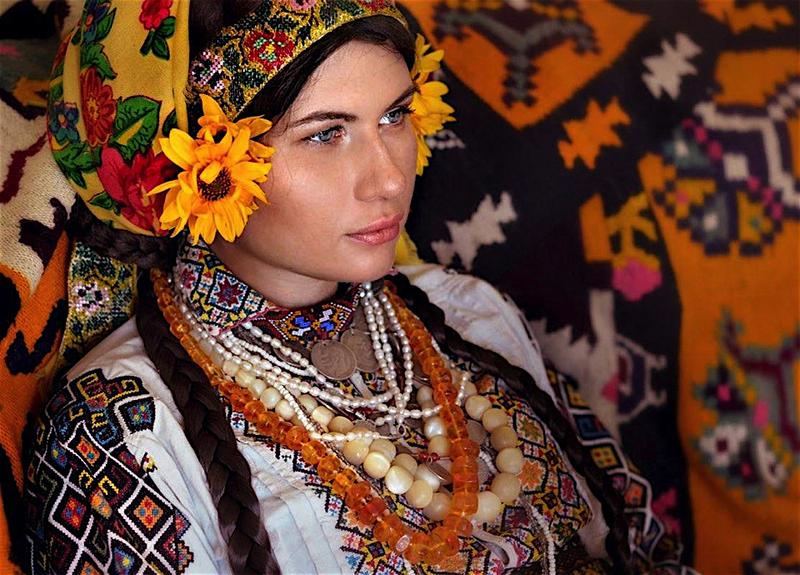 Today, this flower wreath remains a part of the Ukrainian national attire, and is worn on festive occasions and on holy days. The vinok has a significant symbolic value and only specific flowers were traditionally used. 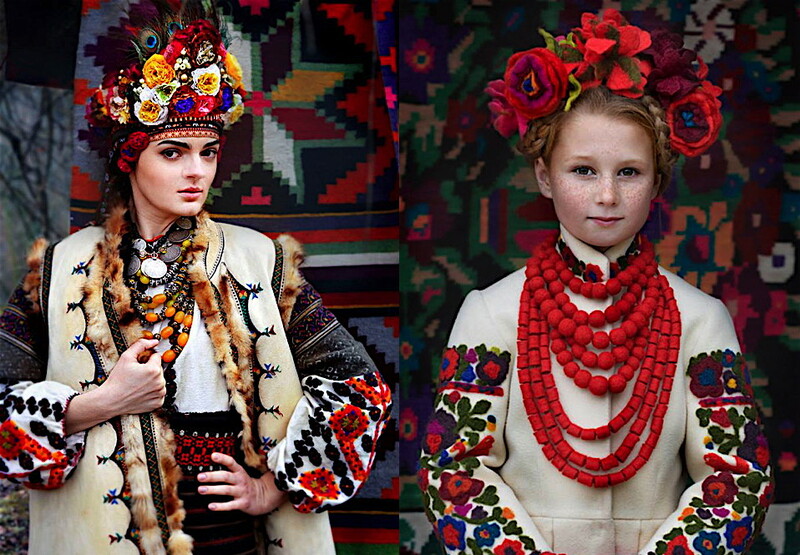 The wreath is also different depending from which area of Ukraine the young women is from. The flowers used to make the wreath are generally fresh, paper or waxen and attached on a band of paper covered with a ribbon. In summer and spring, the wreaths are made from fresh flowers, in winter from paper and ribbons. Each flower has a particular symbolism; the colours of the ribbons would also be chosen to represent emotions. 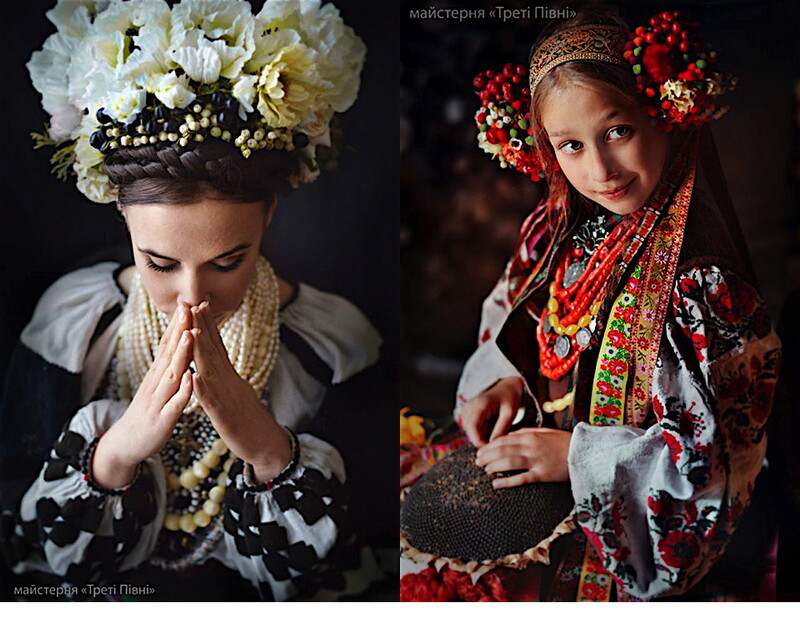 In 2014, after the revolution, the Ukrainian symbols were very popular and progressively the vinok is becoming part of the daily life. Its growing popularity has contributed to the increase of vinok specialists, as well as the demand of local florists to create garlands. 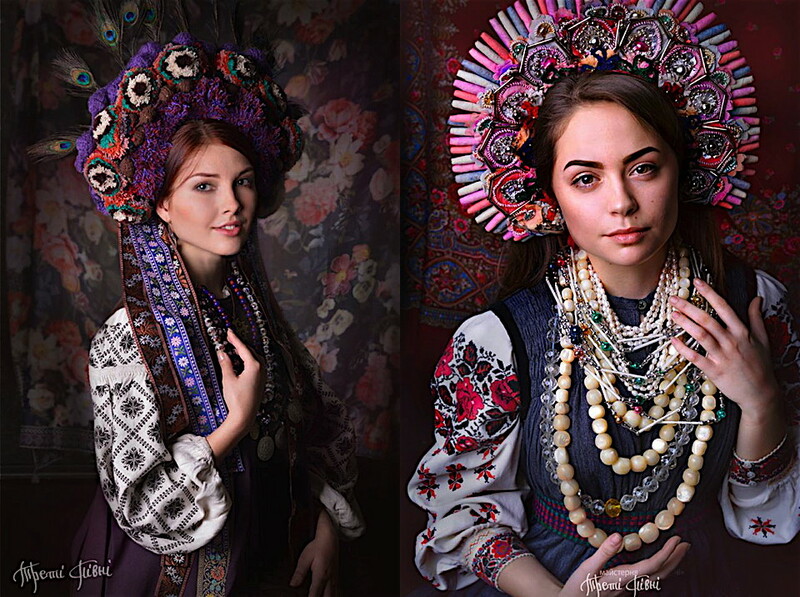 Today, the wreaths are worn also on a more casual basis and are sold all across Ukraine. Workshop "Treti Pivni" (translated by "Third Rooster") is a team of photographers, stylists and makeup artists united by the love for Ukraine and the desire to open the world to the beauty and uniqueness of their culture. 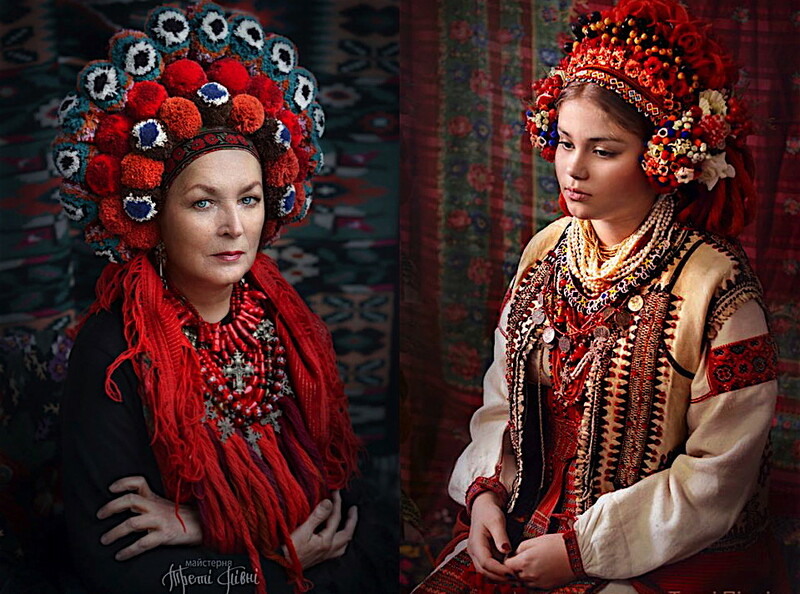 Through their photographies they promote the richness of the tradition and this particular national pride symbol. Recently, the vinok has gained an international attention with its particular symbolic beauty. Its influence is part of a lot of summertime fetes and of fashionable runway like the Comme des Garçons Homme Plus men’s Spring 2016 show titled “Armour of Peace" where models worn poetic botanical crowns. 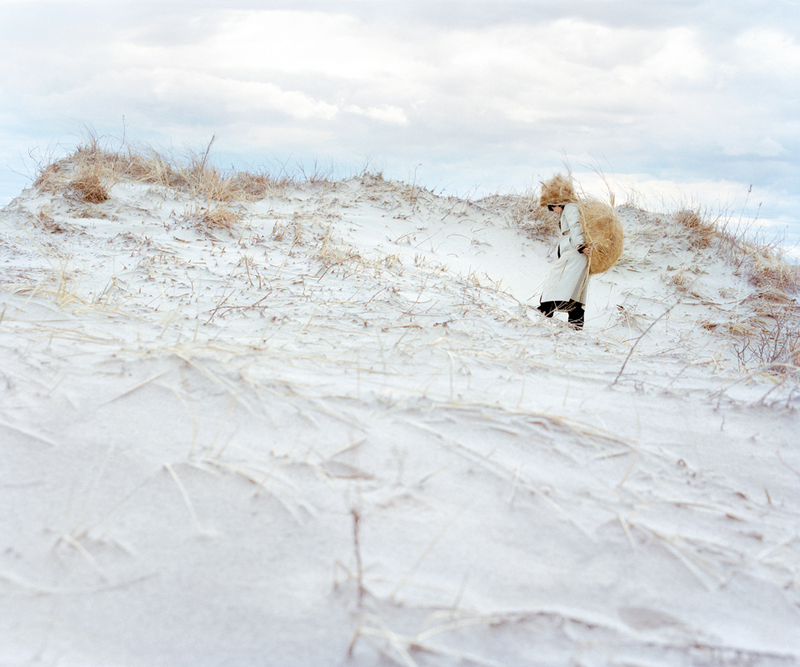 Kimiko Yoshida’s work has been an inspiration to me for many years. 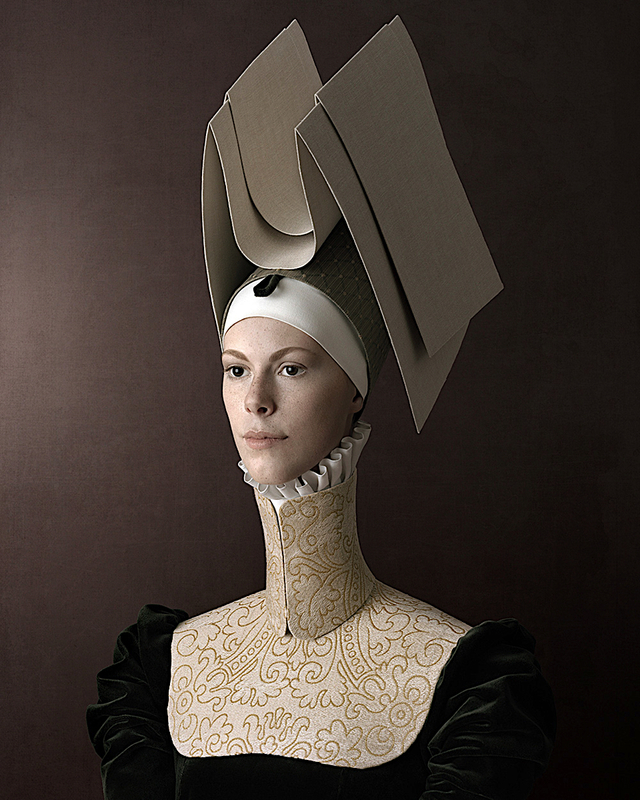 Working with contemporary and historical pieces she creates self-portraits that transport you through time. 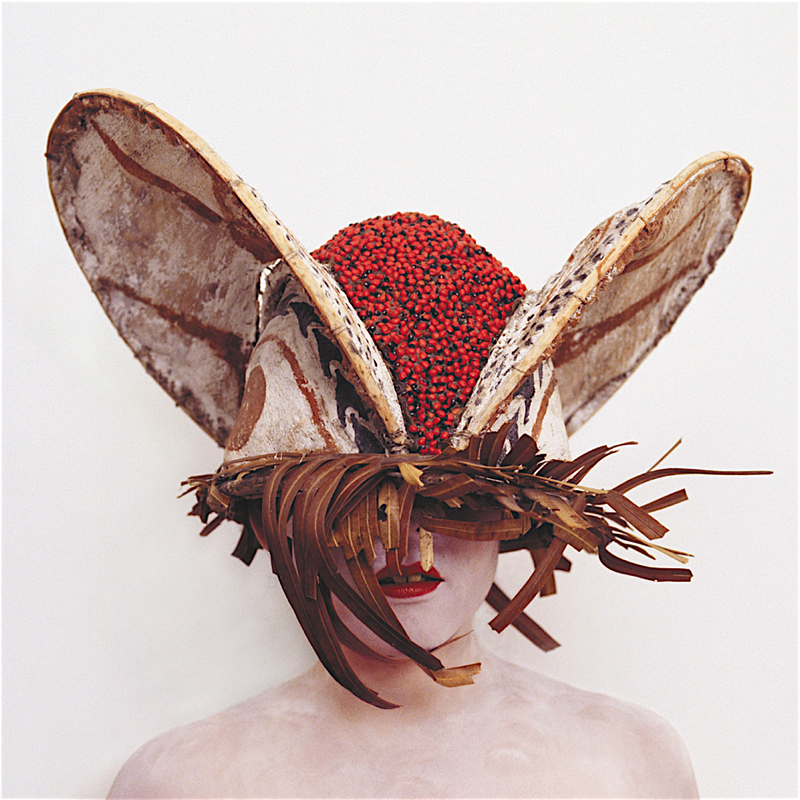 In her self-portrait series she uses her body as the canvas for each representation of her idea. Yet this body it is not really hers anymore, it is a ‘ceremony of disappearance’. There is no digital editing of her images, only make up and direct shooting. Her preparation for each photograph is a transition towards becoming nothing. This is also her signature, using the same lighting, setting and framing, and always using herself as the person behind each portrait. 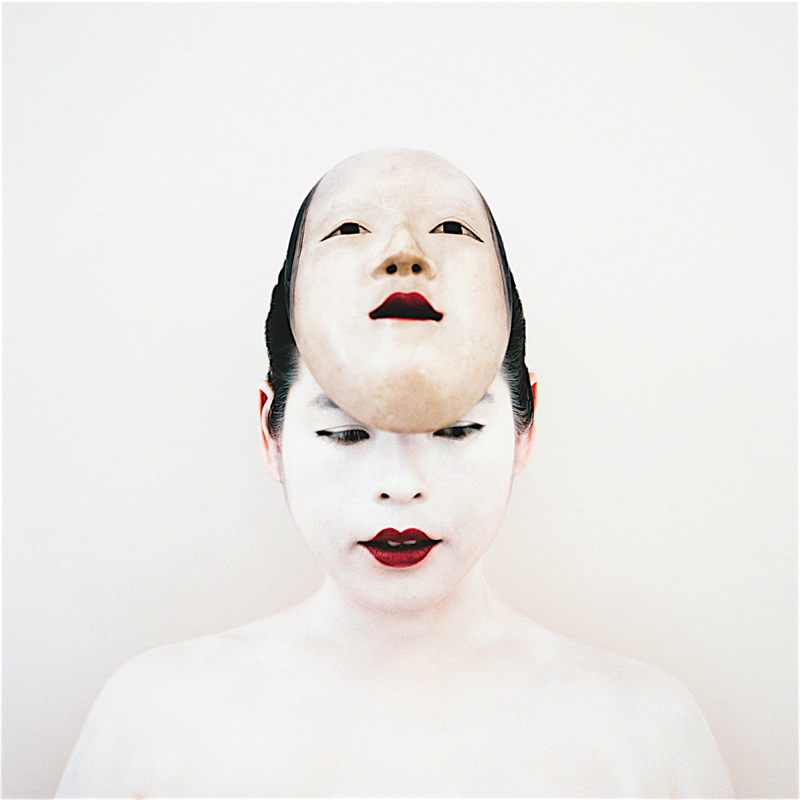 Kimiko appears as a woman in her portraits, she blends in with the background, merely being the supporting element rather than the centre of attention and the make-up is used to make her disappear rather than stand out. This is a metamorphosis creating a universal and timeless quality; the portraits will remain the same through the passage of time. Kimiko was born in Tokyo where she also grew up, later on in her life she moved to France. This gave her the chance to be reborn and understand a different way of thinking and perceiving. 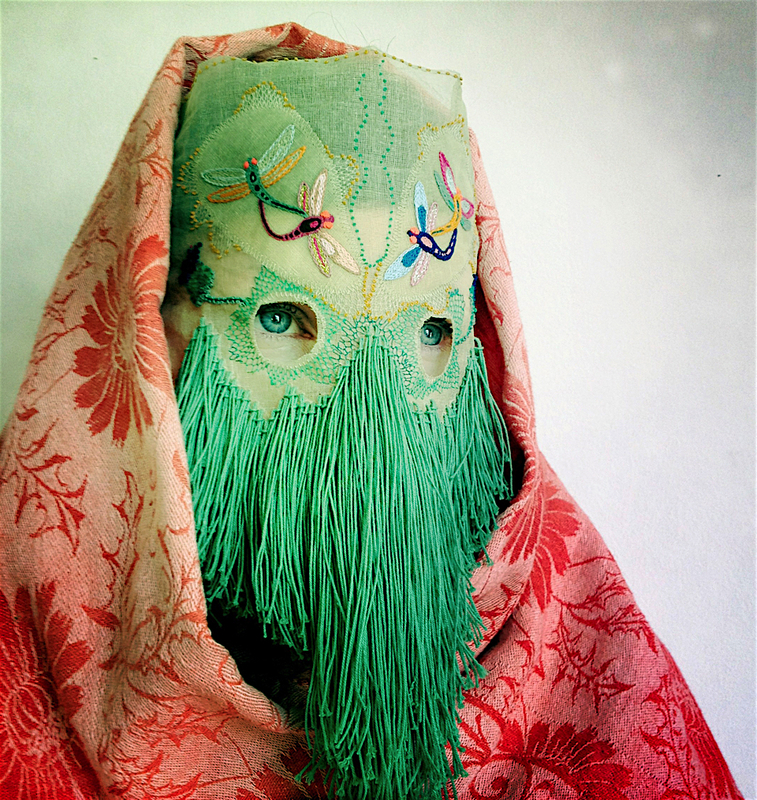 This mix of cultures enables her to broaden the way she perceives art, it is more universal. Inspired by personal beliefs and memories, her search for her creative and cultural identity has been the driving force behind everything she does. 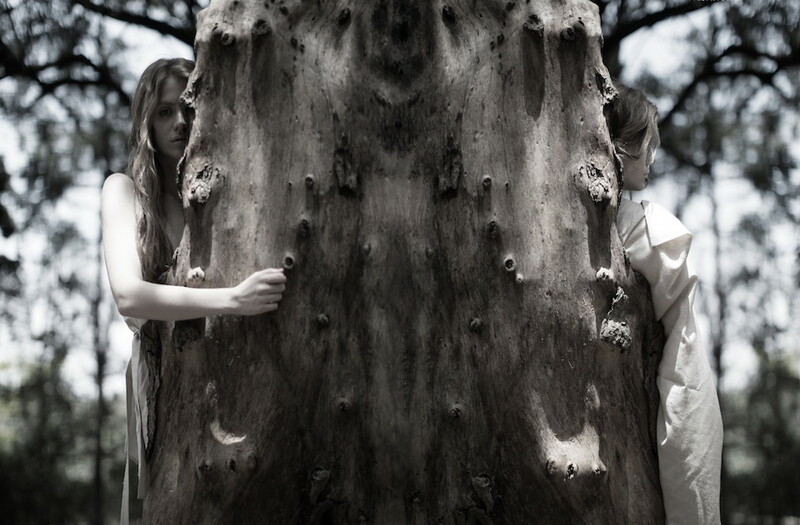 The concept behind each image has a lot of existential and philosophical questioning inspired by literature and philosophy. There is always a strong element of death, as the preparation for each shoot is related to a funeral ritual where the deceased is adorned. The portraits are merely a representation of the unavoidable fate of the living who have faded away. 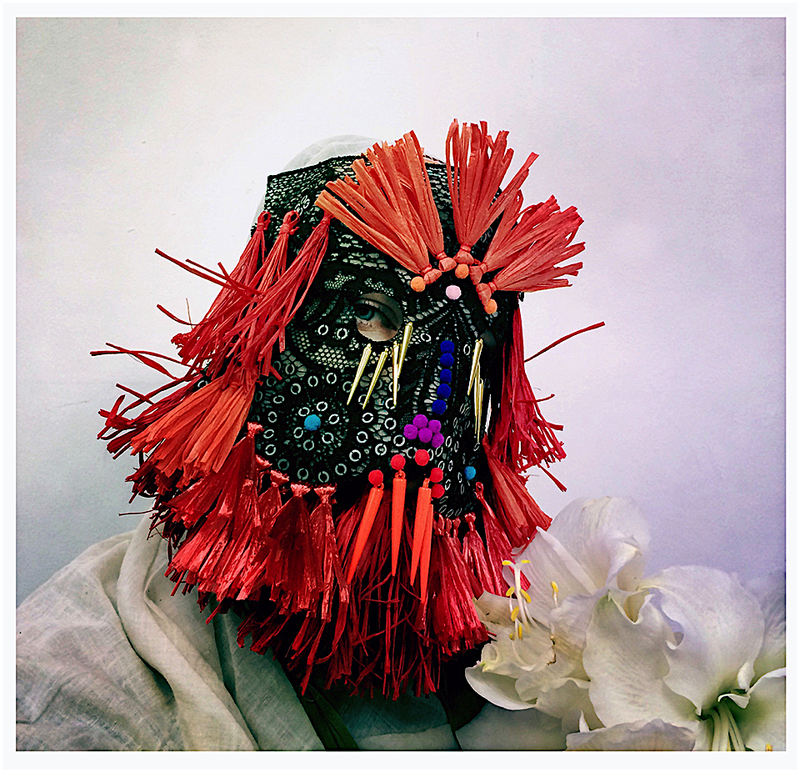 Kimiko sees history from an angle where rituals and liturgies come to life again as something new. 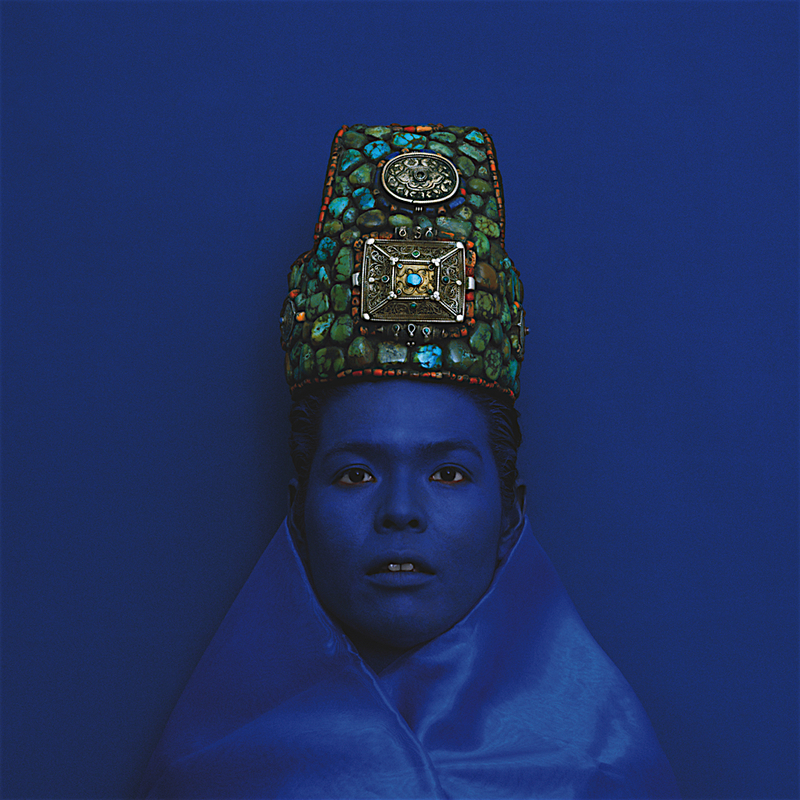 Quite a lot of her photographic series have been shot in museums where she uses the objects and artefacts that they house, some belonging to archaeological and ethnographical collections, although most of the time her shooting is done in her Paris or Venice studios. The process of shooting is a ceremony itself. The preparation is done only with the assistance of her husband, Jean-Michel Ribettes, without a team. Kimiko is currently working on a new series of blow glass mirrors entitled “Senza”; we should expect to see her new work at a solo exhibition in Venice Biennale at the Ca’ Pesaro– International Gallery of Modern Art in 2017. ADF, which stands for Architecture, Design, Fashion, is a department under the Arts Group at the British Council. There has been an arts element within the work of the British Council since 1937 when it took over the running of the British Pavilion in Venice. One of the programmes ADF is organising is International Fashion Showcase, which runs every February during London Fashion Week. 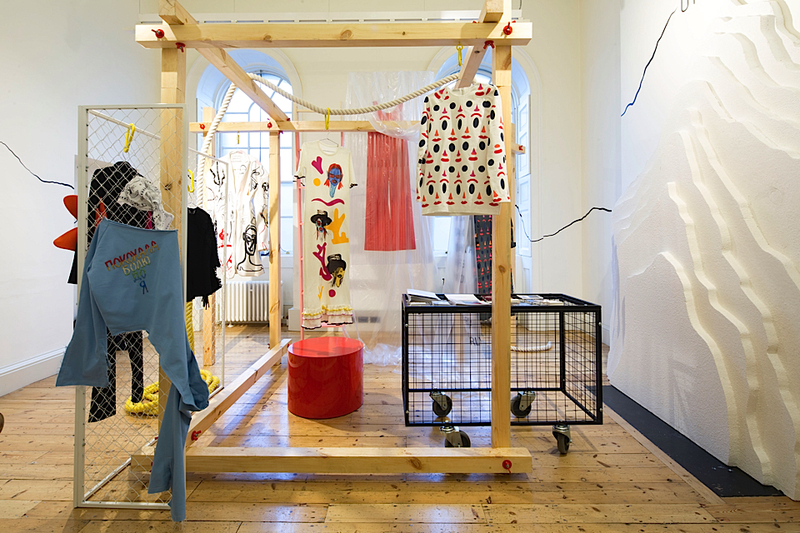 This year it was presented in an exhibition at Somerset House where countries from all over the world were represented by talented designers from their native country. Each country had their own curation which included garments along with jewellery and accessories, providing a wide selection of styles. Talking to Niamh Tuft, Programme Manager at the ADF section of British Council we learn a lot more about the behind the scenes projects that British Council is working on. How many different programmes, projects and initiatives make up the ADF? We work with 109 countries across all continents of the world and in partnership with local design organisations. For example I work with one region and in a year I'll be working on about 10-15 projects this year to varying sizes. We split the world into 7 regions so that 70-100 a year. The British Council’s remit, is to create and broker partnerships, so we will be working with a partner in the foreign country that we are working in and a partner in the UK, so we are always trying to connect the sectors if that makes sense, or sometimes it’s about connecting the individuals: we also have a residency programme. The majority of our work is with artists overseas, IFS is quite unusual, and is described internally as ‘reverse showcasing’ because what we normally do in the British Council is take British practitioners and British work overseas, but [with IFS] we are bringing overseas work to the UK. This makes us less well known than other areas of the British Council, which are teaching English as a foreign language overseas and education partnerships, as well as the arts. Most people overseas will have come into contact with us through the other education or language parts rather than art. Yes that is my experience growing up in Greece too, so it was fascinating to find out that you do all of these other things too. Could you tell me a bit more about the events around the world? other projects or events that are more in the cultural realm. So what we do is a combination of cultural programmes as well as capacity building and skills development activities that are using UK expertise to increase the prosperity and development of other industries. We do have UK international development funding within the British Council so that would tend to be focused on where the skills element side comes from. Do you work with individual designers in the partner countries? We always work with local partners, for instance, in a project we ran in Jakarta Fashion Week our local partner would select the designers and we would then work with them, so there is always an institution involved rather than us going directly to designers. Originally in Jakarta it was a group of 30 designers and that has been renewed each year, so the end result can be work with an individual designer. It is very exciting that you are working with so many countries that are not ‘discovered’ yet, because there are so many talented artists around the world and sometimes it is hard to pick them up. Yes, what I think is different about IFS is that we are not going through are lot of the usual channels that are used for talent scouting, such as going to schools or to key influences and asking who is coming through, whereas we are going directly to the industry in the country. I think this approach is one of the things we have really benefitted from because people appreciate the fact you are listening to who they think are the leading talents. And you presumably give opportunities to a wider range of people as well by doing this? Exactly and it is where we are able to promote something quite fresh on the industry side. I would say that quite a few of the designers that come through us, maybe 70-80%, industry people would not have known of before. There are quite a lot international designers around at the moment that people would have heard of, because they have come through talent scouting platforms like Hyères or ITS (International Talent Support), where the same group of designers are coming through and going onto LVMH whereas most of those we work with are a different group, who are not in that mix, although there are some crossover. When was the IFS first introduced and what was the idea behind it? How did the British Council and the British Fashion Council collaborate to introduce this new platform for emerging designers? to celebrate the Olympics, and it was quite a big year for BFC because I think the London Collection was founded in 2012, so they had a lot going on and they were looking for things connected with cultural efforts. It is a public facing cultural event so it is seen a slightly different and engaging a slightly different audience. It began as a map in embassies' own venues and then across last 3 editions it's moved into a central venue. We looked to reflect the international character of London's fashion schools and LFW schedule and chose to work with emerging designers as London is the capital of emerging talent. We work with embassies and BC offices globally who help to identify a fashion authority in each country that put together a proposal with a selection of designers that make up the IFS advisory panel review. The difference in this model is it goes direct to local industries rather than through the same set of influencers or international fashion schools to identify designers. We give advisory, curatorial and production support. What I like about IFS is also that it is free to the public, and the presentations are very approachable, would you agree? Yes, well someone recently asked me if we would ever charge for it and I think that would go against the nature of it since we want it to be as inclusive as possible. What are the selection criteria and how strong is the bond of each designer you select in relation to their country of origin and cultural background? Designers must be in their first 5 years of business. We are then looking for quality in design and often find designers who are reinventing their heritage catch the eye of the panel but the criteria we impose is mainly to the country - fashion authority, curatorial and curatorial statement, and work with emerging designers. Relationship to country is usually born there or based there but self-identification is important e.g. Julia Mannisto, born in Colombia, lives in Finland, trained in London. 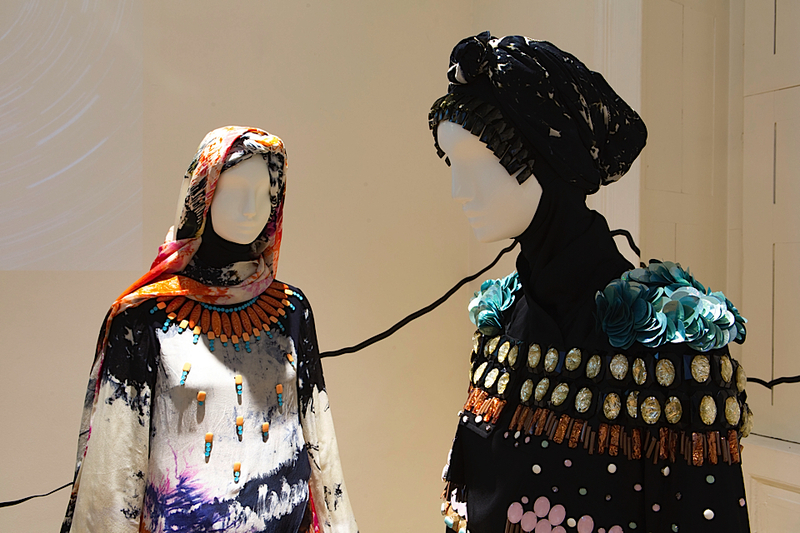 Do you believe that emerging designers should use elements of their cultural heritage and if yes, can this have a powerful impact in the fashion industry? I don’t think they necessarily have to. I think we are always quite aware that we don't want to push that on people as criteria because there is nothing wrong with someone doing work that isn't influenced by their cultural heritage, instead by someone else's, which is good for the mobility of ideas. Cultures all relate to one another and I think what’s more important for us is that you present fashion as cultural expression. In lots of places where I have conversations initially about IFS it would be about the commerce of fashion first, and of course it is an industry, and lots of governments are interested in it as an industry (many are also not and that can be a problem in itself) but then it has to also come with the level of cultural respect, so I think we have acknowledge and respect designers who are trying to say something about who they are and their cultural identity, we have to give them a platform to have that discussion and that space and not make it all about commerce. I am interested, for example, in a Georgian designer who is fascinated by Japan. We are looking at the ideas that are in circulation and for designers to transcend, something shared and universal. However lots of designers we've worked with have looked to revive their cultural heritage - in places where fashion isn't respected as a mode of cultural expression this is really important. To support the idea that designers are cultural commentators and that they can have a role in transmitting, or reviving or questioning their cultural heritage or contemporary culture. In reference to London’s National Portrait gallery exhibition Vogue 100 – A Century of Style we take the opportunity to talk to talented photographer Henry Bourne about his contribution to British culture. Henry first caught my attention through images of his publication Arcadia Britannica published by Thames & Hudson last year. 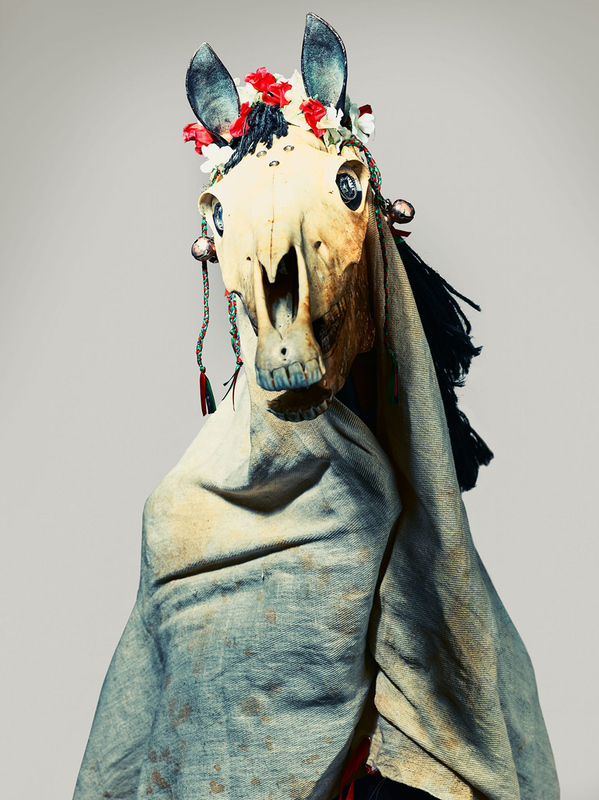 There is an amazing connection to rituals and masquerade through the rest of his personal work and also contribution to the fashion industry worth having a look. I grew up and I’m based in London but I spend a lot of time in the Sussex countryside. 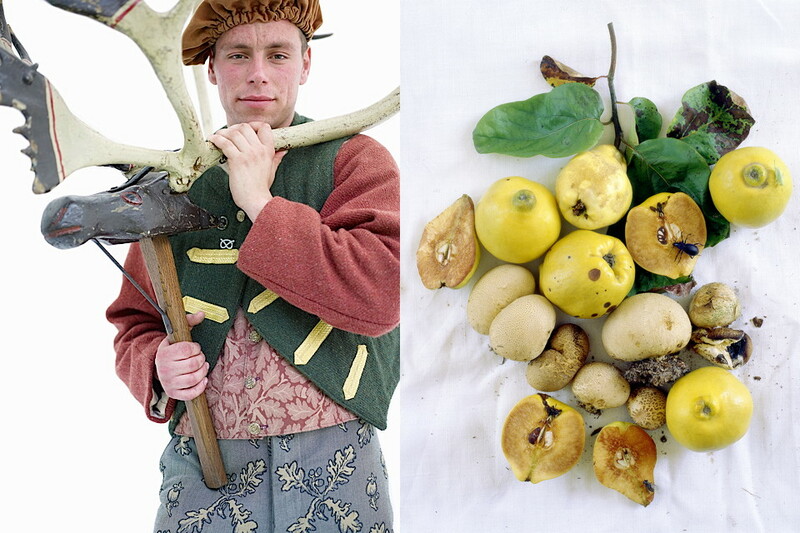 My work has appeared in numerous exhibitions worldwide, including; ‘Folklore & Photography’, at the Towner Gallery for Contemporary Art 2012. 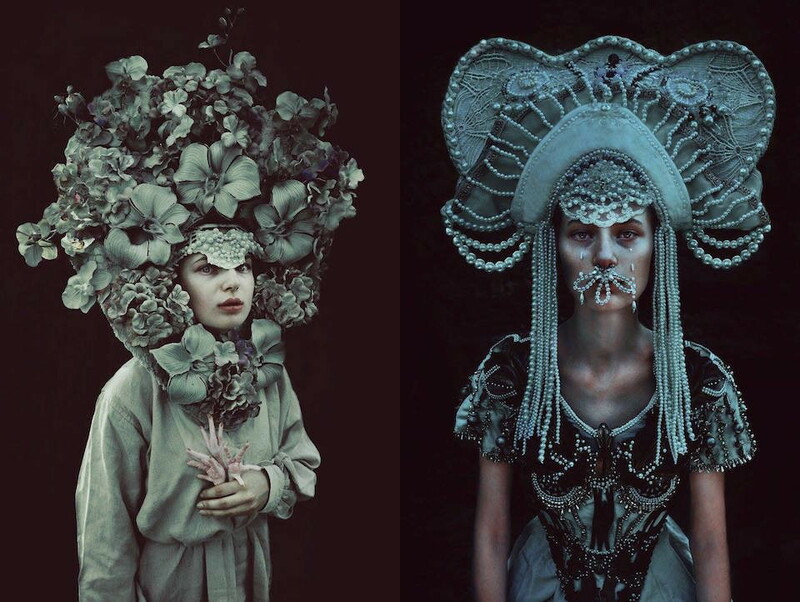 ‘Modern British Folklore Portraits’ at the Central State Exhibition hall in St Petersburg. 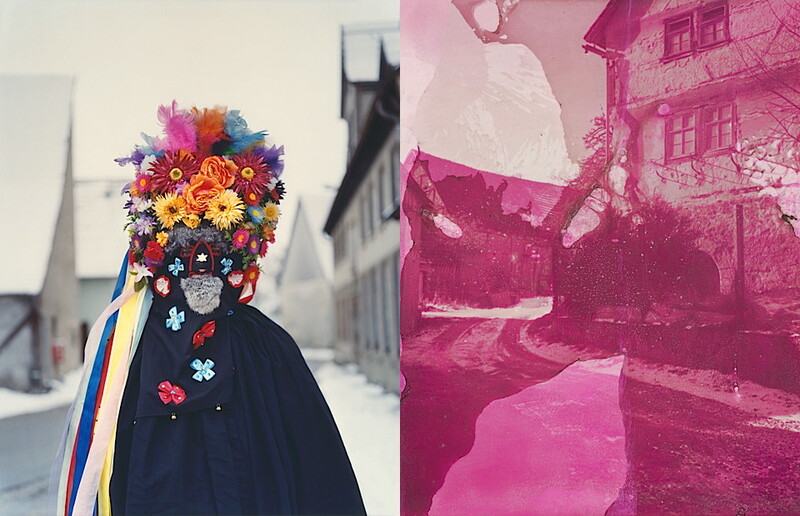 ‘Now & Then’ an exhibition of contemporary art and historical objects at Harris Lindsay London 2011 curated by Adrian Dannatt. 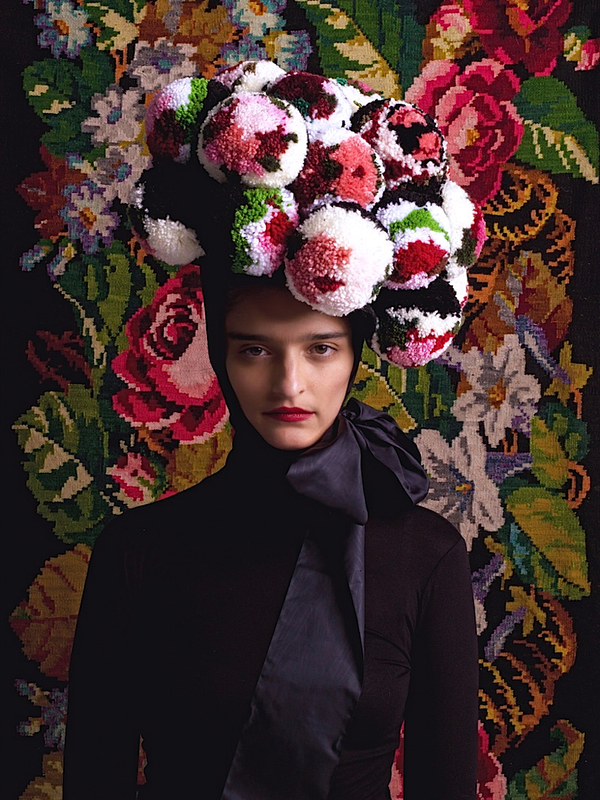 My work is currently being exhibited as part of ‘Vogue 100: A Century of Style’ from 11th February – 22nd May 2016 at The National Portrait Gallery London. 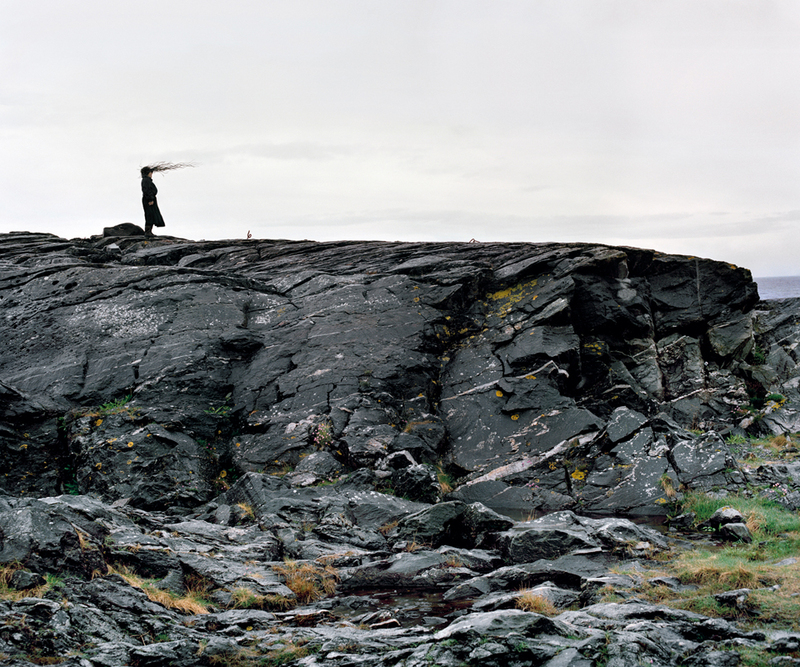 My work forms part of the National Portrait Gallery’s (London) permanent collection of portrait photography. 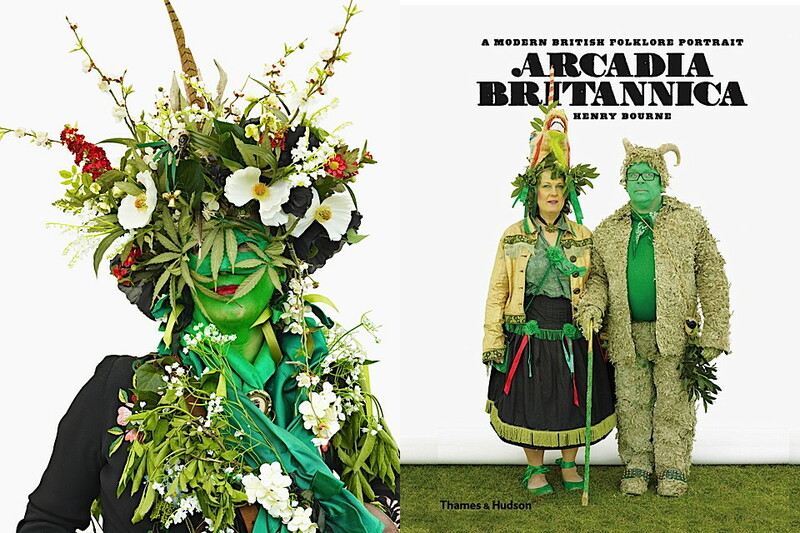 My first monograph book ‘Arcadia Britannica, a Modern British Folklore Portrait’ was published in 2015 by Thames & Hudson. 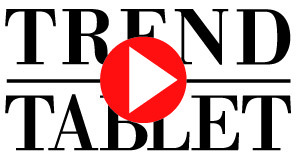 I am a regular contributor to Vogue & Harper’s Bazaar magazines worldwide & T: The New York Times Style Magazine. My editorial work has also appeared in, amongst others, The Conde Nast Traveller, Numero, W, The Wall Street Journal Magazine, Wallpaper, The World of Interiors & Vanity Fair magazines. My portrait commissions include: Gillian Anderson, Tom Dixon, Chiwetel Ejiofor, Tracey Emin, Zaha Hadid, the Mayor of London; Boris Johnson, Ralph Lauren, Carey Mulligan, Elizabeth McGovern, Steve McQueen, Grayson Perry, Richard Prince, Emeli Sande, Paula Rego and, Vanessa Redgrave. I have worked with advertising clients including: Hermès, Lancôme, Ralph Lauren, Paul Smith & UBS. How did the idea of the book Arcadia Britannica began? Is it an ongoing project? How did you collaborate with Simon Costin? 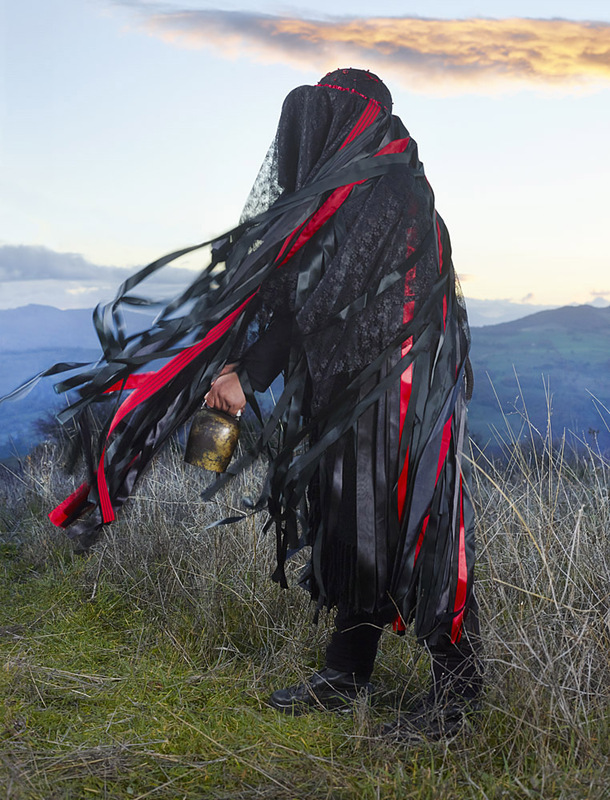 Arcadia Britannica is an ongoing photographic portrait project, of some the individuals involved in the myriad of different British folklore traditions and customs, around the United Kingdom. Starting in 2009, I traveled around the UK to various seasonal rites and folklore festivals to photograph the diverse mix of people who participate in these rituals. These unique traditions & customs are flourishing and evolving, and I wanted to document these particularly British individuals exactly as they are without further embellishment. I decided that the best way to record this was to concentrate on the individuals rather than the perimeter events, working within a portable studio at each event, to link each event and the photographs together. My starting point was the Victorian Member of Parliament and amateur photographer Sir Benjamin Stone’s series of photographs within ‘Records of National Life and History Volume I: Festivals, Ceremonies and Customs’ and the collection of his photographs at the V&A Museum. The initial idea of a new 21st century British folklore portrait came from a discussion with my friend Simon Costin, designer and the director of the Museum of British Folklore, who is campaigning to raise funds and awareness for the UK’s first museum to exclusively cover British Folklore. In 2009, Simon Costin took a miniature Museum of British Folklore around the UK in an elaborately styled 1960’s caravan as part of the Museums journey towards a permanent home. Initially I accompanied him along with my portable studio and then went on both alone and with Simon to other events around the UK. 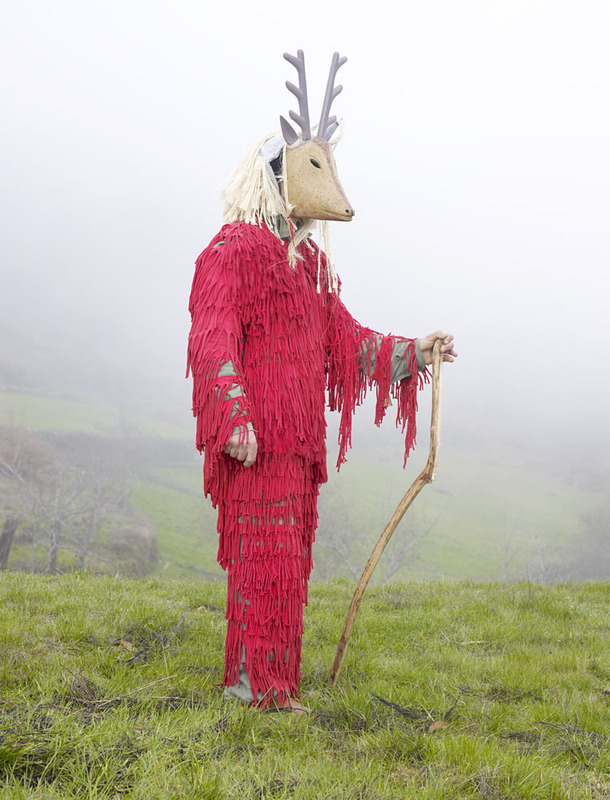 He has been an integral part of the photographic project, suggesting events and sharing his contacts, enthusiasm and passion for British folklore. The project has been in collaboration with Simon, whose help and knowledge has been invaluable. ‘The Endless Cavalcade’(by Alexander Howard published in 1964) lists a British rite or ritual for every day of the year, there are now approximately 720 recorded events, rites and ever changing customs practiced in the UK each year. 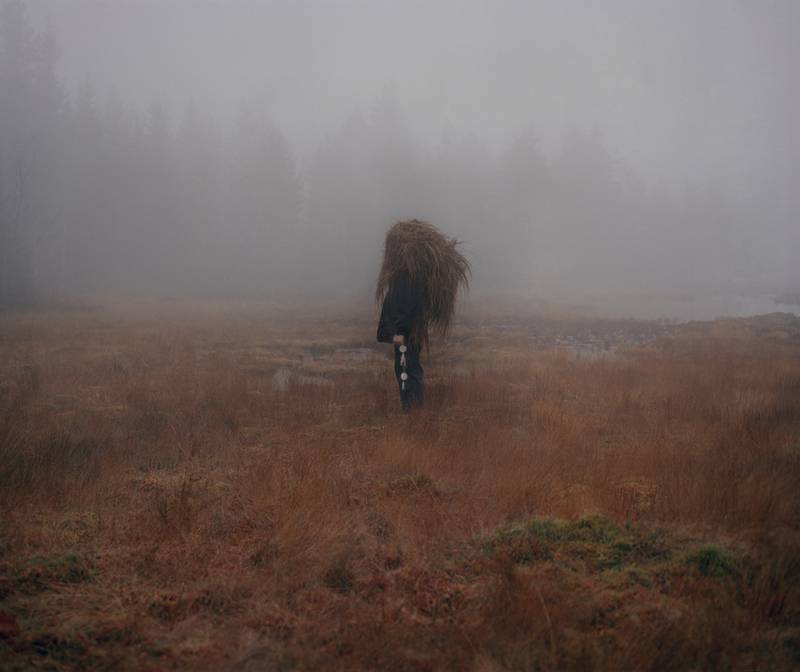 By no means are the photographs in Arcadia Britannica intended to be a comprehensive document of British Folklore today, but merely a snapshot of a small number of the individuals involved today and the photography for the project continues. Who are the people behind the images? The people behind the images come from all walks of life including; nurses, builders, a Japanese translator, civil servants, business people, and the graphic designer of Hibernian football club, amongst others. 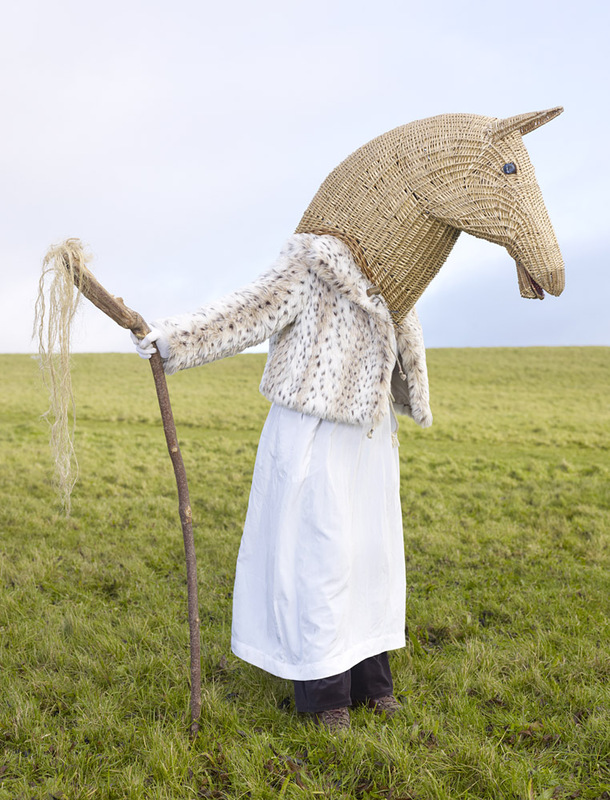 A complete cross section of backgrounds and occupations appear within British Folklore. Wherever possible we captioned the subject’s professions within Arcadia Britannica. What is about British folklore culture that fascinates you? 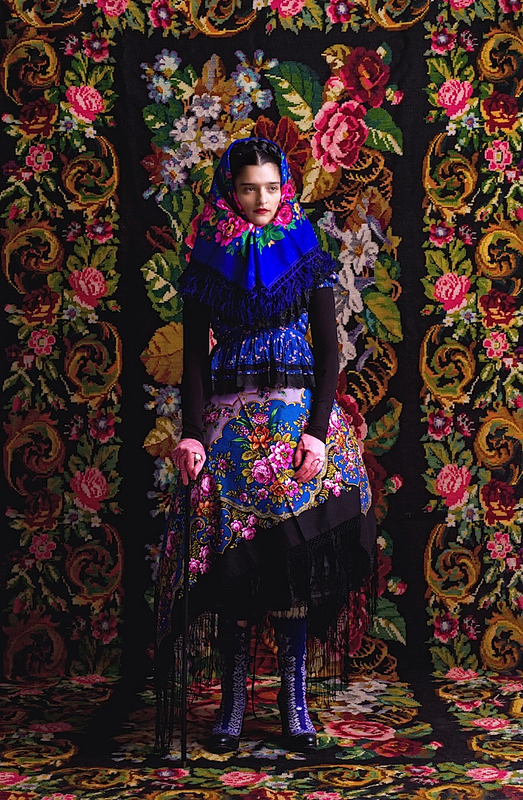 Today we find ourselves in the midst of a British folklore renaissance, a new surge of interest in all things folkloric, within music, art and fashion. 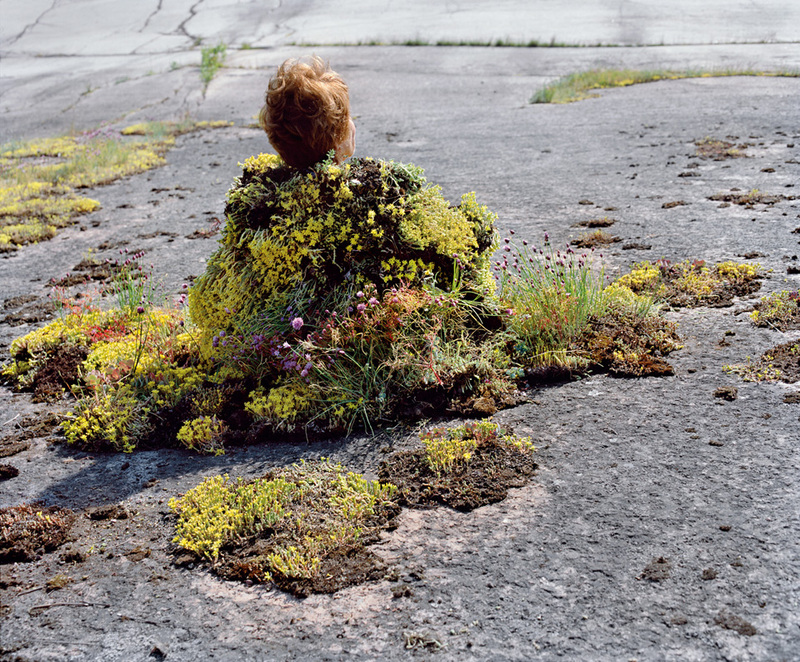 There is a growing popular desire to reconnect with our heritage, nature and our environment, perhaps as a reaction against our on-line, yet impersonal technological age. 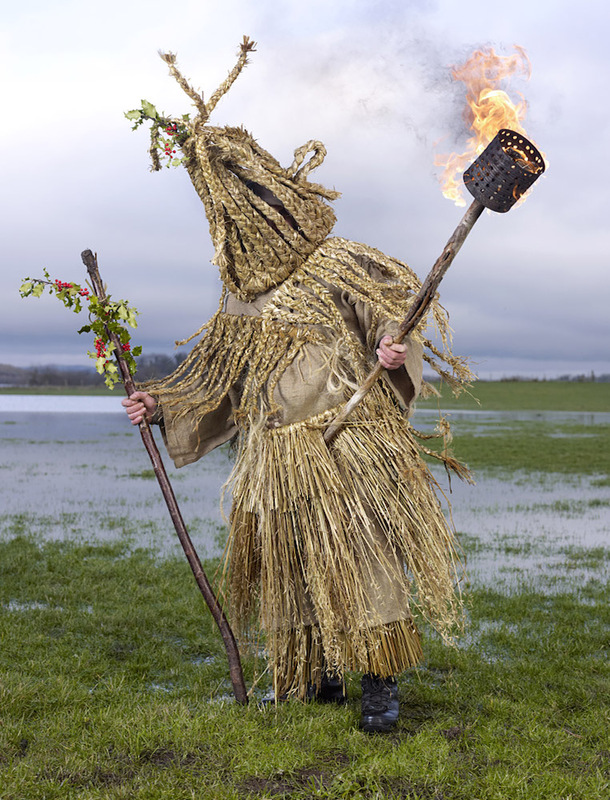 British Folklore traditions and rituals have had a rather tame reputation to date, which is unfounded. There is a fascinating world of bizarre tales and characters, brimming with idiosyncrasies and eccentricities, together with a renewed modern 21st century populism and enthusiasm, coupled with British history and myth. 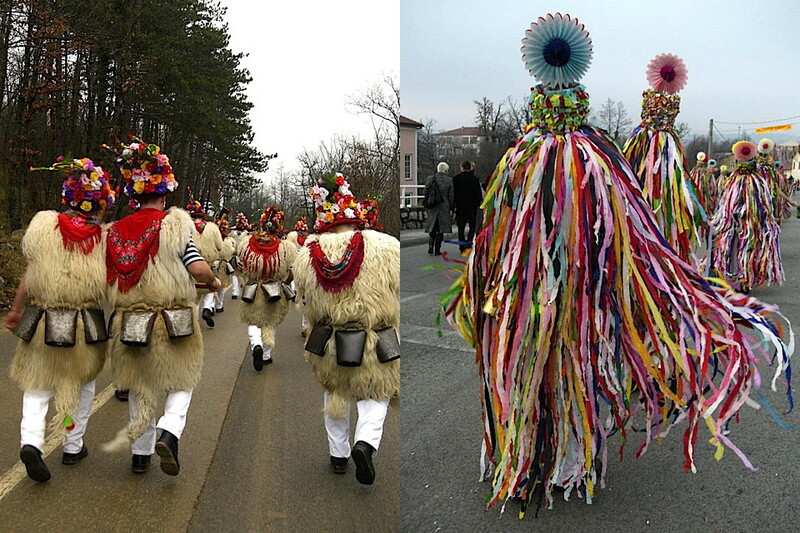 Folklore is a living, evolving culture that doesn't stand still; it adapts and references contemporary culture. Would you consider expanding your project in other countries? Yes absolutely, many of these British rituals have similarities to those in Germany, France, Scandinavia, and many other countries and although mostly, the origins are unclear these events must have important links to one another. But for now I am concentrating on the UK as there is still so much still to cover here. Do you think rituals are still important within the modern society or is it part of our heritage that is slowly fading away? Yes, ritual is still important and I think we find it reassuring. It enables us to both re-connect with the past and connect with the present. Do you think this is something that can evolve and take new forms in order to adjust with today’s needs? By its nature Folklore’s origins are usually unclear and ever changing, adapting to contemporary society. Its current popularity could be a reaction to our consumerist age; it celebrates renewal, nature, and green environmental issues, all of which are thoroughly modern concerns. 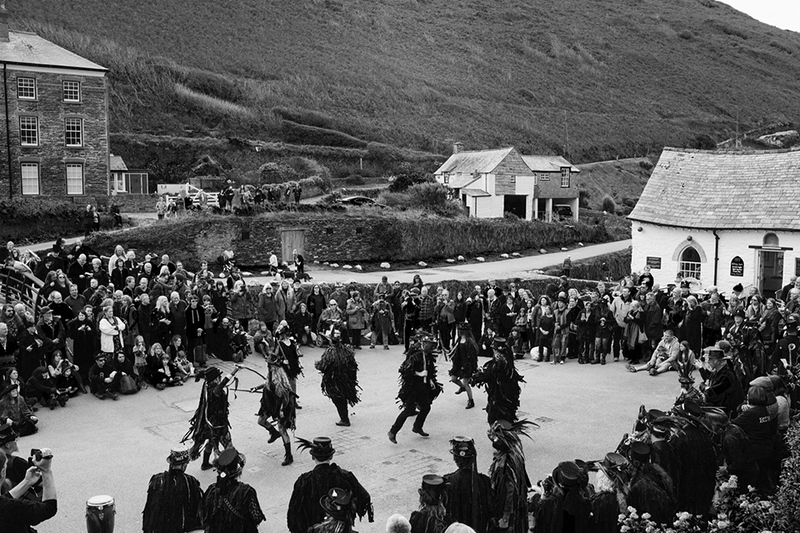 The Jack in the Green festival in Hastings is a good example of the evolution of a folklore event; first recorded around 300 years ago as a May Day celebration of the start of summer in Hastings, its roots are probably from the Romans and Celts celebrations of the beginning of summer. The Jack in the Green parade had all but disappeared by the start of the 20th Century. It was resurrected in 1983 and today is an ever-popular annual event with some new traditions as well as the old. 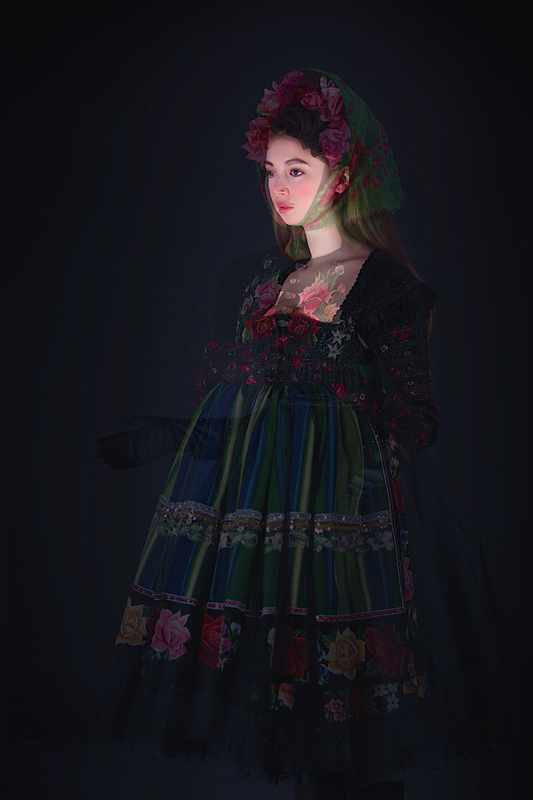 Along with the traditional costumes (people dressed as milkmaids and chimney sweeps) there are new contemporary participants, often dressed in extravagant ‘tatter’ clothing decorated with foliage and flowers, and their faces painted green. 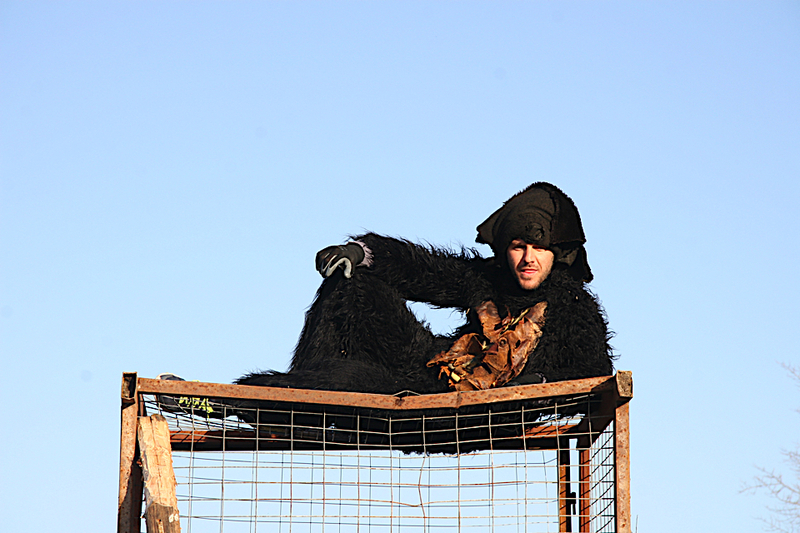 Even the Bonfire society’s Sussex bonfire celebrations have evolved. Guy Fawkes Night, that commemorates the events of the 5 November 1605, when Guy Fawkes, a member of the Gunpowder Plot, was arrested whilst guarding explosives that his fellow plotters had placed beneath the Houses of Parliament in London. In celebration of King James’ survival of this attempt on his life, bonfires were lit around London. In 1850 in Lewes, the inclusion of the burning of a papal effigy began on Guy Fawkes Night, in protest at Pope Pius IX's decision to try to restore the Catholic Church in England. In Lewis and Hastings today, it has become a fun night out, Papal effigies have been replaced by effigies of currently unpopular figures, usually politicians, along with the traditional Guy Fawkes. The annual Notting Hill London carnival is an example of a modern Folkloric event that is relevant to both the local and, more recently, a widespread London community that celebrates Caribbean London culture. 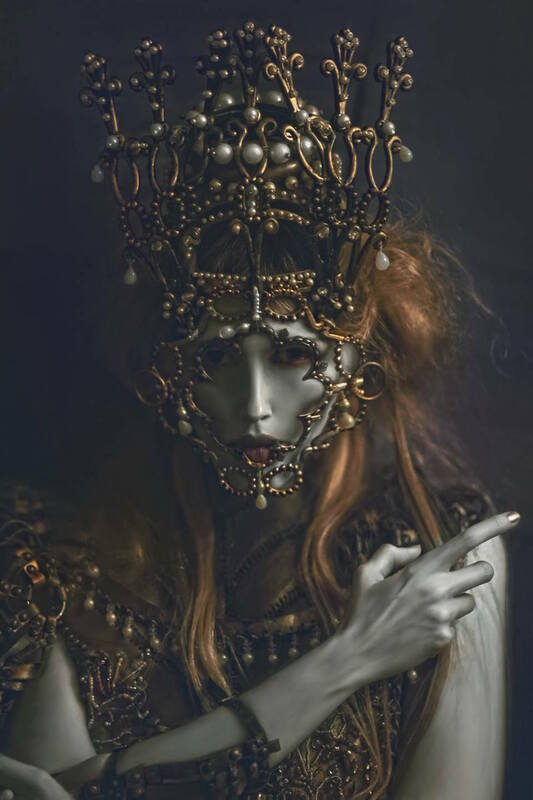 What is it about masquerade that captures your attention? I can see this is something that dominates your photographs both in your personal work but also in projects for clients such as Hermes. 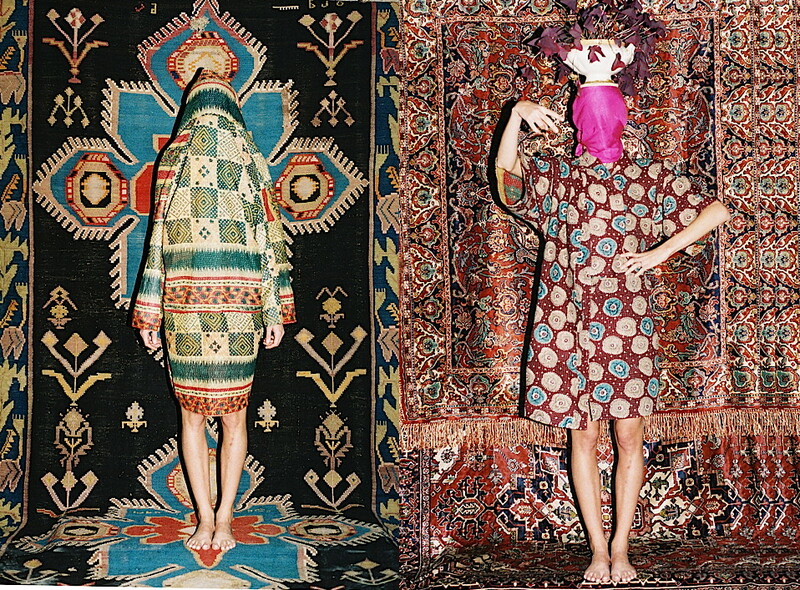 Escaping from the ‘everyday’, disguise, dressing up, the taking on of another identity, fantasy, and hiding! I have several projects on the go, one of which involves tracing and photographing my long lost family of Native American distant relatives that live in Canada, and the surrounding landscape and towns nearby. 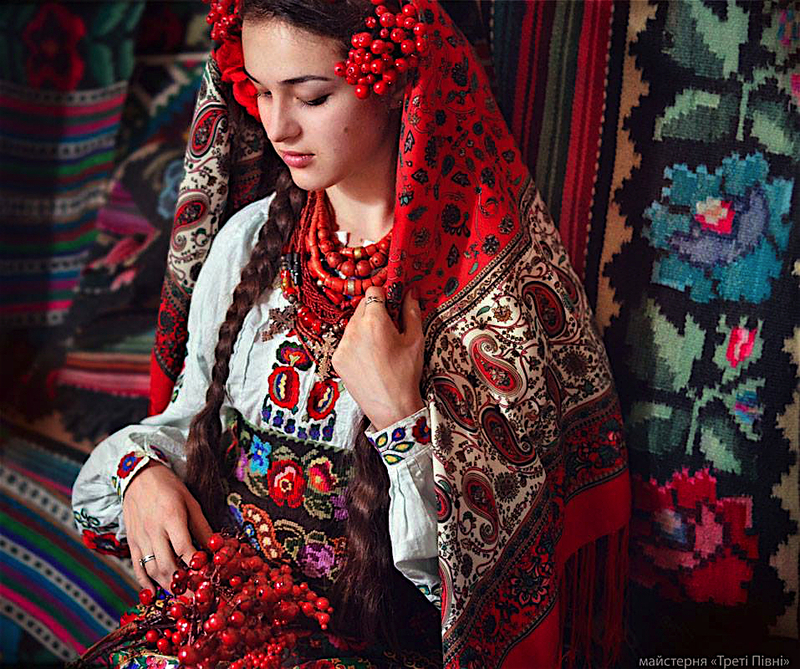 Ukraine has a strong history in traditional textiles and embroidery and these elements should be maintained and revived to become a part of the Ukrainian textile industry. 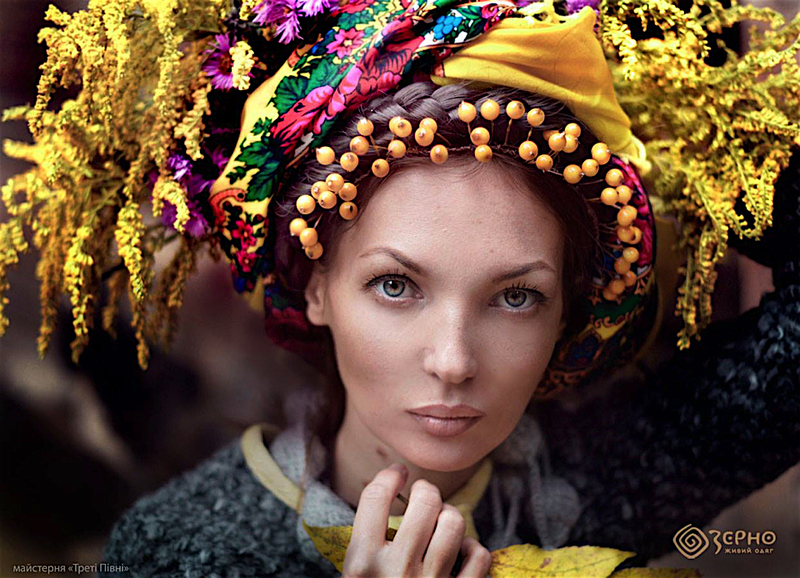 The folklore element is very important part of the cultural and social identity of Ukrainian people up to the present day. 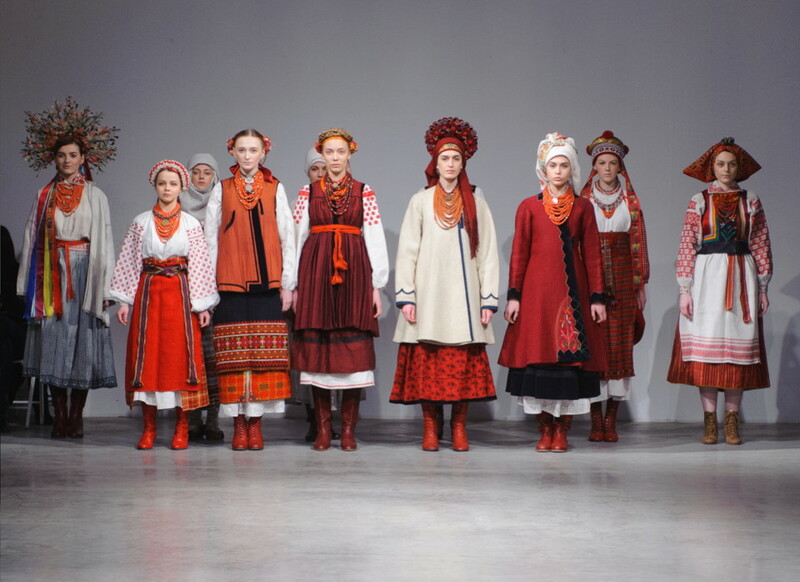 Vytoky Project is a cultural project introduced by Ukrainian Fashion Week, now preparing for its 3rd season to be presented in March during the UFW (Ukrainian Fashion Week). 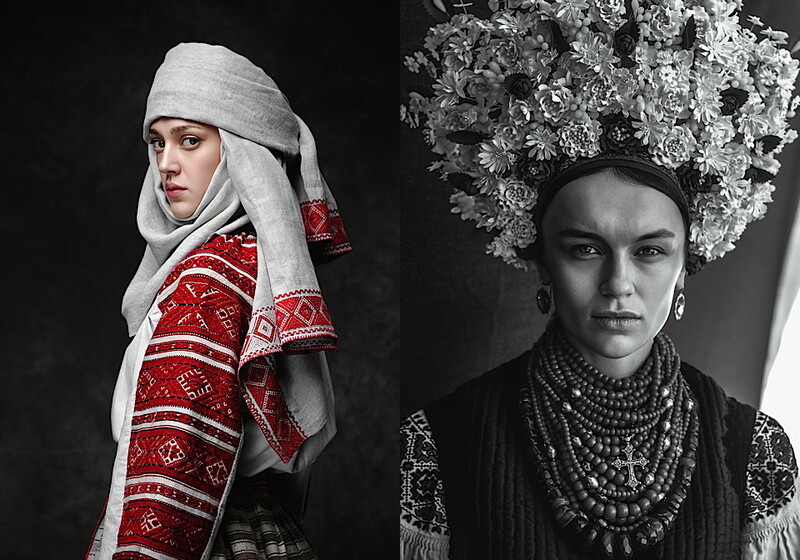 The Project is a combination of an exhibition and a fashion show presenting modern Ukrainian designers inspired by traditional culture and a selection of historical costumes. 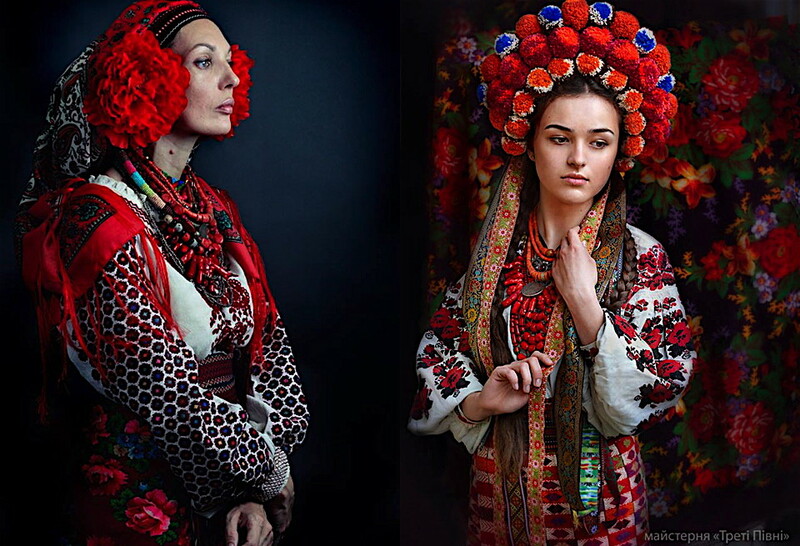 In the past Vytoky has collaborated with museums and collectors such as the Centre of the History of Costume and Ivan Honchar Museum. 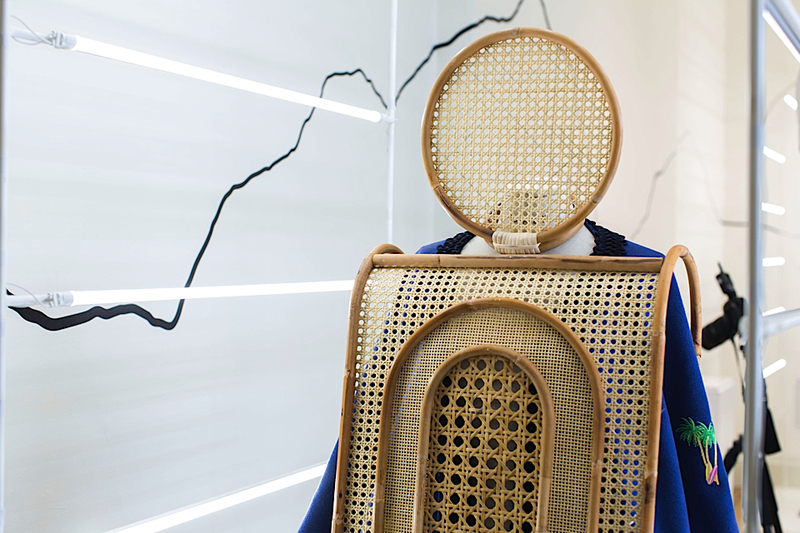 In the last exhibition historical garments were presented along with accessories, musical instruments, furniture and photographs from private collections in combination with conceptual pieces created by modern artists and designers inspired by Ukrainian cultural heritage. Everything is presented in a way to show the transition between the old and the new. 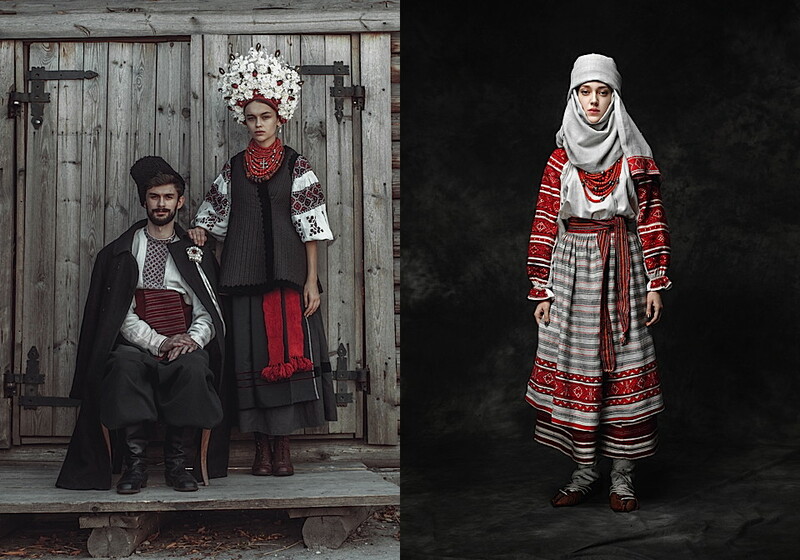 This is also visible by the way their campaign is shot by contemporary photographer Dmitry Komissarenko. 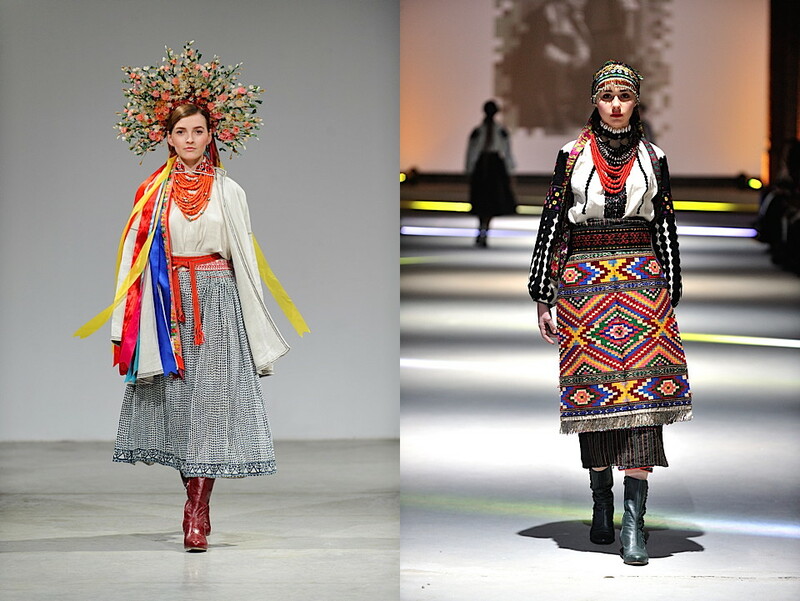 This might seem like a very difficult timing for UFW considering the social-economic and political situation in Ukraine but it seems that UFW grows stronger to the international fashion world no matter what is going on. Now it is the time to make a change and be affected by current events. This is what fashion is all about at the first place, make a statement. Simon Costin belongs to a generation of talented artists who have been involved with various elements of the art and design scene, from art direction to set design. It makes complete sense that he would be the one to give birth to the idea of the Museum of British Folklore. 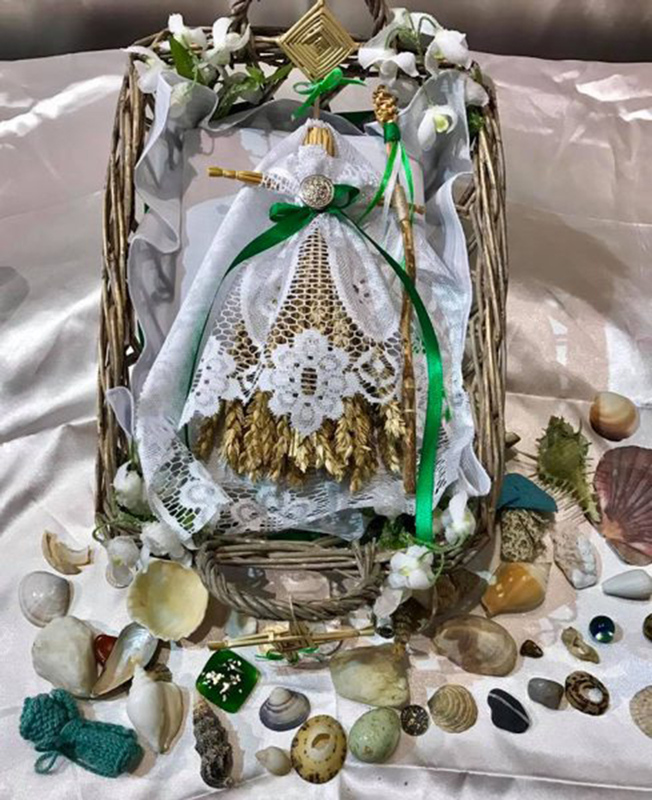 It is surprising that no one in previous centuries and decades has not thought of establishing a dedicated museum that would bring together rituals within Britain especially since the country has such a strong history of folk tales, myths and magic. There is little documentation of rituals in Britain; you have to know what you are looking for in order to find more information. 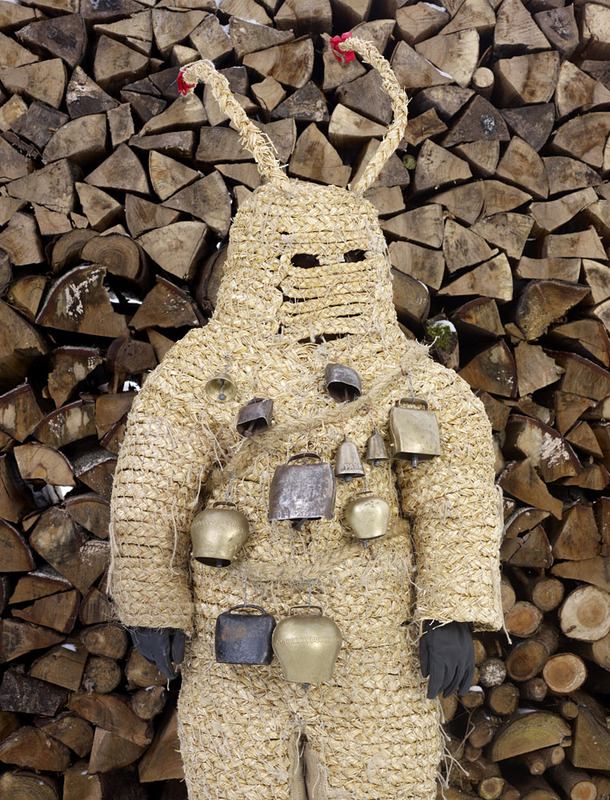 We cannot wait to see this museum being materialised and how Simon’s experience and background in contemporary arts will marry with the folklore. Expect a very strong visual presentation. Talking to Simon we learn more about him and how it all began. We look forward seeing the final result and wish him best of luck. I’m a 7th generation Londoner. I made Super-8 horror films when I was 11-13yrs old. I was obsessed by special effects at a young age and my mother would sometimes return home to find me hanging by a noose from the landing bannisters or running around the garden on fire. I kept white rats who lived in a castle on the top of my wardrobe. My favourite book as a teenager was À rebours1 by Joris-Karl Huysmans. Coming from an art and theatre background how did you choose to work in fashion? 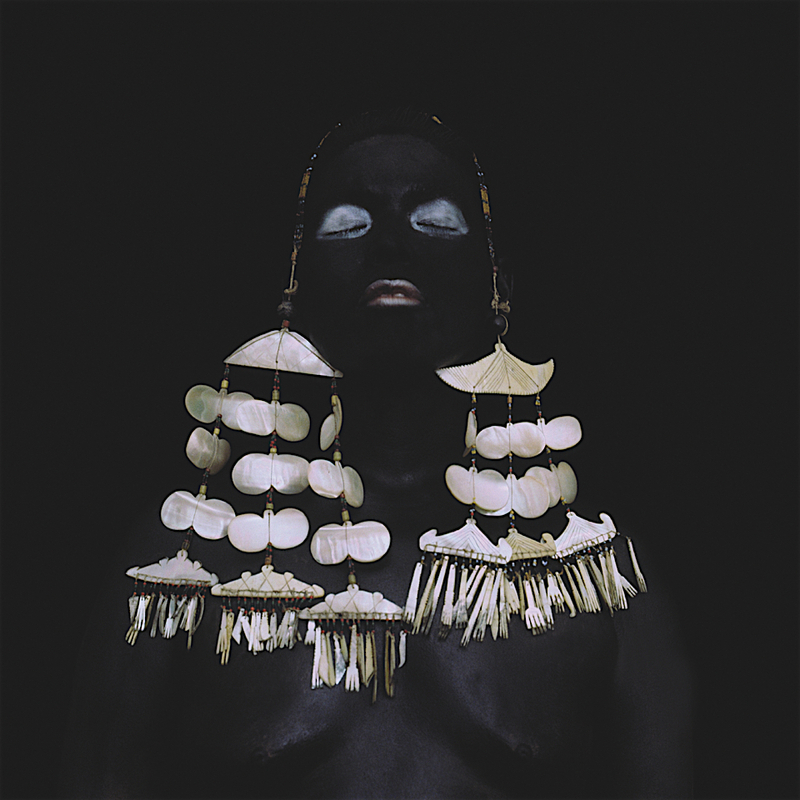 I didn’t choose to work in fashion, a student wrote to me from Central Saint Martins and asked if they could borrow some of my jewellery, which I had made some years previously, for his degree show. His name was Alexander McQueen. That request started a friendship and I ended up designing his runway presentations. Serendipity. 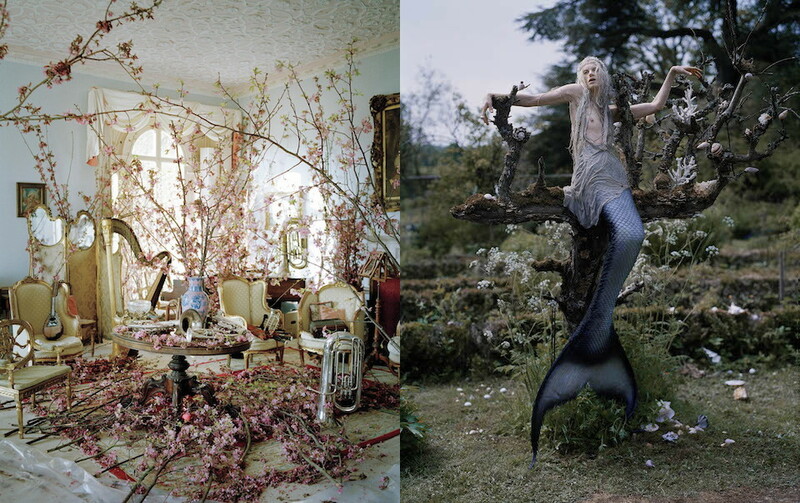 We have come to admire your work through the lenses of Tim Walker. Which photographers and designers have you been working with in the past that have really influenced your creativity? Draper to name but a few. 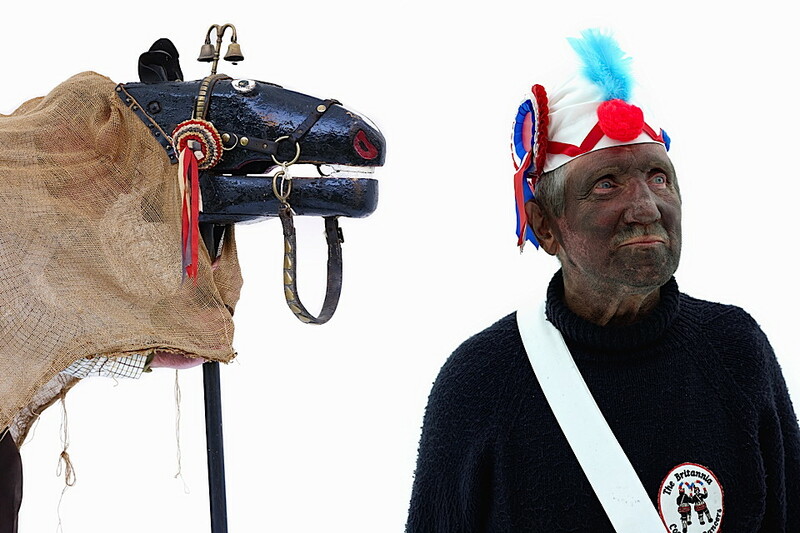 When was the idea of the Museum of British Folklore born? What is it about folklore culture that fascinates you? The museum project has been simmering away in my mind for many, many years but it wasn’t until 2008 that I started to formulate a way to make it a reality. It had always been a dream of mine that one day, possibly when I retired, I would try to establish a Museum. A museum that explored and celebrated the indigenous folk culture of the British Isles. It would be a fusion of many strands of my work, from set design, art direction, curation and the conceptualising of ideas, to my personal passions and interests in the British landscape and its seasonal rites and customs. It would be a place to impart a sense of wonder and history of the many living traditions that exist across the British Isles, some of which I have been fortunate to witness or take part in. Why should it be that as a nation we don’t really seem to value or celebrate our native culture? So many other countries in Europe have regional museums of Folklore. 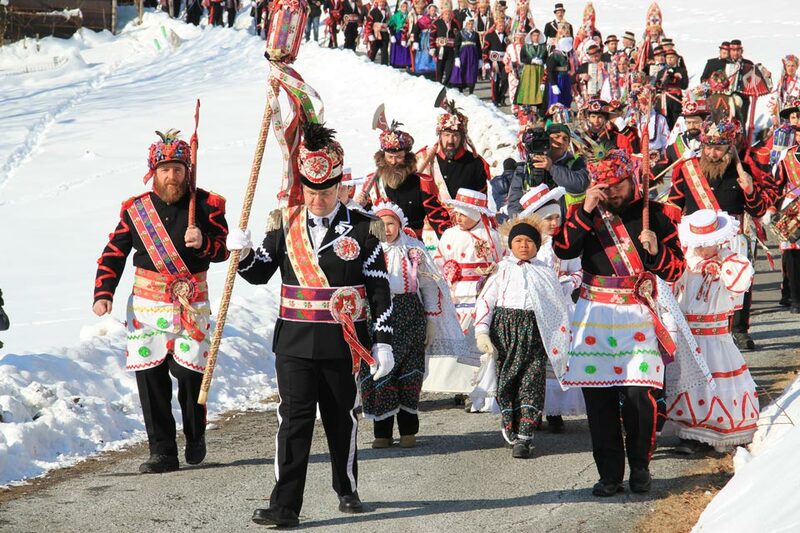 Folklore informs the culture that produces it and we produce a lot of it. 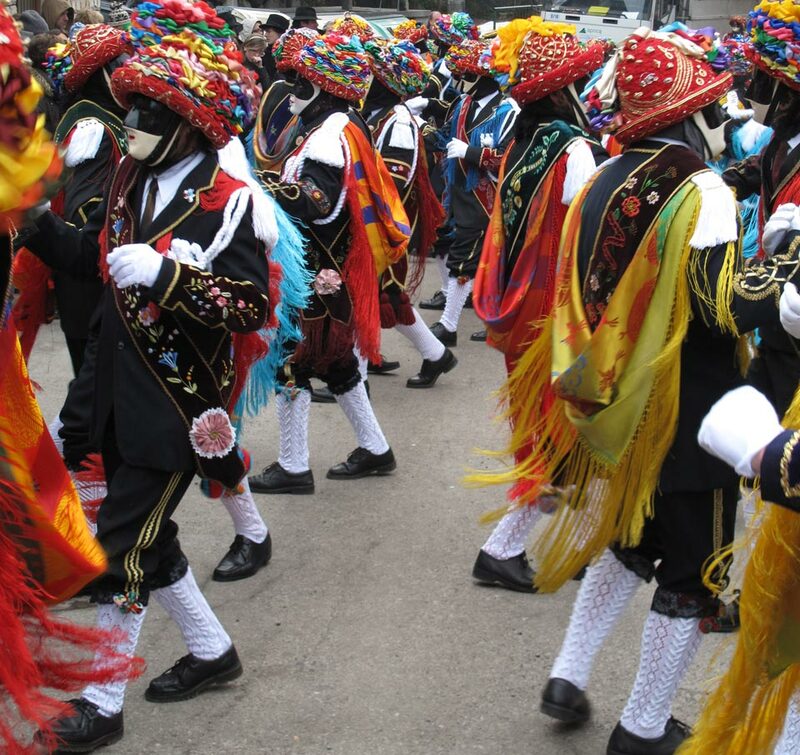 There are approximately 730 recorded annual events, rites and customs taking place in the UK every year. 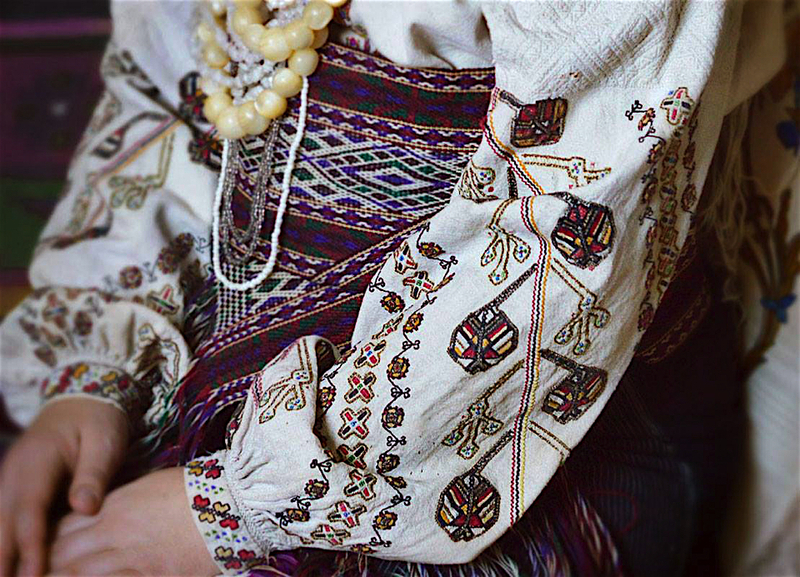 A living cultural heritage, folklore links the past and present. Never static, it changes and adapts to new circumstances while often maintaining its traditional qualities. It serves both to identify and to symbolise the group that originated them. Perhaps due to the fact that many Folk happenings are learned informally through performance, by example or in oral tradition among families, friends and neighbours rather than through formal education, they have been somewhat over-looked by the wider academic circles. When reported on the news they are so often trivialised or reported in a ‘Mad Dogs and Englishmen’ way. The desire to establish a Folklore Museum is partly born of the wish to readdress the balance, to show that our Folklore traditions are just as alive and relevant to people today as they were a few hundred years ago. Times change and the meanings may not be the same, but the music and the customs go on with new relevance. 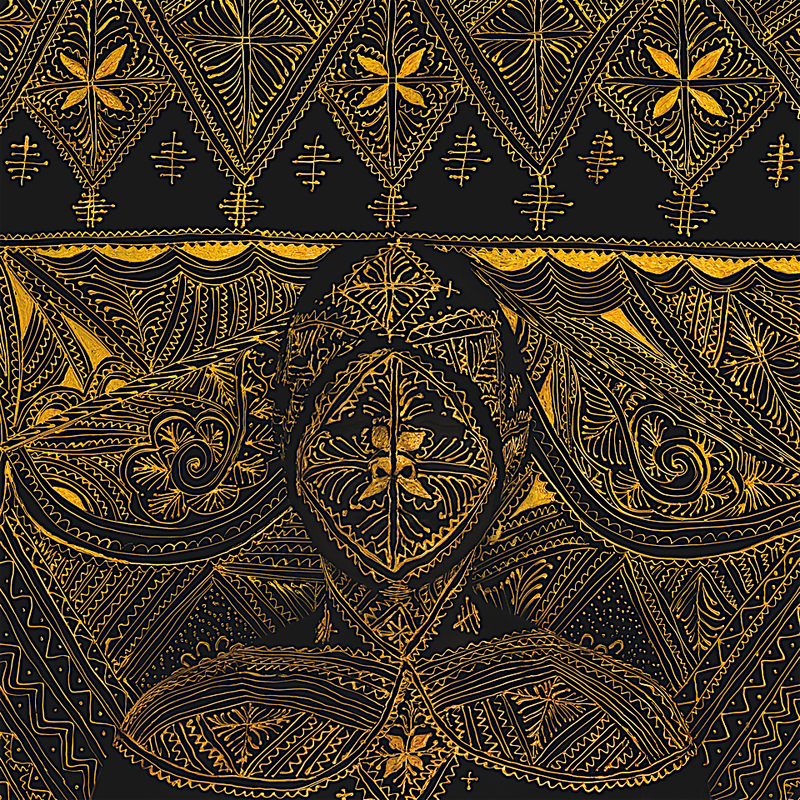 Are you interested on how tradition can be interpreted within contemporary society? Do you think it is something that is slowly fading and being forgotten or new traditions are created? 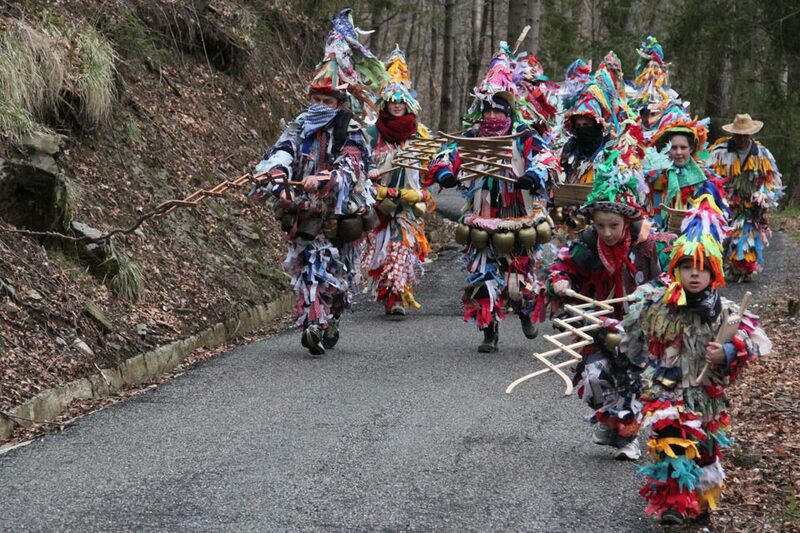 Folklore and folk culture is around us all the time and surfaces in new forms continuously. Think of Ghost Bikes, a form of roadside memorial which appear when a cyclist has died on the road. Painted white and often covered with flowers and notes of remembrance. This is a form of folkloric expression. The Notting Hill Carnival is a good example of an event which has now become folkloric and part of the UK calendar of traditions. What are the plans for the museum, is it going to have a permanent home? The short answer to this question is yes. However at the moment we are undergoing a lot of evaluation as to what this home should be and also more importantly, where. Given the amount of archive material we are amassing it makes sense to purchase or build a place where it can be accessed. Also as word spreads we are acquiring more and more material culture which will need to be displayed. When our two year programme of exhibitions came to an end in 2014 we have concentrated on starting the capital campaign and further raising awareness of the project. We are concentrating our efforts on Sussex at the moment, due to its proximity to London, its strong folklore and traditions, a number of other well-respected galleries and museums in the area such as the Jerwood, De la Warr Pavilion through to Ditchling and Pallant House with others between. Also, a combination of seaside and countryside makes it a very appealing place for visitors. Since the museum is quite recent how do you collect all the artefacts, objects, archives and documents to display? website. We are also actively looking at auction sites and have a network of people on the lookout for items for us. What is the next stop for the museum? We start a Feasibility Study in the New Year which will aim to set out how we will operate as an institution. This will also highlight our best options for fundraising the monies needed to construct the building and five years of running costs. Even if the majority of funding eventually comes from private donors, they will require MoBF to have at least undertaken an options appraisal, along with a fully- developed business plan to ensure that the museum can be sustained in the long-term. Any future shows and exhibitions? We currently have three shows planned for 2016 but as the details are still being finalised its best if people keep an eye on the news section of our website. Many of us, when we think of Greece, we think of a country with rich history and civilization or, based on current events, a country on the verge of collapse and decay. 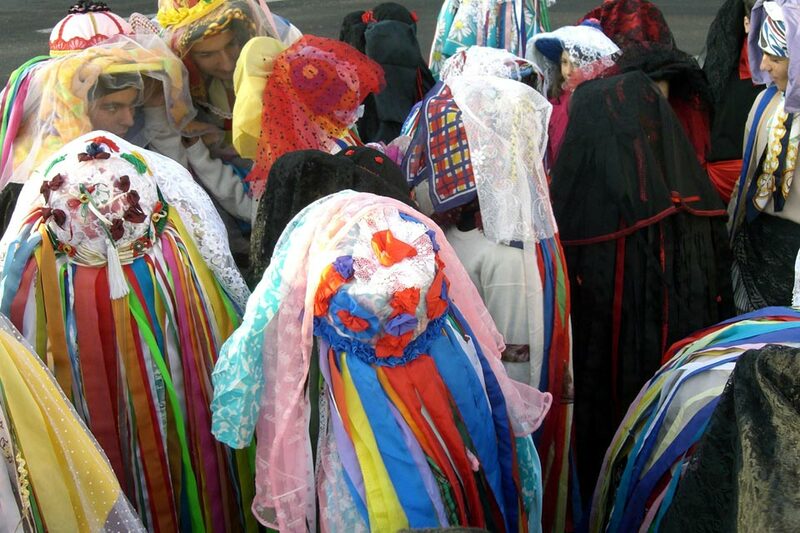 But not many of us would think Greece has to offer a very strong folklore culture. Stereotypes are not easy to beat but looking underneath the surface there is a very rich and powerful influence since the antiquity through the Ottoman times until today. Greece has been a crossroad of different cultures for thousands of years, located between three different continents, Africa, Asia and Europe, which had as a result the mix of different cultures. This has, as a consequence, the country to lie somewhere in between the East and West with an interesting mix of both. 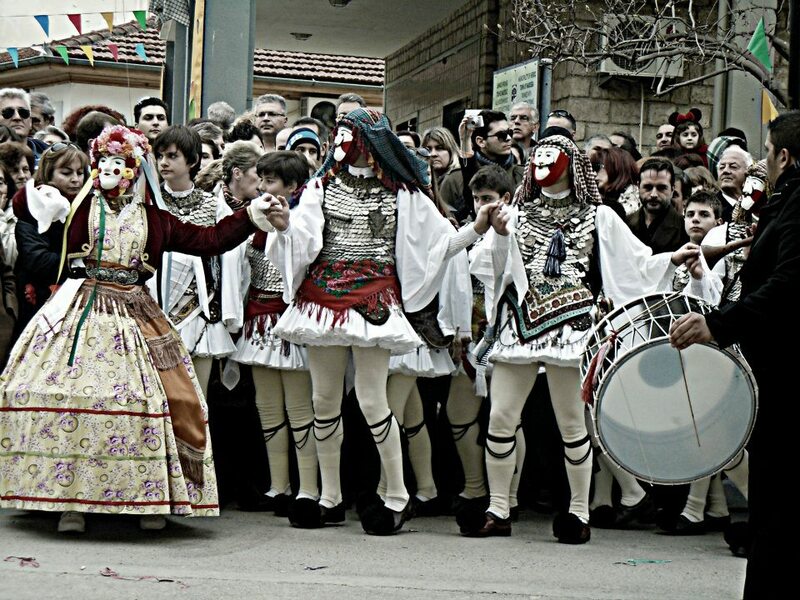 There are many places around Greece that have their own local customs and performing rituals during the Greek Carnival. 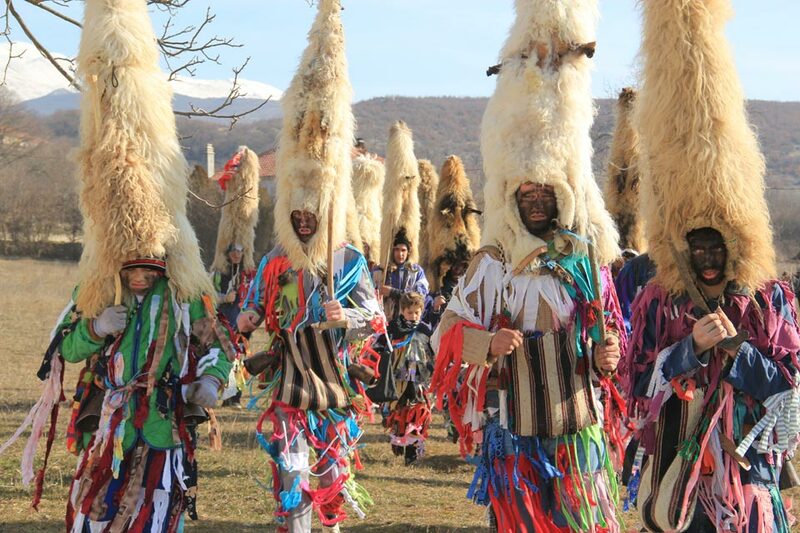 Carnival rituals are performed, as in most cultures, before spring or in the beginning of the year, in order to bring prosperity and annual rebirth of Nature. The origins are lost in time and are connected with the worship of God Dionysus, but keep evolving until today and get influenced and updated by historical and current events. 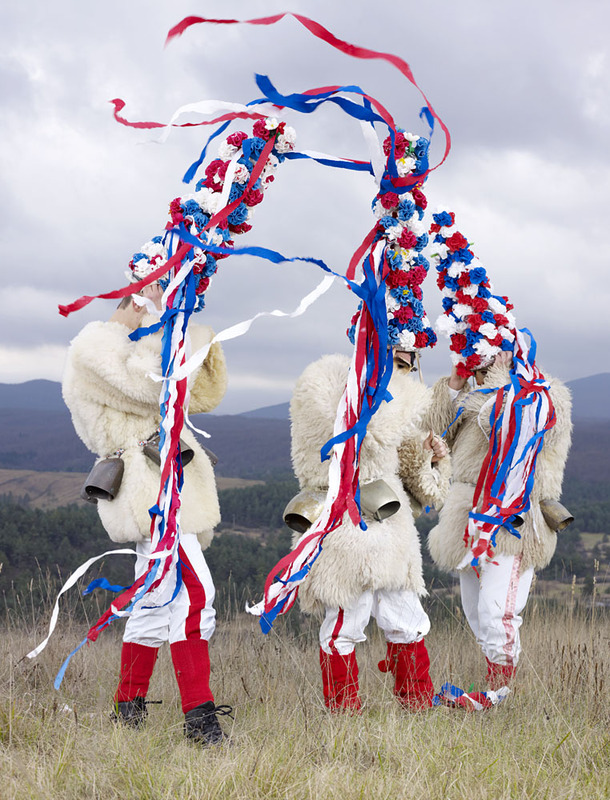 There is one group that stands out the most which originates in Naoussa, Northern Greece, called ‘Yenitsari and Boules’. 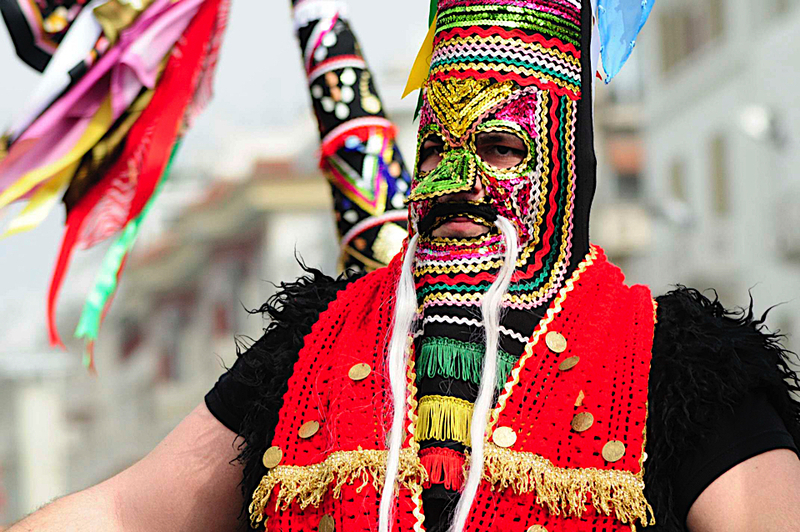 Yenitsari comes from the Janissaries troops of the Ottoman army. 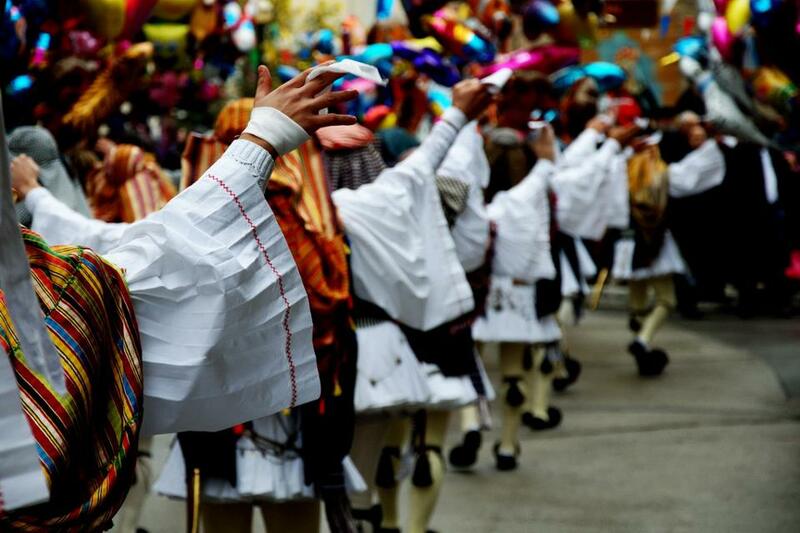 The custom takes place every year during the Greek Carnival. Being in touch with ArisitidisTosios, President of the Foundation for the Promotion and Protection of the custom of ‘Yenitsari and Boules’, gives me great joy seeing the foundation interested in promoting their cause by bringing their traditions and customs forward. It is great seeing tradition been maintained and revived by younger people who are interested in preserving their roots but also adding new elements that will pass on to future generations. 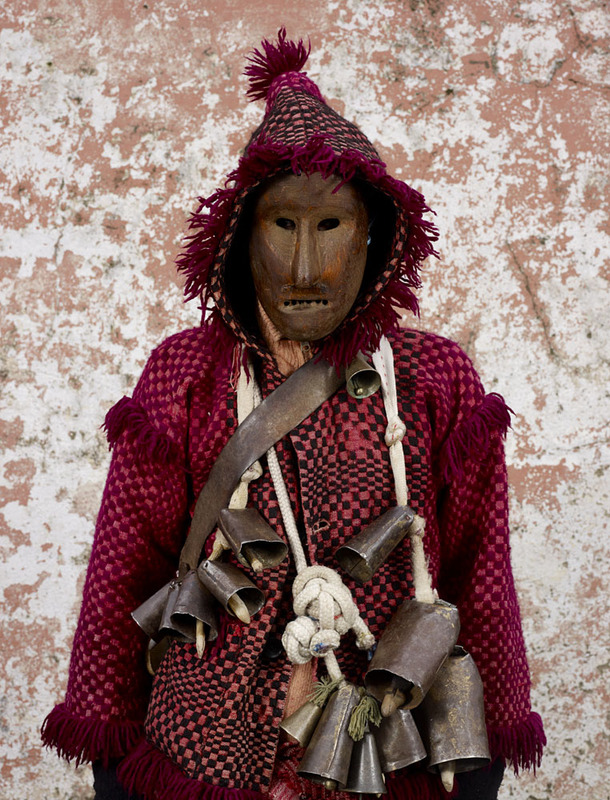 The custom originates, since the old times, in coming of age rituals where a boy is initiated by preparing for war and dresses up as a ‘Yenitsaros’. He is accompanied by unmarried men of his tribe. The mask, he is wearing, helps the boy transform in secret into a man. Boula (a girl’s costume) on the other hand is a representation of the passing from winter to spring, actually the resurrection of sleeping Nature. Both female and male costumes are worn by young unmarried men, all masked. The male dancer ‘Yenitsaros’ has to wear the traditional white pleated skirt, ‘fustanella’ but this time the length is a lot shorter than the one in Southern Greece. The pleats on the skirt are between 250 to 400 depending on the body shape and financial status of the wearer. 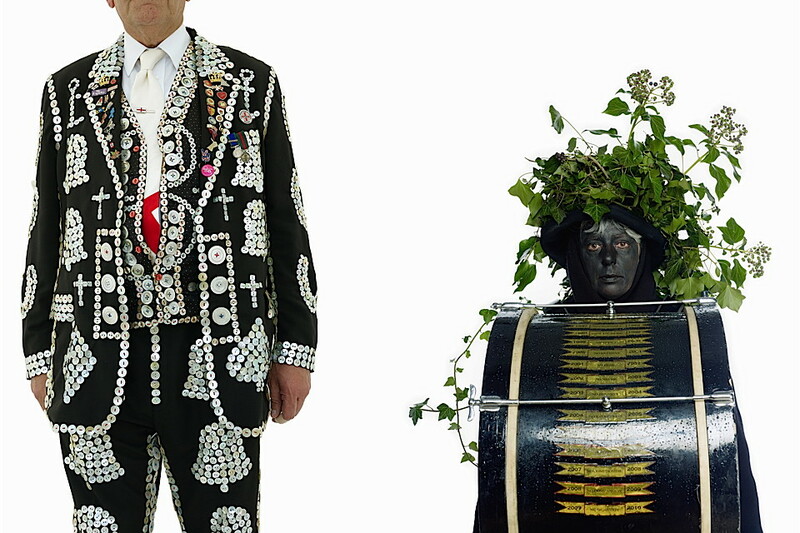 On top he is wearing a traditional shirt (condela) and a vest covered in silver coins. The coins are a symbolism of the man’s fortune. Although being very heavy, it makes beautiful sounds during the performance. Just imagine hundreds of coins dancing against each other. 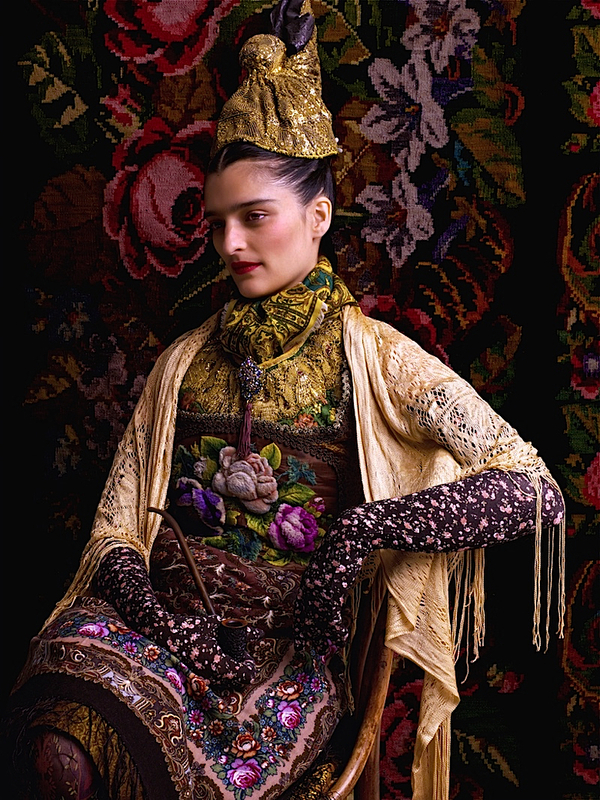 On top of that he is wearing a woolen waistcoat embroidered with golden thread and a headscarf. 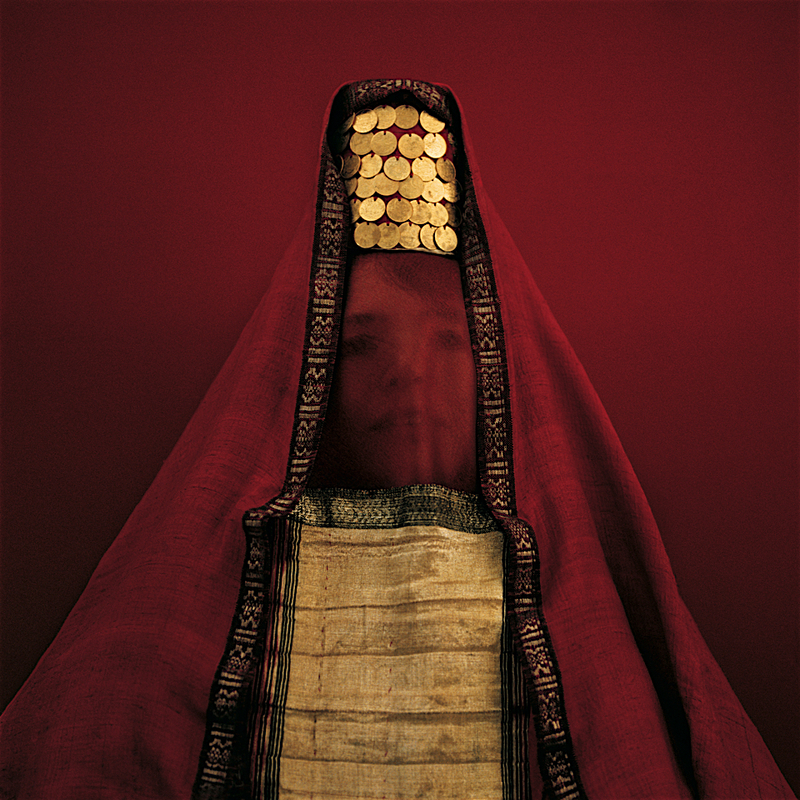 There is a very interesting way the costume is prepared and worn as part of the ritual. This is a very time consuming process that will take overnight to put on. This preparation needs skilled people to assist with the dressing so everything is secured on the body, usually this is done by veteran dancers of the group. During Ottoman times the Yenitsari and Boules custom represented the emancipation of the Greek Nation from the alien rule. The masks, made out of wax, where used by quite a few Greek revolutionary soldiers to hide their identity from the Turks. A lot of the symbolisms, surviving until today, are directly connected to Ottoman Greece and have probably the strongest connection with the custom since it played the most important part. Today the custom emphasizes on the elements of the local tradition with its age, old legends, songs and heroic struggles of being Greek. 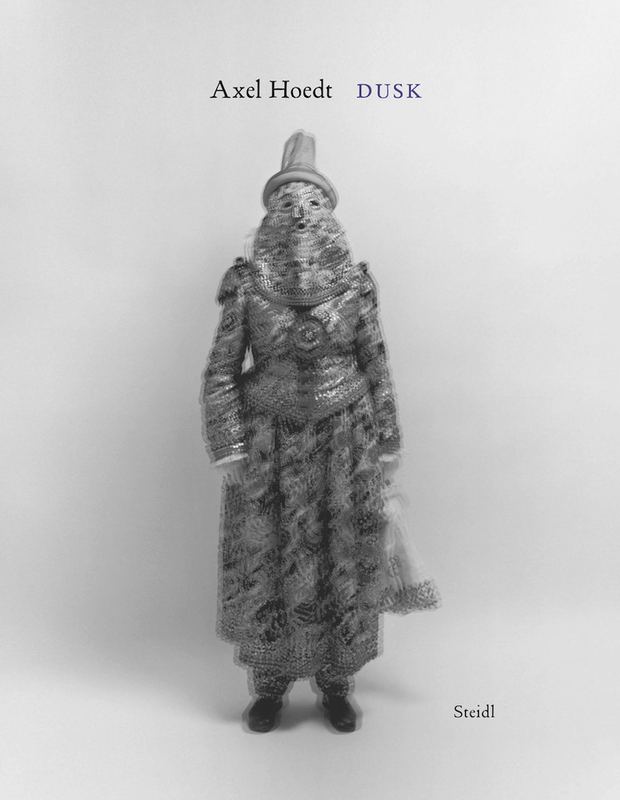 Last month German photographer Axel Hoedt released his new book ‘Dusk’ in London.‘Dusk’, as well as his previous publication ‘Once a year’, explore traditional carnivals in Germany, Austria and Switzerland. 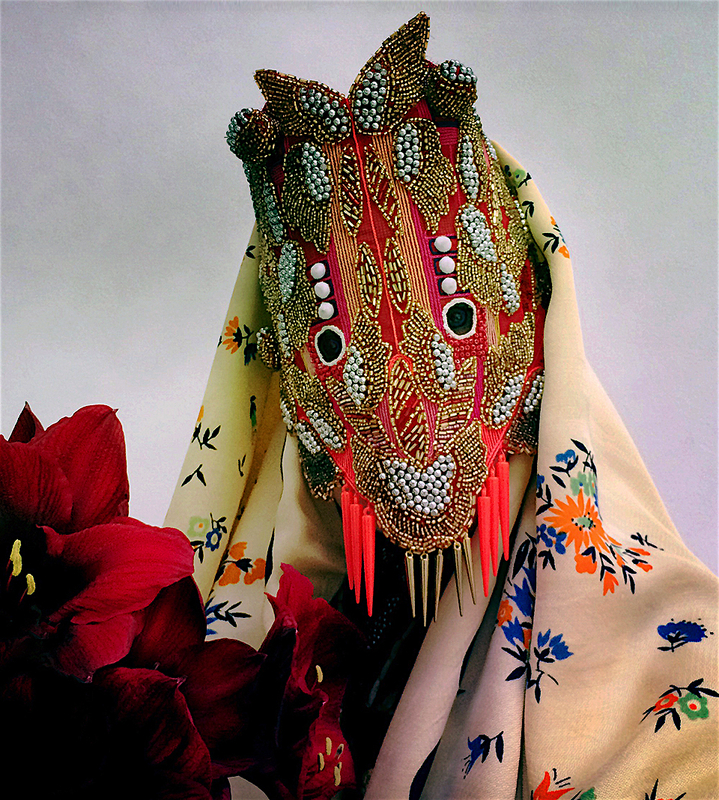 I first became familiar with Hoedt’s work after showcasing his project ‘FASTNACHT’ at the Fashion Space Gallery at London College of Fashion in 2010. 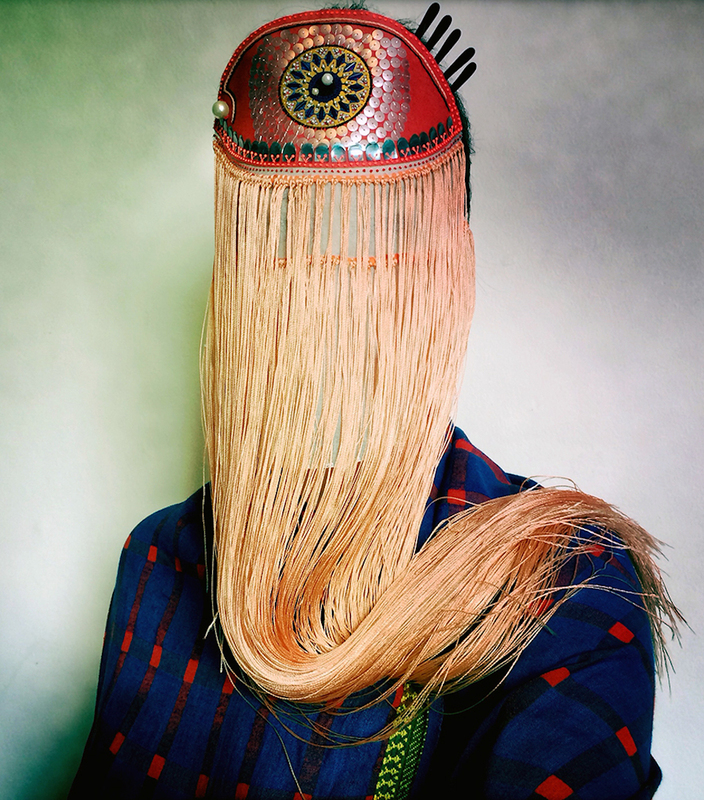 Being a portrait and fashion photographer, Hoedt has a unique way of capturing the carnival festivities which breathe different air to the images. There is a dark, mesmeric element to them; yet despite this they evoke a strong sense of nostalgia. The subjects in the photographs appear to be frozen in time. Axel Hoedt grew up in Frieburg in southern Germany, close to the Swiss and French borders, and later on studied photography in Bielefeld University of Applied Sciences ‘under Gottfried Jaeger and K.M Holzhaeuser who both intensely shaped my photographic vision, and ideas on what photography can be’ as he describes. After working in Hamburg for a few years, he moved to London in 1998. 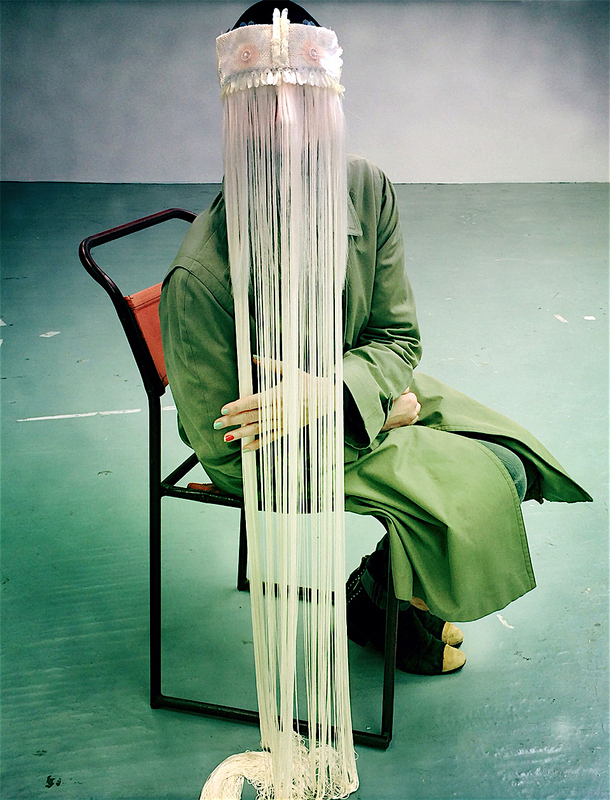 Hoedt has worked for many big publications such as Archivist editions, GREY, i-D, POP, Vogue and Zeit Magazine. 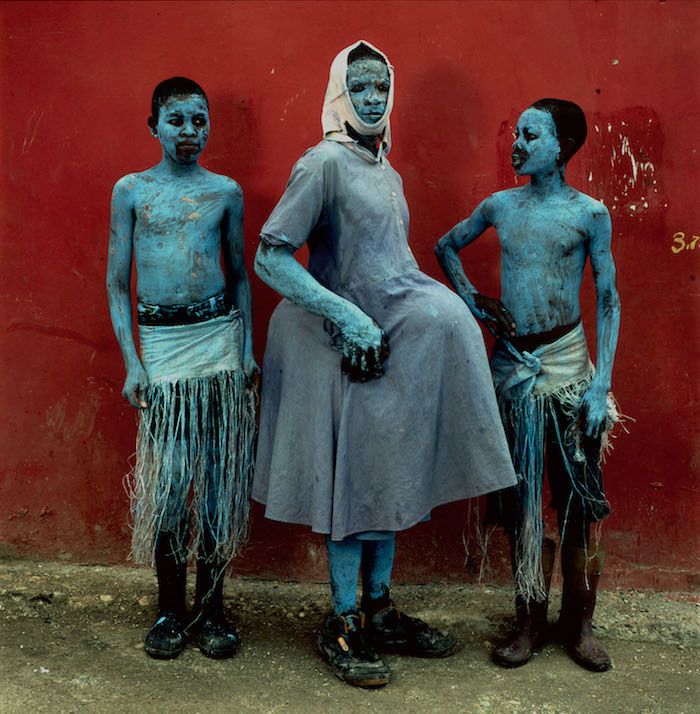 He has also being awarded with the Gold Medal for the Photography of the Year at LEAD Awards in 2010 and has been nominated with the Otto-Steinert Prize of the German DGPh (German Photography Association) in 2011. Are Carnival rituals an ongoing project? When did it all begin? 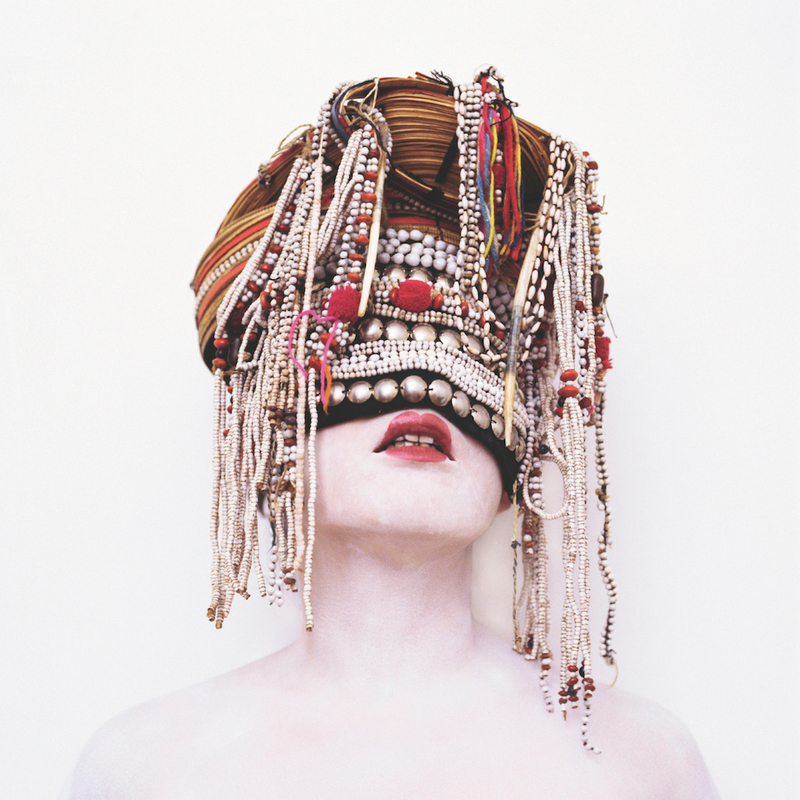 My interest in the Carnival Project got sparked after shooting the completely masked fashion designer JJ Hudson aka NOKI for POP magazine in 2007. 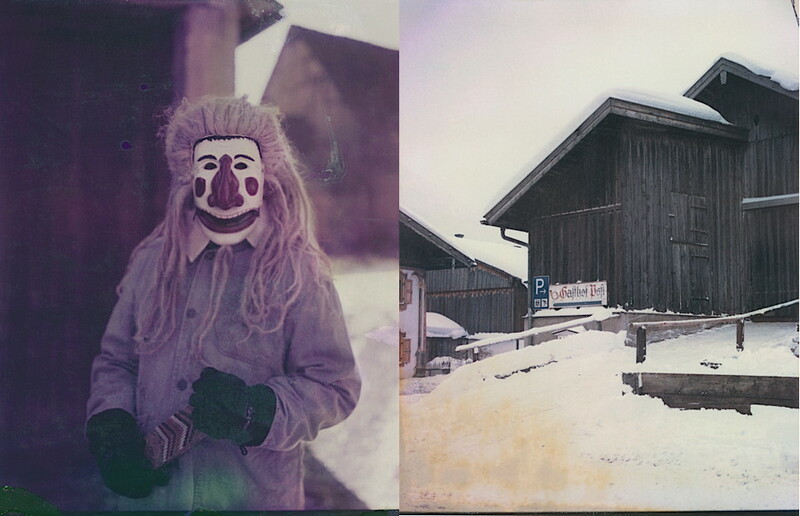 Researching carnival traditions in my native area of southern Germany, selecting the masks and getting in contact with the right people took another year, so that I started shooting in early 2008. First part of the series got published in 2009 in ‘Zeit Magazin’ and from 2010 onwards we were working on the first book ‘Once a Year’ with Steidl (publishing company), which got published in 2013, followed by this years ‘Dusk’. Can’t tell you if this project will continue. Right now I did put a halt to it, and do focus on new challenges. Would you like to work with other cultures too or it is more about exploring your own cultural heritage? The starting point was indeed about exploring things close to me. 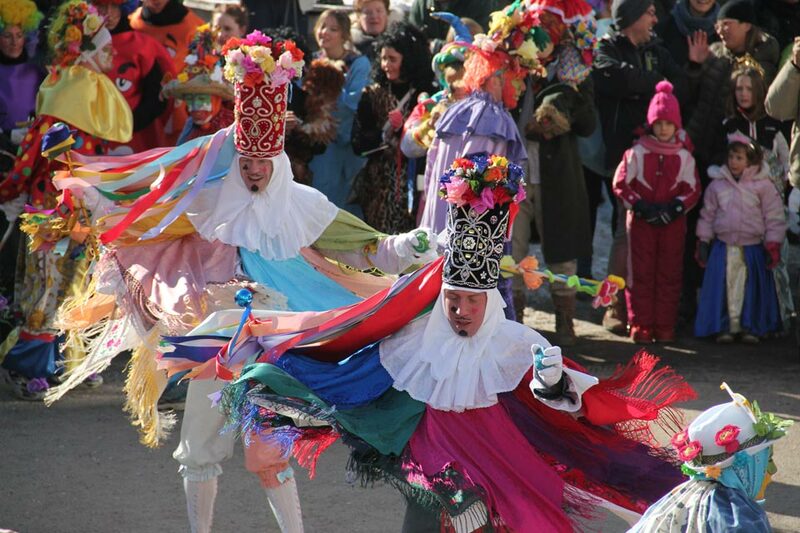 In this case the Carnival traditions of my native region. What is it about the masks that captures your attention? I can see this is something that dominates your work both in traditional but also in fashion photography. How do you manage to marry the two? 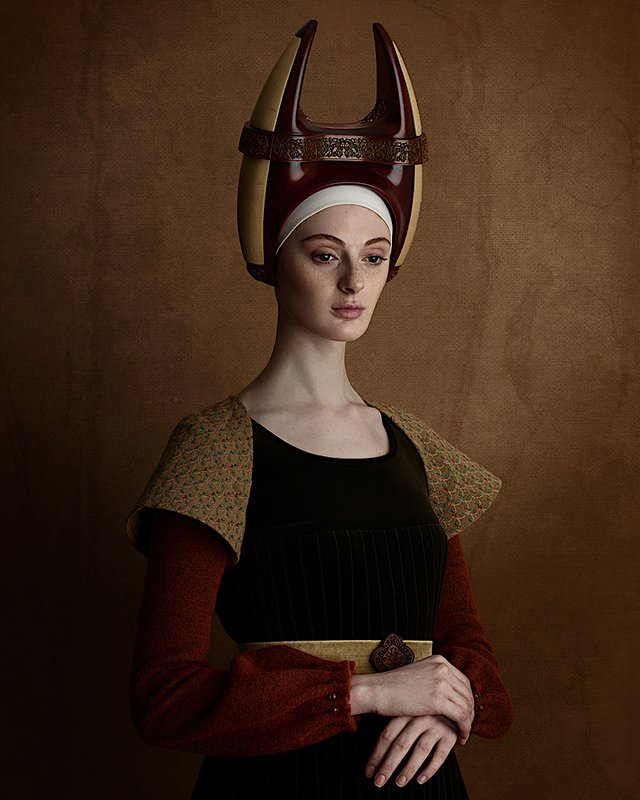 On one hand you create beautiful high end fashion photography and on the other hand intense images that represent traditional elements which still have a very modern vibe. ‘no f**king clue' ...:-) just happens... But honestly, maybe part of the answer is that I do not see a contradiction here at all, I think the two are closely connected. Do you think the rituals can be a part in the modern society or are they part of our cultural heritage who is struggling to be kept on the surface? I do not know the answer to this. But I do know that a ritual, or anything at all in fact, makes only sense if you are fully behind it. And that’s what fascinates me the most about the people I met during the work on this project is they are serious about what they do. How many publications have you released so far and are you currently participating in any exhibitions or events? Two publications:‘Once a Year’,Steidl, 2013 and ‘Dusk’,Steidl, 2015. A collaboration with Jane Howard for Archivist magazine: ‘Three Faces. 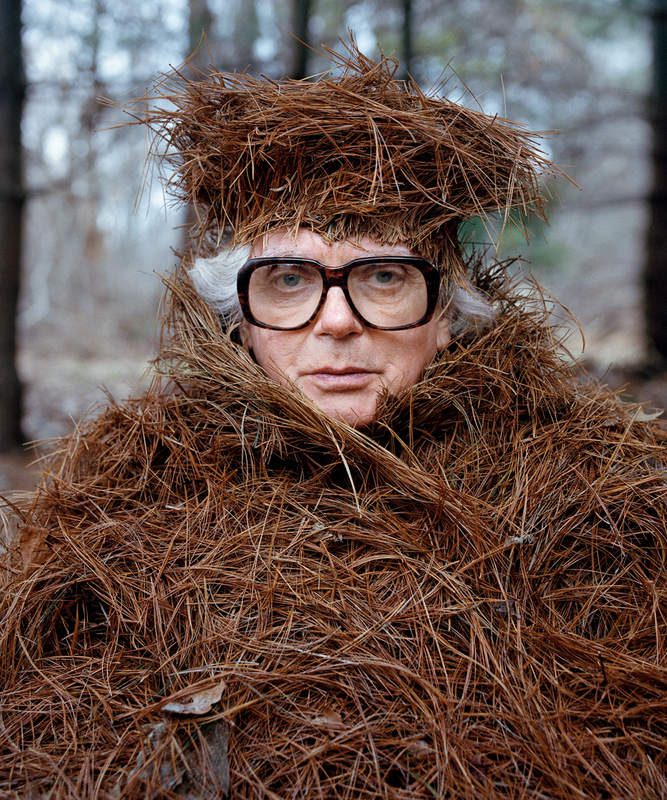 Archive Chalayan’ Archivist Editions, 2014. And a group show is running until March 2016 ‘Designs of the Year 2015’ at the Design Museum, London. 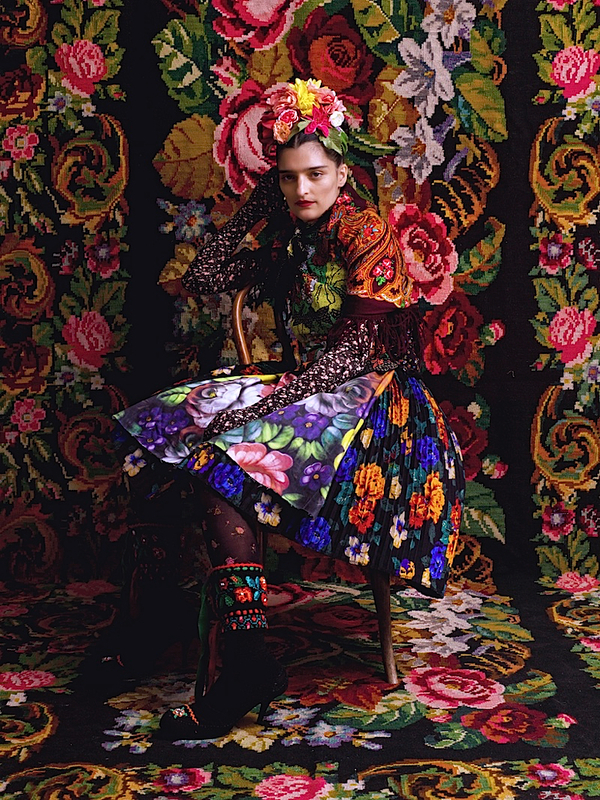 Beautiful high end fashion photography and astonishing presentation through a mix of contemporary graphics breaths a completely different air to the label with the traditional and cultural inspiration. This is the perfect recipe, to mix something old with something new, and create an unexpected outcome that catches everyone’s attention. What is the idea behind Susanne Bisovsky and the label? A long lasting and intense approach and, if possible, not walking right into the trap of the so-called world of fashion and lifestyle. We are working with many aspects of historic clothes (because it is not long ago since conscious clothing has started out), old technologies, new techniques as well as contemporary influences we find acceptable. The wheel should not be reinvented again. Paradox enough, but that is what we attempt in our haute couture salon. When was the label established and which other designers did Susanne work with during her earlier career? The label was established nearly 20 years ago. In the first year at the Academy of Applied Arts Fashion Department, Vienna, Susanne Bisovsky was engaged by J.C.Castelbajac to work in Paris. After that she designed for Helmut Lang, Kathleen Madden and a number of German and Austrian labels producing traditional clothes fashion. In 2000 I got involved with the label SUSANNE BISOVSKY. How do you chose the textiles and silhouettes you are working with for each season? We develop a lot of designs for fabrics. We scout through archives, and we read a lot (of books) to be able to look behind the currently clichéd surfaces. The silhouettes are basically and always nearly the same (…the wheel). Are you working on a new collection at the moment? Right now we are working on the image between a sweet Viennese girl, serving a cup of hot chocolate and a well dressed lady under a slightly tamed influence of Balkan and Gypsy glitter, and it is called ‘Viennese Chic’. But in general we try not to think in collections or seasons. We also believe that clothes can be used for a lengthy period time and could occasionally be combined with something newer. More a kind of modular system than catching the hectic and meaningless sequence of trends. We really do live in a parallel universe and what we are interested in is barely reflected within contemporary society. The minimum which satisfies people nowadays makes us wonder. There is a lack of education. So what kind of tradition are we talking about? When people propagate ‘tradition’ they usually describe something frozen. And from that point of view new traditions are not needed. All we do is to surround ourselves with old/-er and experienced people and have wonderful conversation. 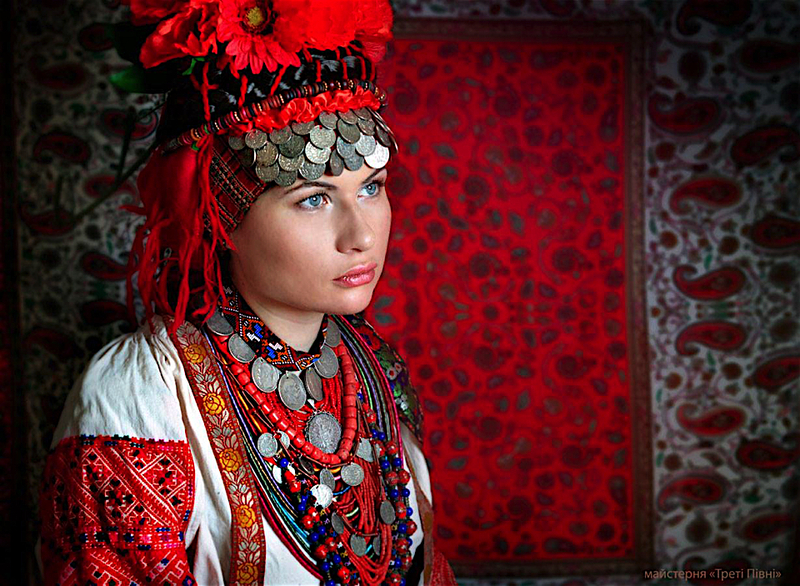 What is about the folklore culture that fascinates you? There are no words to describe the emotional reaction provoked by the ‘Eyes as Big as Plates’ photographs, such is their unsettling nature-fuelled power. Talking to Riita and Karoline, the duo behind the project, we get to know in greater depth what is happening behind the preparation of each project and understand better how they manage to produce these beautiful pieces of work. What is the idea behind Eyes as Big as Plates? How did the two of you come up with this idea and what are your individual backgrounds and aspirations? 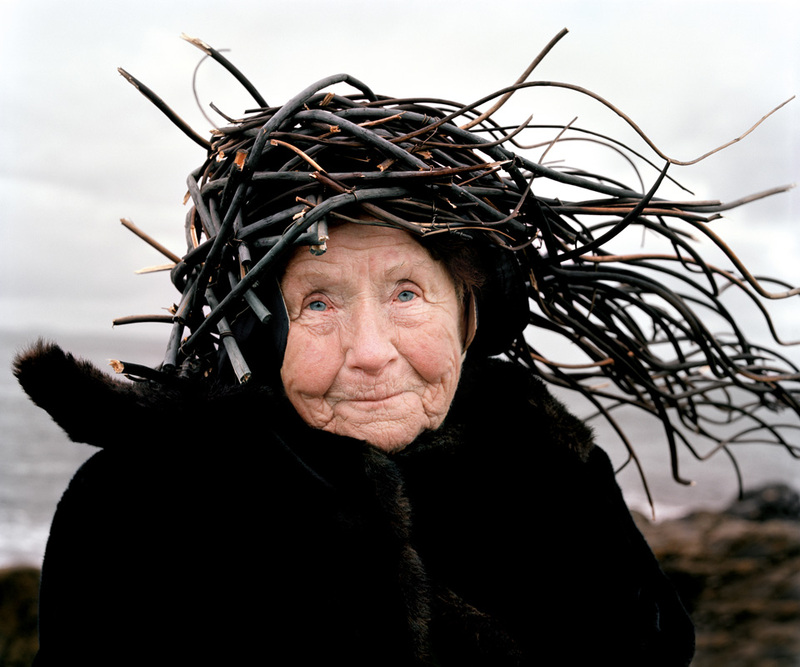 What is it that fascinates you about elderly people? Starting out as a play on characters from Nordic folklore and the personifications of nature in the lore, we wanted to find out what kind of connection the Norwegians had with their rocks, fjords and hills. Those hills hadn’t changed since the tales, but the people sure had. We figured that the older the local interviewee/model, the closer we would be to the folk facts and the talking rocks of the tales. 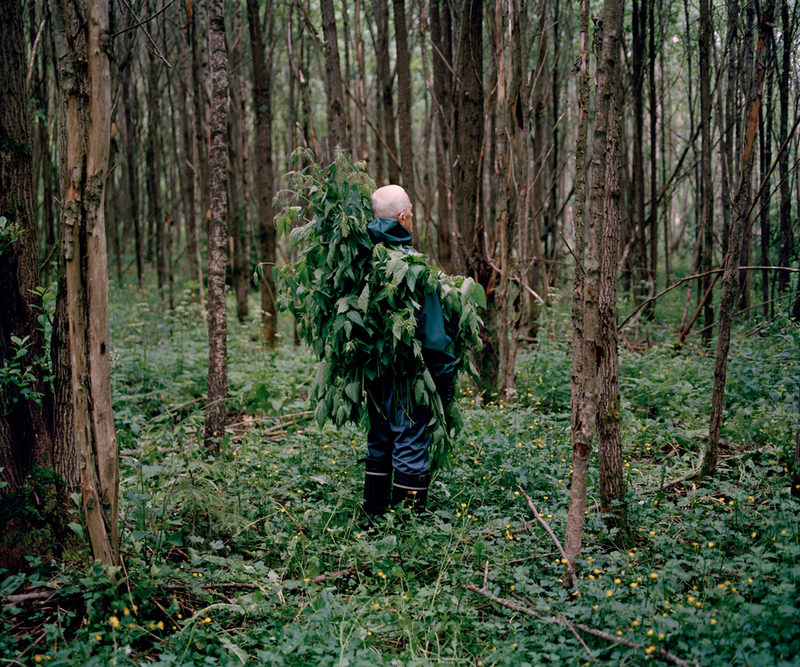 After interviewing the residents of Sandnes in the South West of Norway for a couple of weeks, we shifted our investigation towards imagination and Eyes as Big as Plates evolved into a search for modern human’s belonging to nature. The series is produced in collaboration with retired farmers, fishermen, zoologists, plumbers, opera singers, housewives, artists, academics and ninety year old parachutists. These are people we meet through friends, relatives and newspaper ads in hardware stores, noodle shops, indoor gardening society meetings etc. Since 2011, we have portrayed seniors from Norway, Finland, France, US, UK, Iceland, Faroe Islands, Sweden and Japan. Greenland will be the latest addition to the list in October 2015. 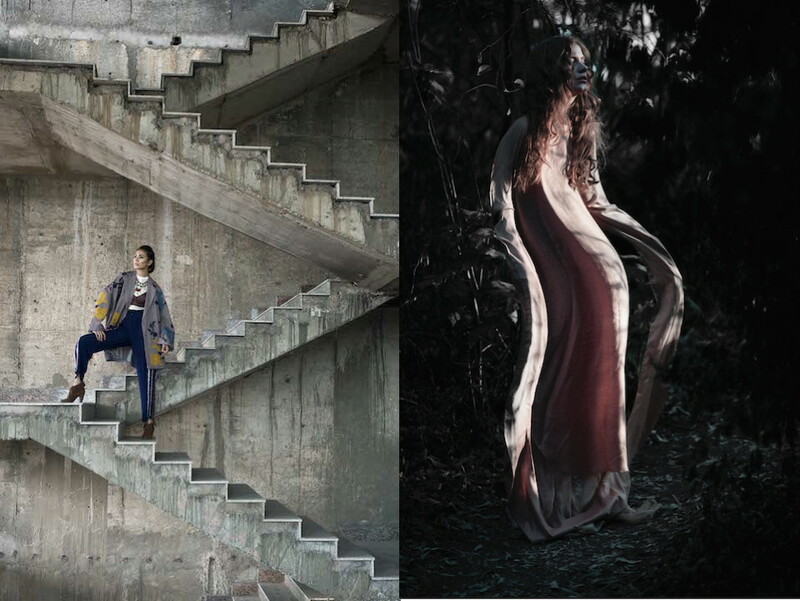 How do you chose the materials and silhouettes of ‘costumes made out of nature’ that will be worn during each the shoot? Does the choice depend on the personality of each character you are photographing? That’s exactly right. Most often, and ideally, we meet our model before the actual shoot day to chit chat about the world, life, interests, neighbourhood, relationship with nature, opera, moss, fishing, weather…, and see if there is something there that we can just magnify a little. Sometimes we get to meet only via email or phone before heading ‘to the hills’ with cameras and twigs. Either way, we try to find out as much as possible about who our model and collaborator is beforehand in order to best present them and their relationship with their surroundings. The ‘costumes’ are just a primal response to real people in their settings. Are you working on a new project? Should we expect to see more from Eyes as Big as Plates? We are working on the latest images from Japan at the moment. We are also headed to the very north of Norway in June for an ongoing documentary project with the New Kirkenes Hospital. October will take us to Greenland for a new show and some new shoots, and in September we get to return to the unforgettable Faroe Islands for an exhibition at the Nordic House. Twelve works from the series are currently on show in Bogota, Colombia and we are also very happy to be a part of a wonderful group show that just opened at the Gallery FACTORY in Seoul, Korea. We also both have our individual practices running alongside Eyes as Big as Plates. How long does each project take? Do you travel a lot? How much research do you conduct in advance of visiting a new group of people to photograph, or it is more spontaneous? We take as little or long as we have for a shoot, it has happened in a matter of minutes and over several days in the past, the ideal situation would be to have a chance,or two, to talk and get to know the model, and then another day to go out traipsing to the woods. As we are just a team of three -Karoline, Riitta and Model- we can be very flexible in the moment. As much as there can be planning, there can also be rain/wind/sun/tornadoes/snow/illnesses/transport troubles/pests/allergies/technical issues. There are too many variables to take the shoots too seriously, so we just roll with the process and do our best to show up prepared. We might do research on the most distinctive/dominating flora of the region or check out the vegetation in the green areas, this has been especially helpful in the big cities we have worked in, but ultimately it is the models tale that shapes the gear,and the day. We just got back from Japan where we stayed for two weeks. In that time we managed nine shoots in five different locations. A big thank you to that goes to the gracious Ms. Akemi Date from the Royal Norwegian Embassy as well as a countless number of supremely helpful locals we met along the way. We find folklore fascinating for it explains phenomena that were perhaps scientifically or otherwise unexplainable at the time. Folktales often made complex natural and sociological issues understandable and accessible, with phenomena taking on forms and characteristics that even a mere mortal could have a dialogue with. Perhaps our Eyes as Big as Plates images aim to discuss the contemporary human’s belonging to nature in a similarly approachable language. Through conductive research in European Carnival, a very interesting ongoing project was found entitled Carnival King of Europe. 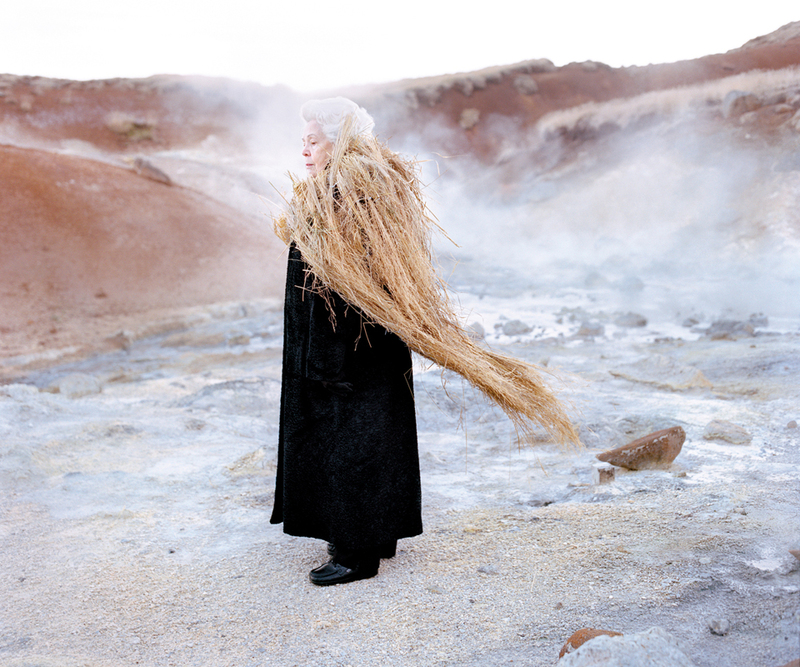 This project focuses on winter fertility rituals. The coordinator and promoter of the organization and social anthropologist, Dr Giovanni Kezich, was able to answer a few questions about the project. What is the idea behind this organization, what does it stand for and which countries and institutions/museums does it involve? - Mucem (Musée des Civilisations de l’Europe et de la Méditerranée) of Marseille - France. - Etnografski Muzej, Zagreb of Zagreb - Croatia. - Ethnographic Institute and Museum, Bulgarian Academy of Sciences of Sofia - Bulgaria. - Nacionalna Ustanova Muzej na Makedonija of Skopje - Macedonia. - Euskal Museoa. Bilbao. Museo Vasco of Bilbao - Basque country, Spain. - Slovenski Etnografski Muzej of Ljubljana - Slovenia. - Complexul Naţional Muzeal Astra of Sibiu - Romania. - Państwowe Muzeum Etnograficzne w Warzawie of Warsaw - Poland. Who are the people behind Carnival King of Europe? Museum curators, visual anthropologists, ethnology fieldworkers. 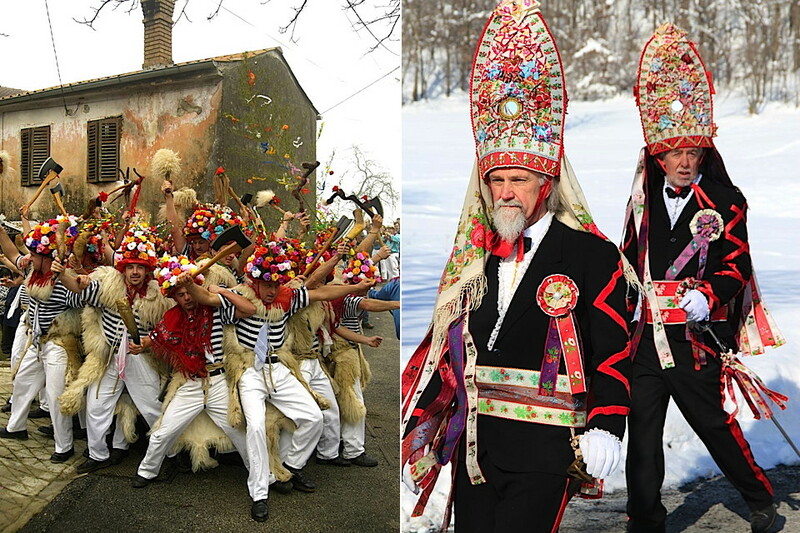 Carnival King of Europe is a project of ethnographic research, a website, a DVD film, and an entire video archive, an itinerant exhibition, which has so far reached, from San Michele all’ Adige, Bilbao, Warsaw, Ljubljana, Zagreb, Sibiu, Sofia and Skopje. So, small international teams of fieldworkers were set up, for example Polish, Italians and Macedonians, to go to Romania, with the Romanian colleagues acting as interpreters. This has been possible through the professional network of ethnography museums. A third phase of the project is likely to invest some 16 or 17 European countries, reaching has far as Portugal, Belgium, Hungary, Czech Republic, Slovakia, Serbia and Greece. This will possibly materialize later in 2015, on the ground of some more support from the EU. What we would like to do is to compile a general atlas of European winter masquerading: this has already been done in some countries (Portugal, Spain, Bulgaria), but we still do not have the overall European picture. How long does each project take? Do you travel a lot? How much research do you conduct in advance of visiting a new place to document? For about four years (2007-09 and then again 2011-12), we have been able to be constantly on the move for the duration of the time of winter masquerading, which is from early November until early March. This has meant traveling a lot, mostly by car because it is cheaper, especially if you have to reach remote villages with filming equipment. 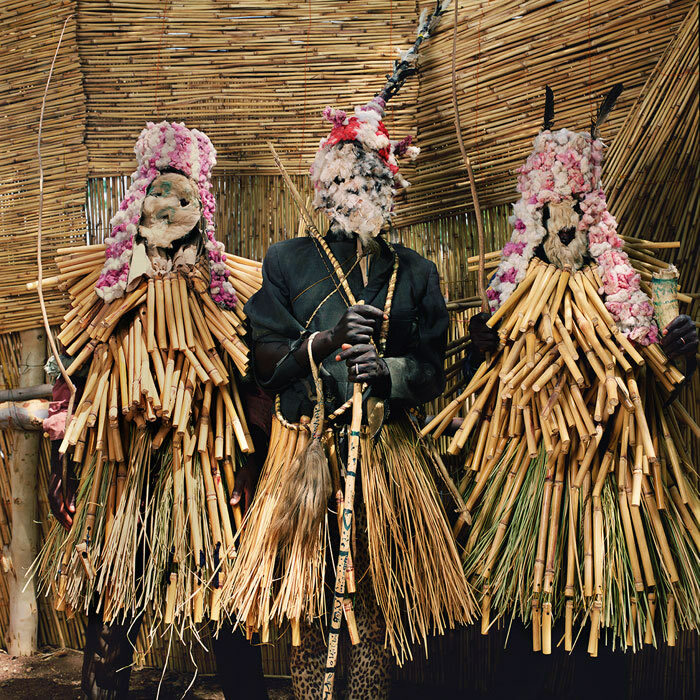 In this way, we have been able to document, from 2006 to 2015, about 80 masquerades in 11 countries, which is really a considerable result. Clearly, we are making every effort to be reasonably prepared about what we are going to see, but this is extensive, comparative ethnography, not social anthropology, and in each one of the places we visit we have to make the most of a one day’s stay. On the field, we do not only film and take stills, we also collect bibliography, we interview people, and we try to capture as much information as possible. Are you interested on how tradition can be interpreted within contemporary society through the exploration of art & design for example ? Yes, why not? We are not carnival talibans. There’s a Bulgarian sculptor, Vasil Dimitrov, for example, who has completely reinvented the figure of the kuker, and another one in Croatia, Zarko Lucic, who has done about the same thing with the zvoncari masks. 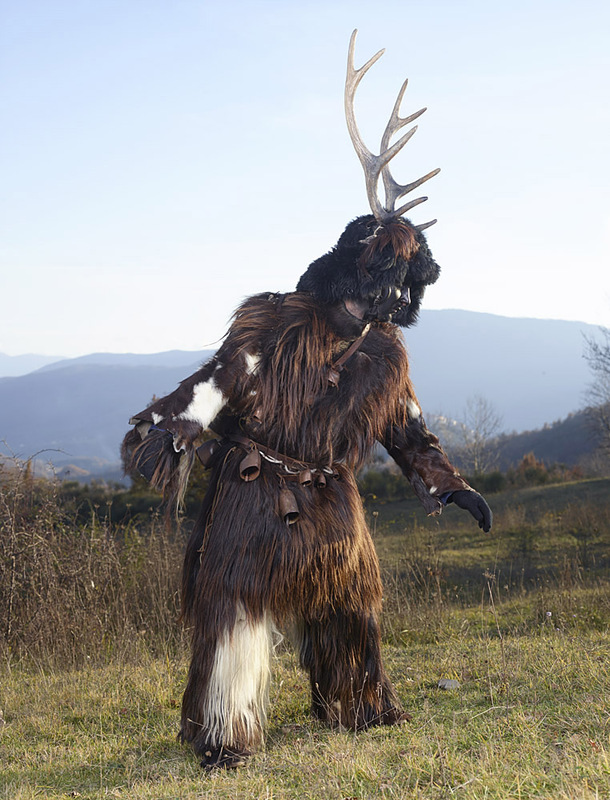 A whole new vogue of devils’ masks – they are called the krampus - has been created in the last few year in the Eastern Alps, on the Austro-Italian border: these are now quite horrifying, in an unprecedented fashion. Masks are reinvented all the time, mostly through minor adjustments which show their durable impact only with time. What is about the carnival festivities that fascinates you? 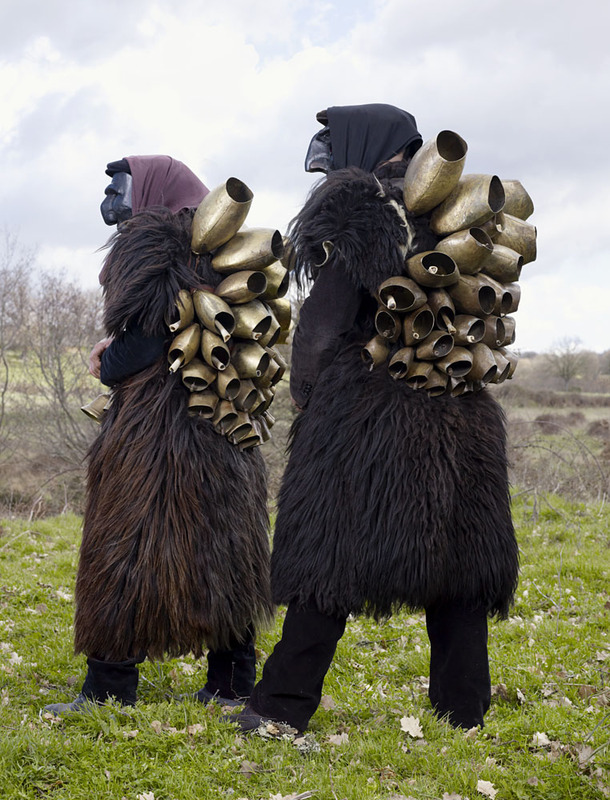 The fact that at their core, in their traditional form, as seen in a village context, masquerades are identical everywhere: there’s a first phase which is scary, with hairy figures that go around shaking the big bells that hang from their waist, a second phase which is ceremonial, mostly with a mock wedding, or possibly the rite of ploughing, and a third phase which is burlesque. In spite of the running rumour that carnival must be a free-for-all, everything is really quite orderly and very predictable, as in liturgy. To decode the meaning of this liturgy is the ethnographer’s task, and it is fascinating. Then we will have to trace, far back in prehistory, the origins of this magic, and the foundations of its reasoning. Do materials used for costumes vary in each country? Are they different from previous generations? Materials vary a lot: facial masks can be made of wood, of paper, of metal, of anything, and also the materials of the costumes vary a great deal. Yet the general concept of each figure stays the same across Europe, where in traditional village carnival no more than a dozen different templates are made use of for creating the costumes: and these templates are very evidently the same, from the Balkans to Iberia. What do you feel about the new generation? 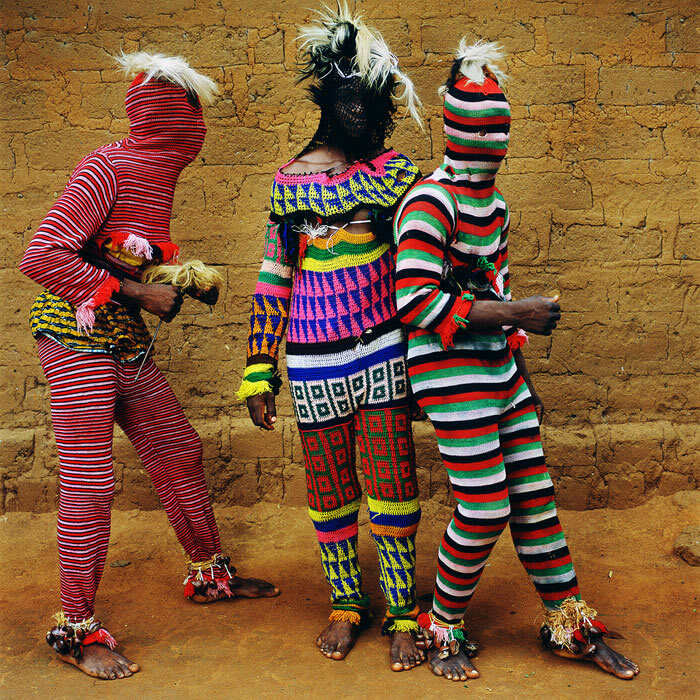 Do you think they will carry on the tradition or is traditional masquerade and rituals something that is slowly fading away? 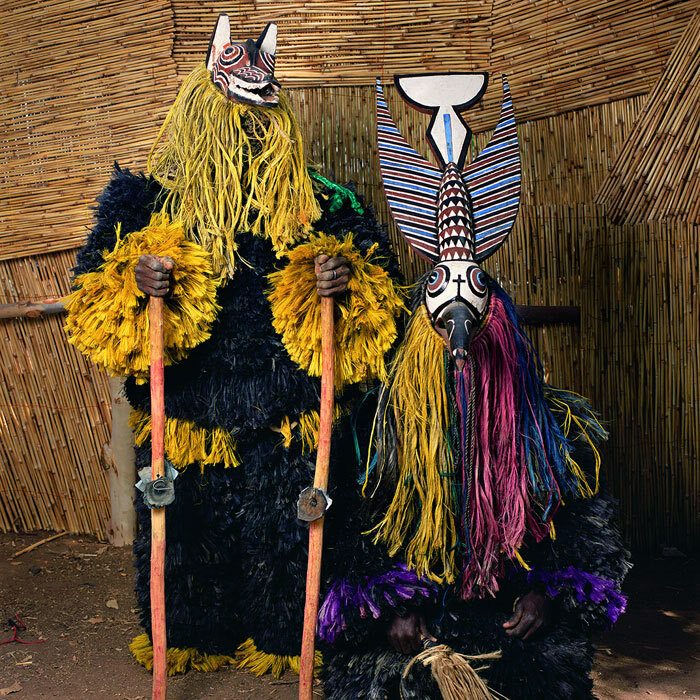 Masks and masquerades are currently on the upsurge: many are being rediscovered or revitalized, and the old ones are found to attract increasing support and participation. This is a complex phenomenon, which has to do with the construction of local identity and the sense of ‘belonging’, which is very much sought for in these days. Generally, especially in the rural part of Europe, the youth goes for that a lot, so that mask and masquerading are now going to survive for at least one more generation. Researching for publications that document rituals and carnivals in Europe, especially in Eastern and South Eastern Europe, is very limited. 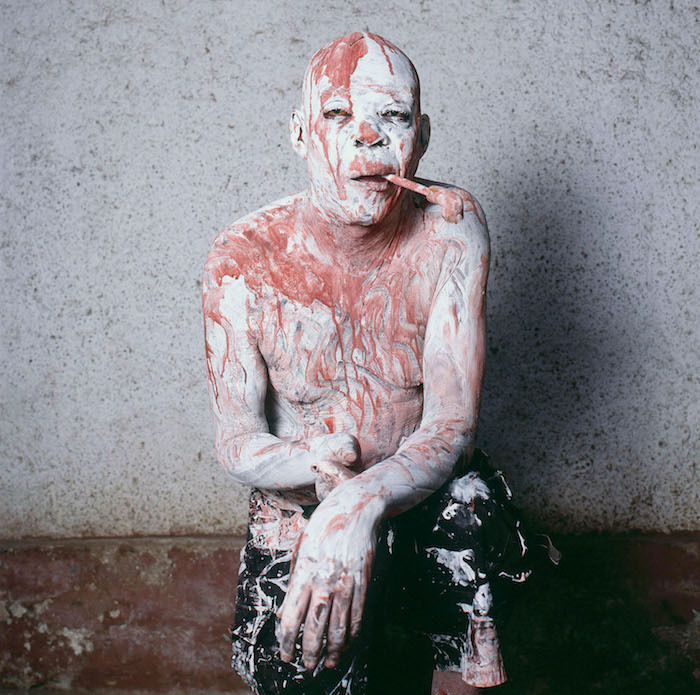 When “Wilder Mann: The Image of the Savage” was released by Charles Fréger, in five different languages – English, French, German, Italian and Japanese, it was a big excitement for everyone interested in traditional rituals in Europe. 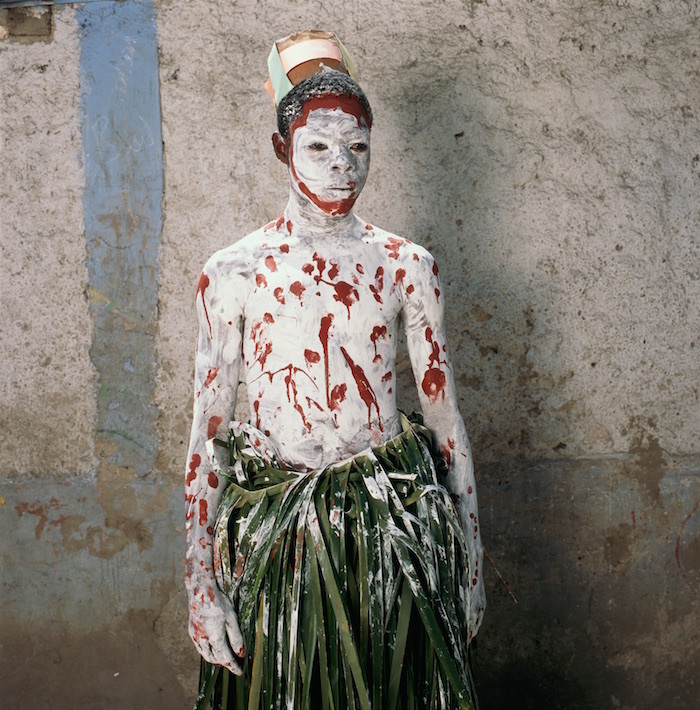 These traditions were documented and perceived through the lenses of contemporary photography. 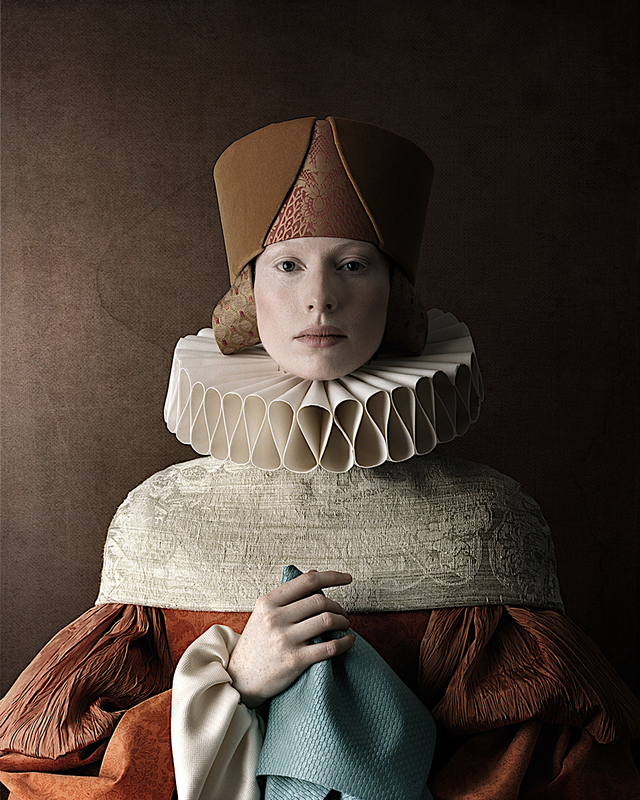 Charles Fréger is a French based photographer with a Fine Arts photography background. His work is a mixture of contemporary and traditional elements in communion. In 2002 Charles founded the “Piece of Cake” project. POC is a network of new generation European photographers where all the members meet, evaluate each other’s work and invite new members to join in. There are workshops conducted biannually for further feedback and networking. ‘It is very important to have a group of people to relate and have an honest feedback supporting their work’ as Charles agrees. Additionally to the European group, a few years ago, an American POC group was founded by American photographer Cara Phillips. These two groups exist separately, having the same methodology and interacting with each other. As Charles explains Wilder Mann and folklore research is a very personal project. 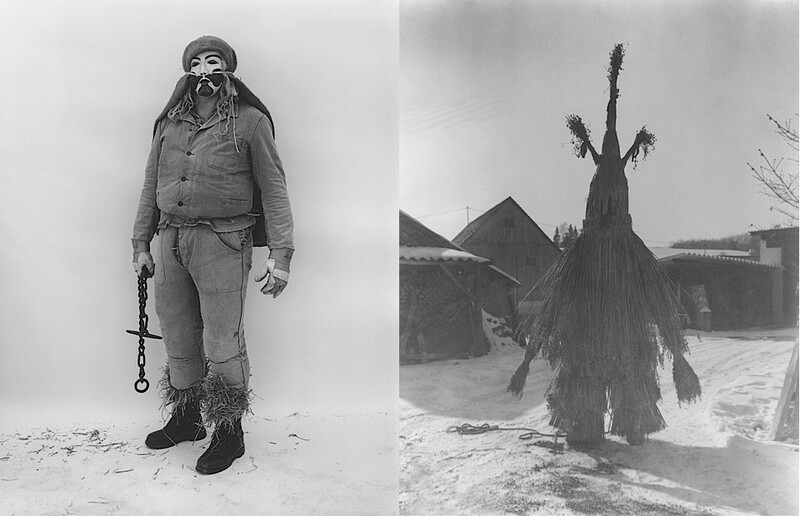 During the production of the Wilder Mann series he became very much connected to the Romanian and Bulgarian folk culture. Overall there are a lot of common elements within the countries the book refers to. 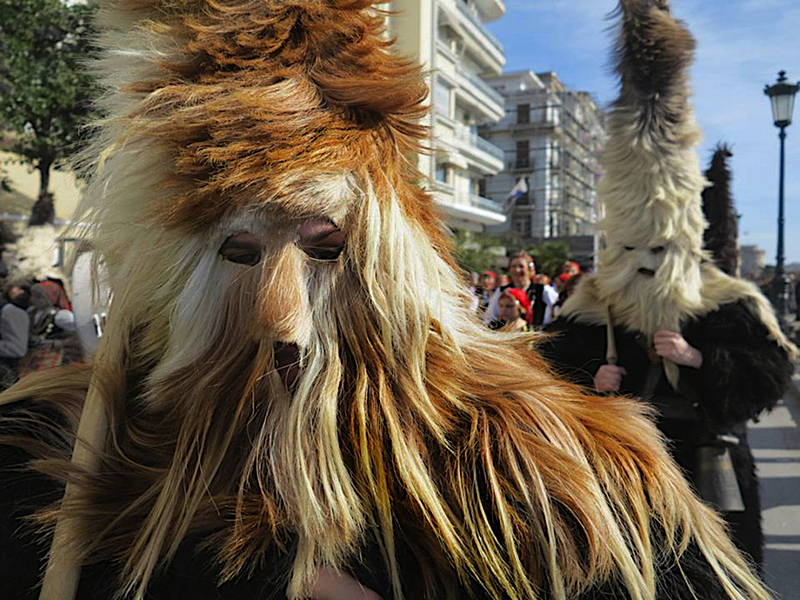 The rituals take place at the same time of the year, using the same type of materials - animal skins, horns, tree branches and bells. Despite the common elements he keeps finding new characters – identities. What is fascinating in his research is that each group has its own peculiarities. There is a lot of research and preparation before visiting each place, he has a list of groups he wants to take pictures of and then he arranges a visit to meet the groups and spends some time with them to document their costumes. This is usually done outside the context of these rituals. 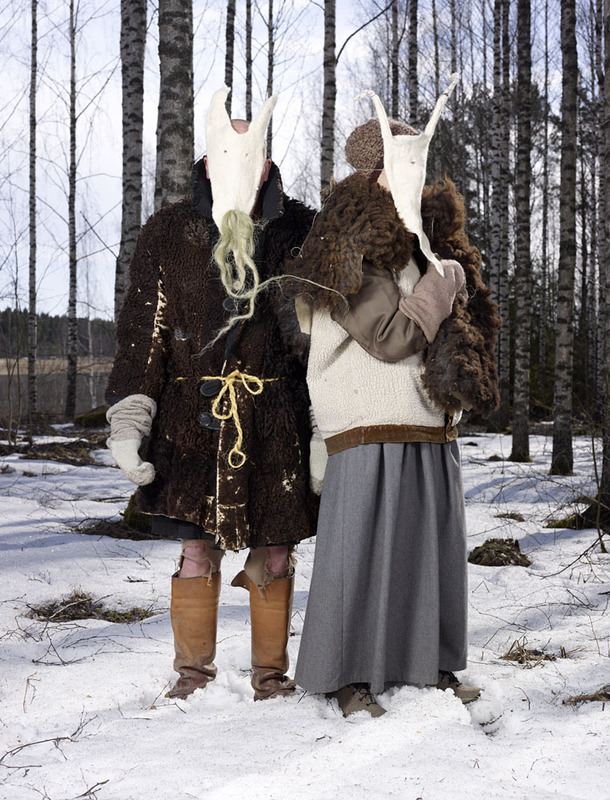 Wilder Mann focuses on the more animalistic and primitive costumes one can find in Europe. 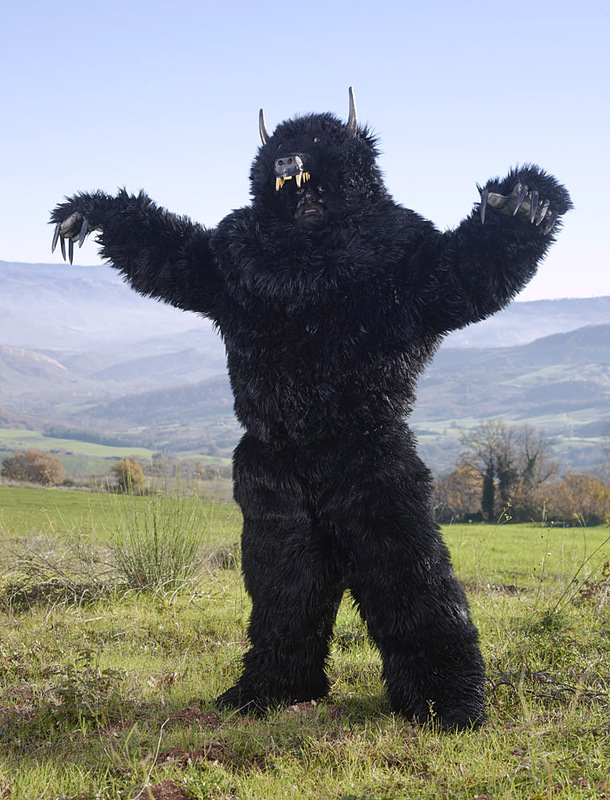 The reason behind choosing to capture specific type of characters and their community is the fascination by the ‘twist and desire’ of someone dressing up like a goat or a bear. Wilder Mann project is developing at the moment, there will be more exhibitions to see in the future with new and exciting additions to the current research. 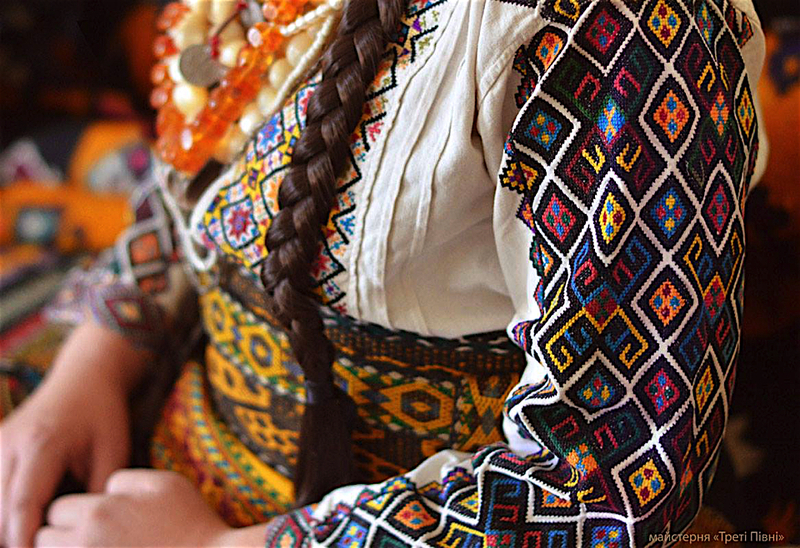 Folklore is part of every culture closely connected to the soul of the community it belongs. In modern society major folklore elements are fading away. In contrast it is very exciting that a new growing movement of artists and craftsmen is flourishing inspired by it. Photographer Phyllis Galembo perceives this change in a positive way. Maybe it is ok for tradition to fade away. Maybe in a way things just transform and still carry on looking differently, adjusting to today’s society and needs. “Maybe something, in 20 years from now, will not exist anymore but maybe this will be replaced by something else. This is part of the process. People of modern world are looking for something different”. As she describes “people today want to belong to the group, to the mass, than the individual”. 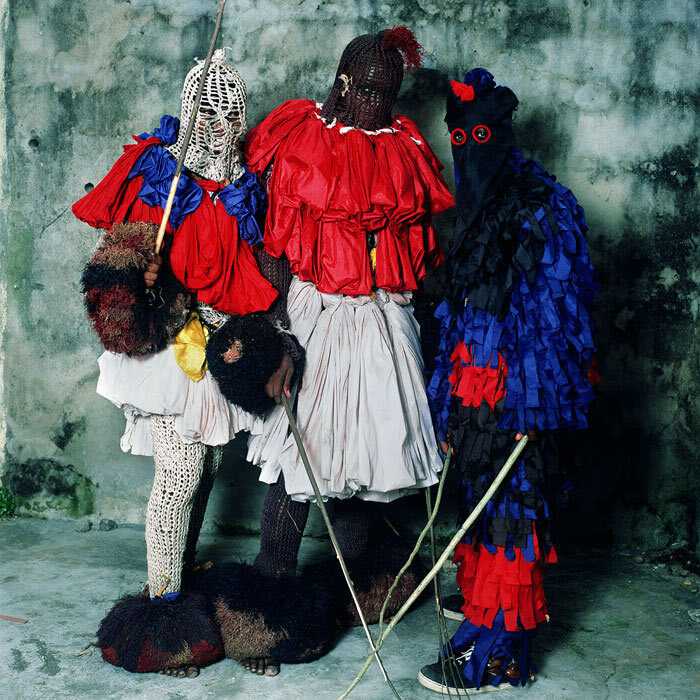 Folklore or more specifically traditional masquerades, carnivals and rituals should be used as a medium to reinterpret our culture in the context of modern society. Rituals might be aesthetically different in every country but behind them the concept is the same, the same need for prayer for fertility and dispersing the evil. 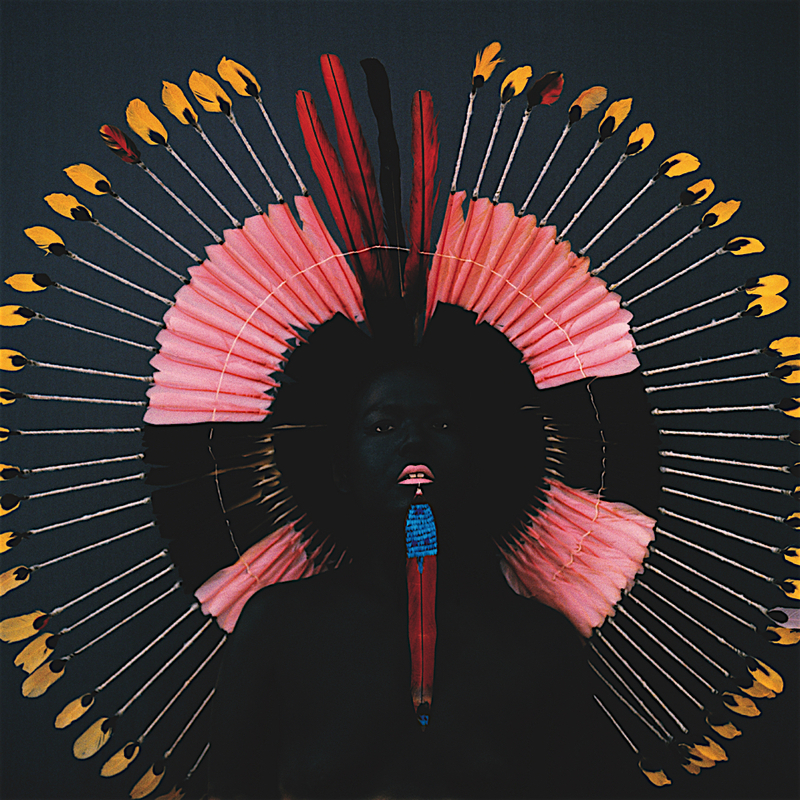 Phyllis Galembo is a contemporary photographer based in New York. From the beginning of her career she has been working on her own projects. She is teaching photography at the Albany State University, New York which also gives her the freedom to develop her work. What can best describe her images is the brightness and vividness of the colours she captures. The way the image is taken is a testimony of her aesthetics and style. She uses many traditional photography techniques and methods, such as a film camera, instead of using the latest technology, which makes her work, stand out. 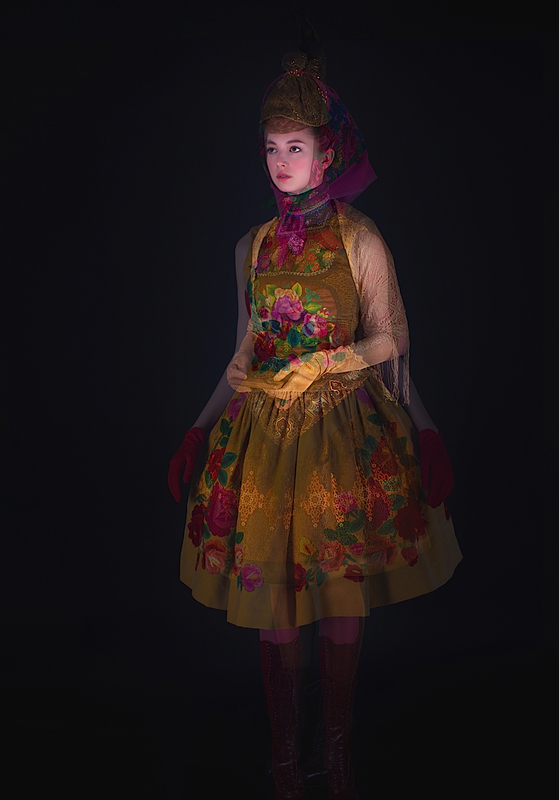 Phyllis tries to capture what she calls real colour, whatever the colour might be, and she uses a portable lighting studio to achieve “rich colour” to her photographs. From an early age Phyllis has been fascinated by the rituals from a photography point of view. Her original research on rituals began in 1985. Since then she has been travelling mainly in countries of Africa and the Americas, including South and Central America, Mexico and the U.S. She tries to document things as they are and it is always a bit of a surprise when she finds something new and different. This is very exciting as people’s imagination has no limits on what they can come up with. 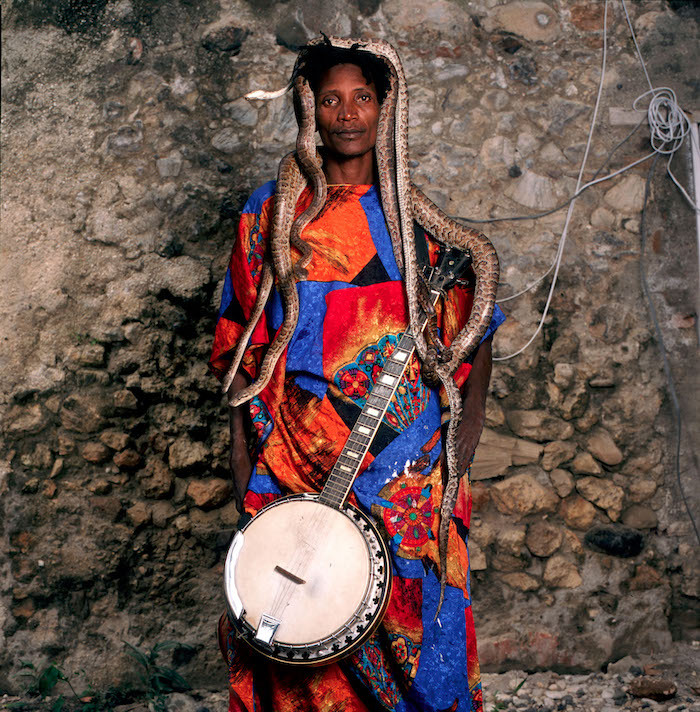 She has been researching African rituals (South Africa, Nigeria) and South America (Mexico, Brazil, Cuba). 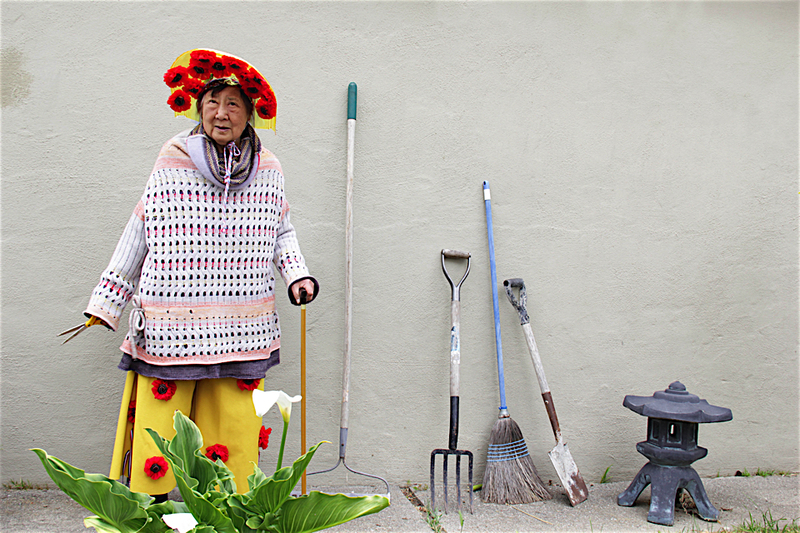 She collected, later, over 500 American early Halloween costumes for one of her projects on masquerade. It would be interesting one day to do a timeline on her work and trips around the word. 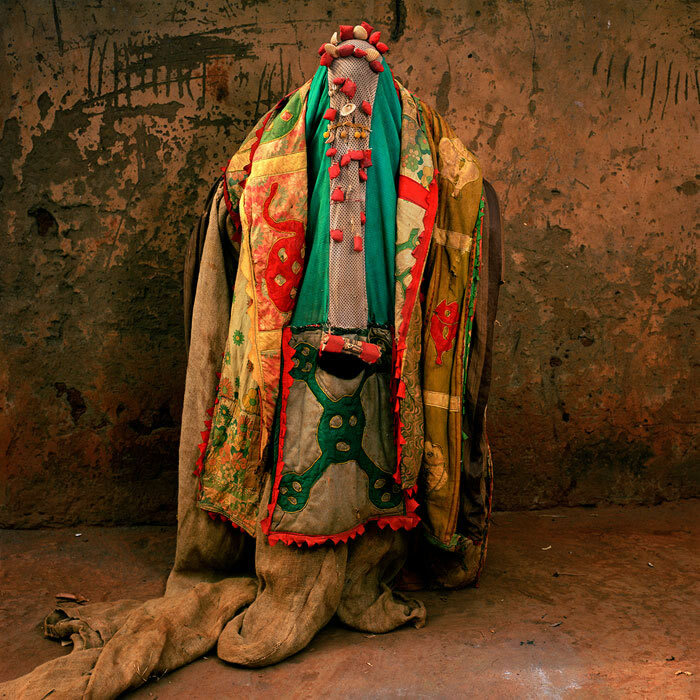 Currently she is working on a new project around Carnival Costumes in India and Mexico and clothing of diviners and initiates in South Africa although she is always open to new suggestions and places to document. The concept behind the pictures she captures is to “celebrate the originality and creativity that people have”. Most of the people behind these images are traditional costume makers or tailors, also people who are very passionate about the rituals. The materials, used in the costumes she captures, have changed and evolved over the past few years. 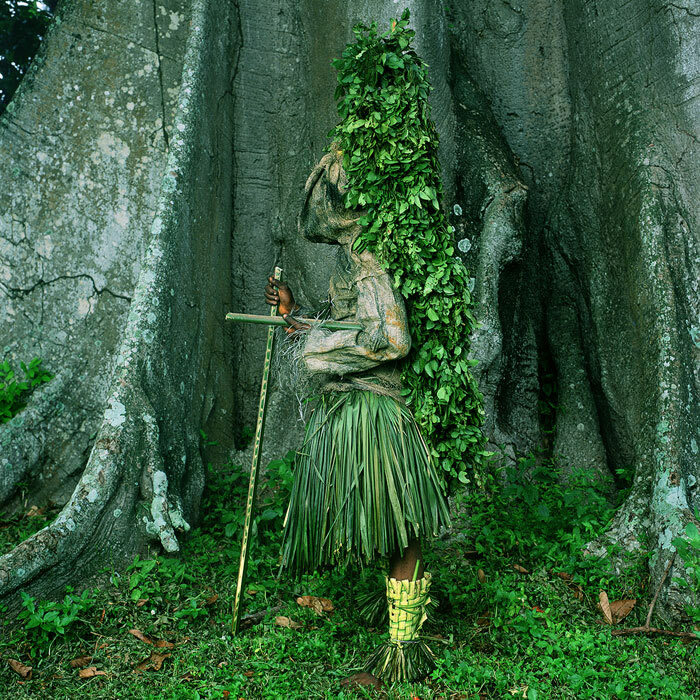 On one hand some elements stay traditional, for example costumes made out of leaves and grass, as they always have been. 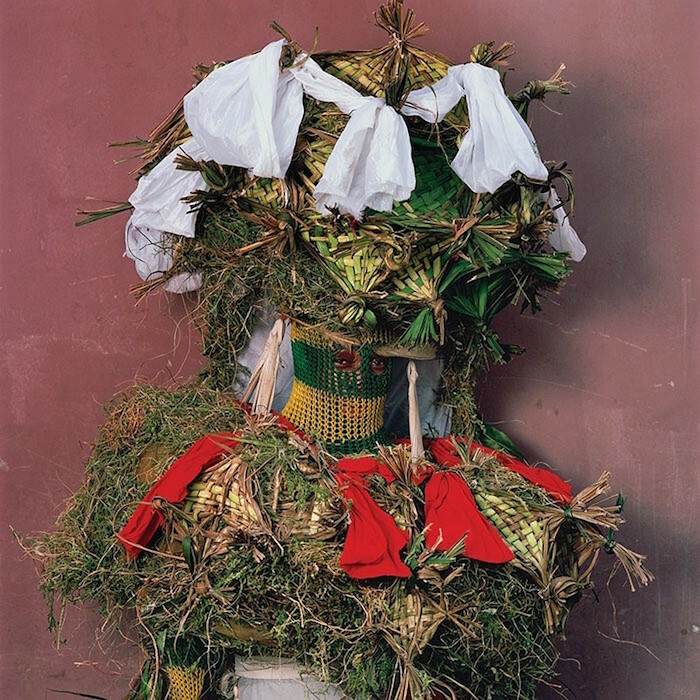 On the other hand some costumes include now contemporary objects, for example “costumes from Sierra Leone include Christmas ornament decoration”. 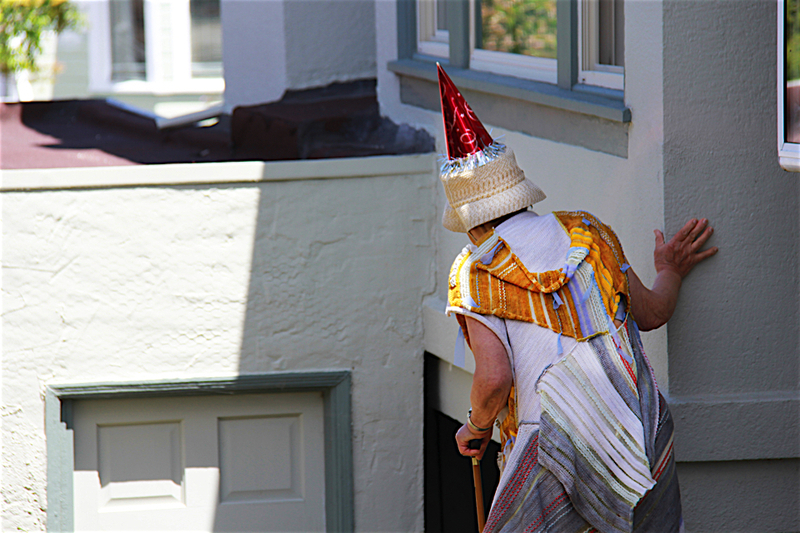 There are a lot of recycled materials used, when costumes of older times are refurbished. When it is something historical, old and sacred they do not want to interfere or alter the costume. When she sees something that carries on this tradition, she wonders what is going to happen to the next generation. Is there going to be people to carry this on?